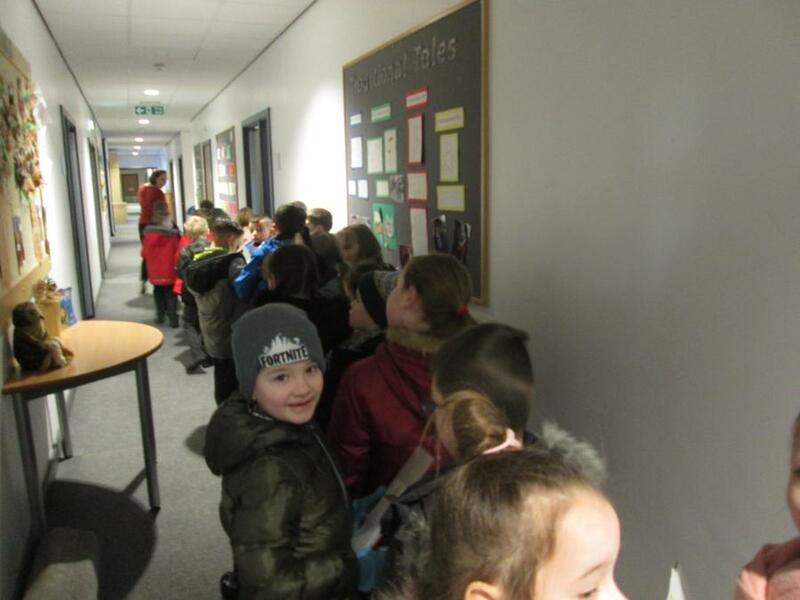 Welcome to Year 2L. 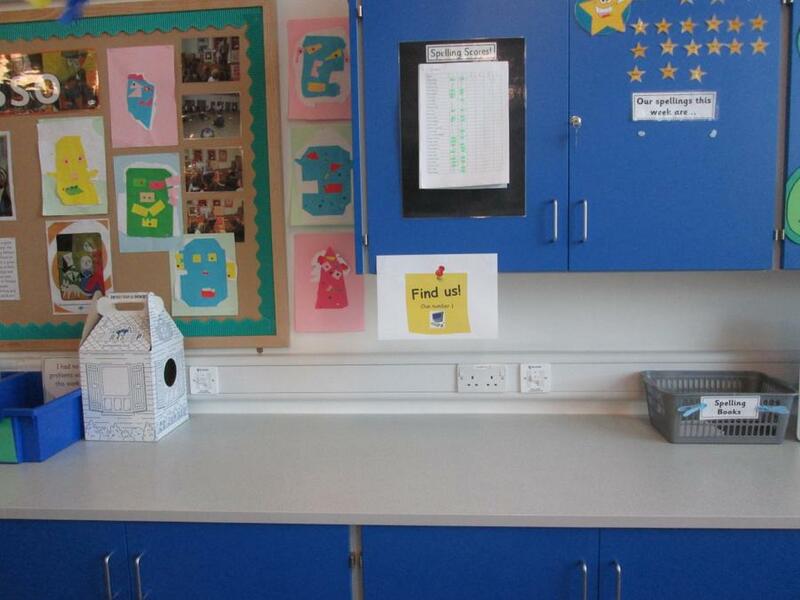 My name is Mrs Locke and I will be working hard to teach you all this year. 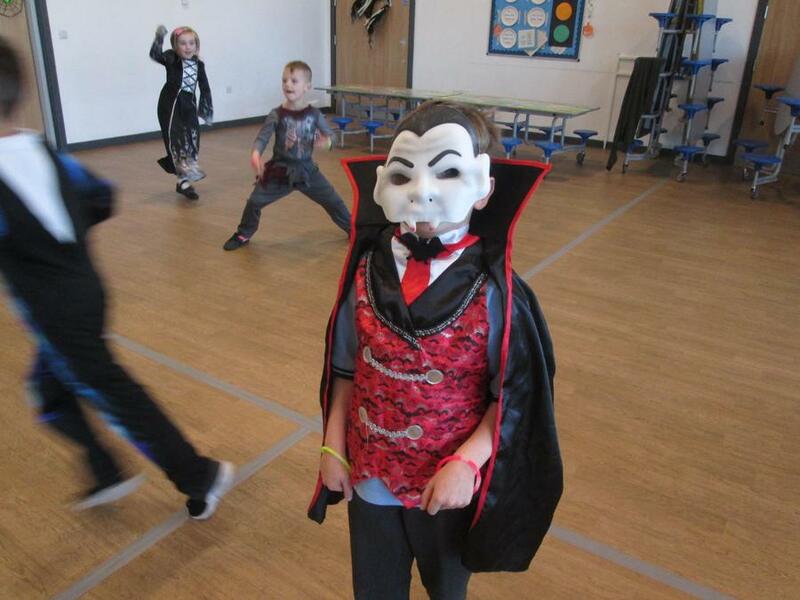 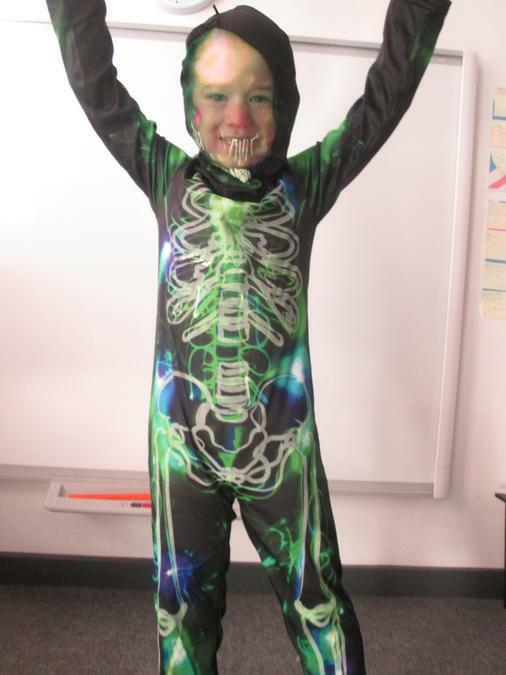 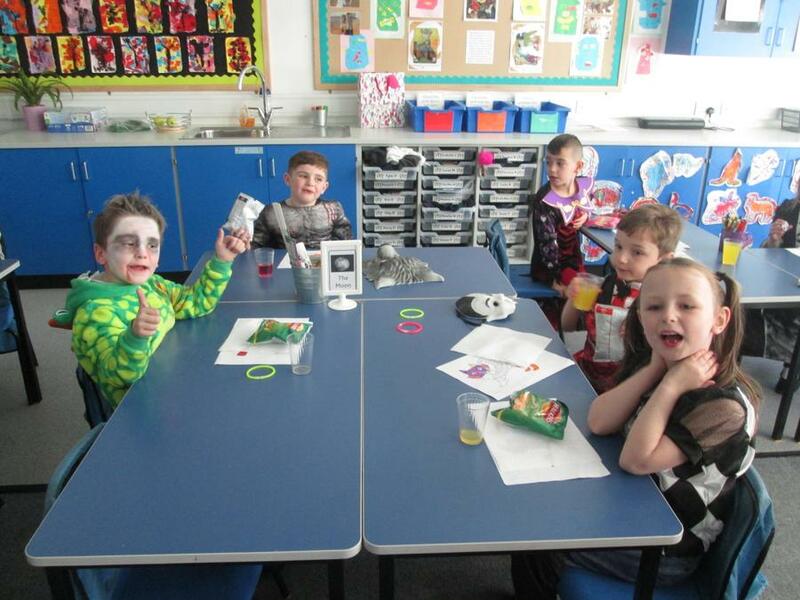 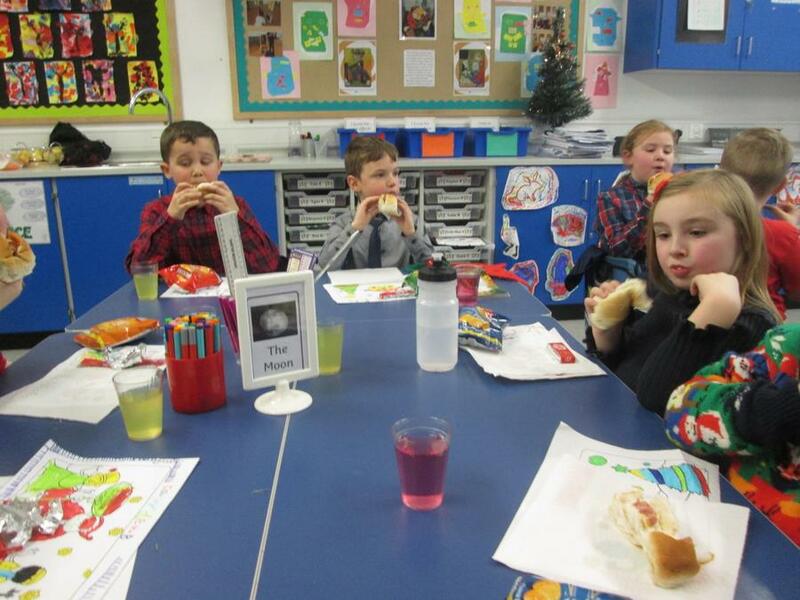 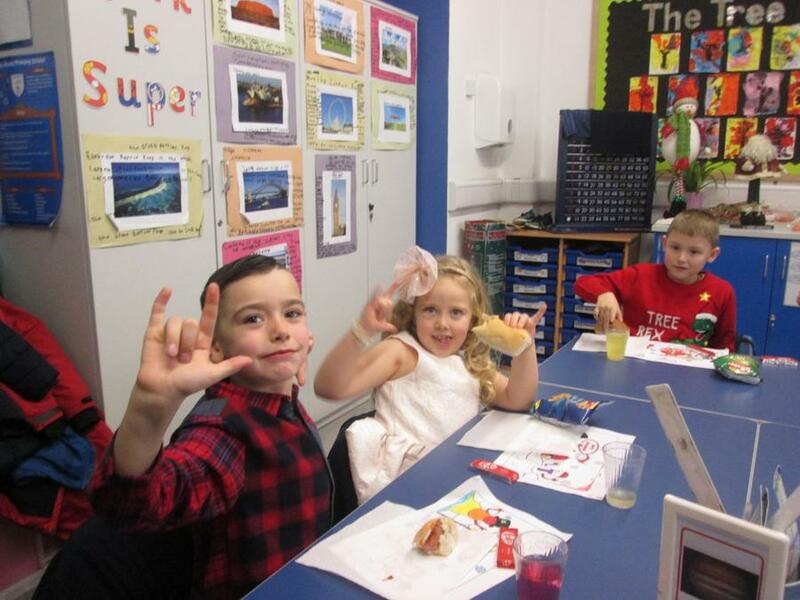 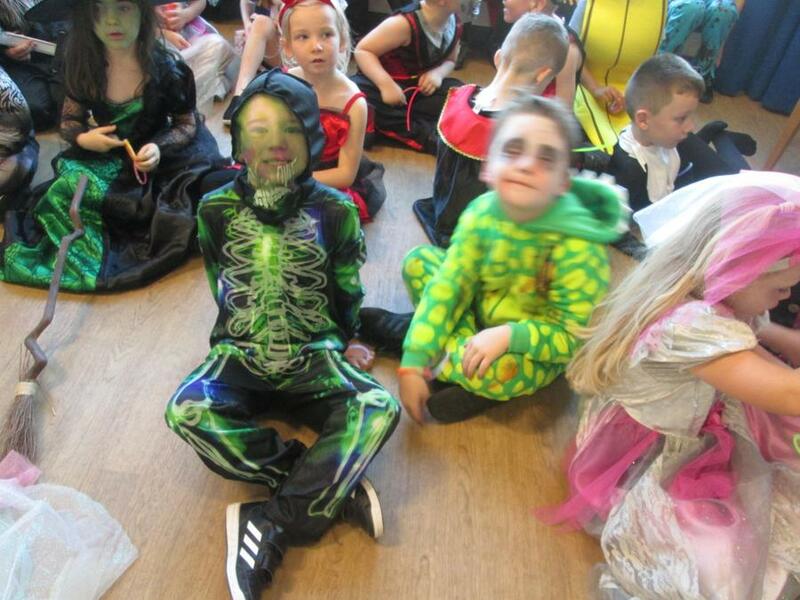 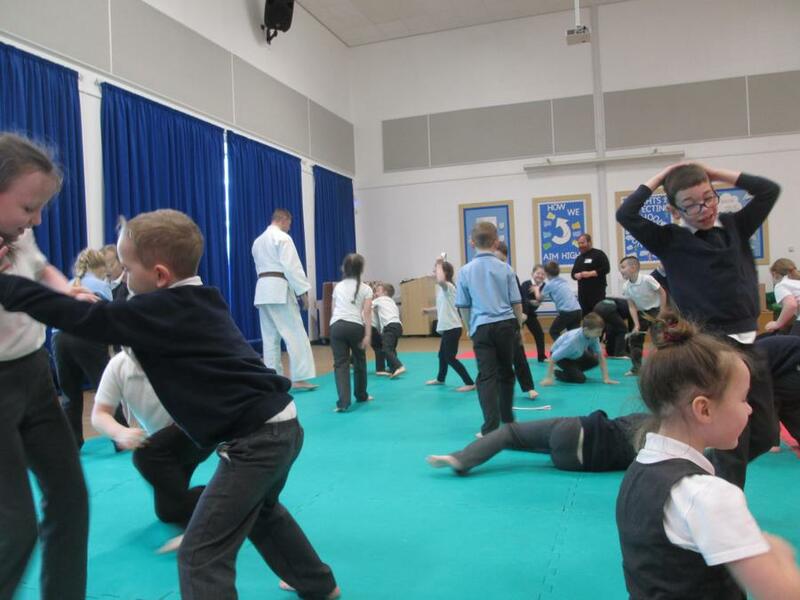 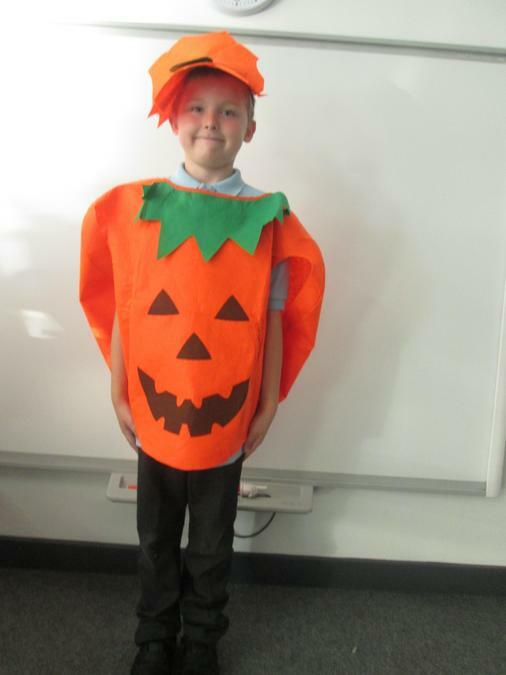 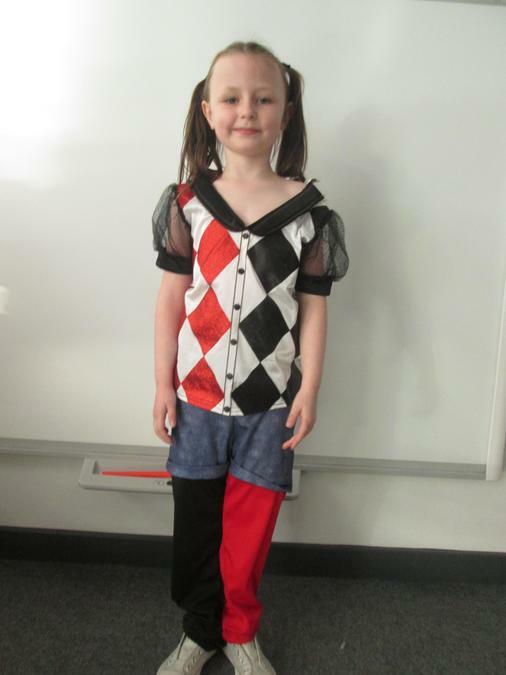 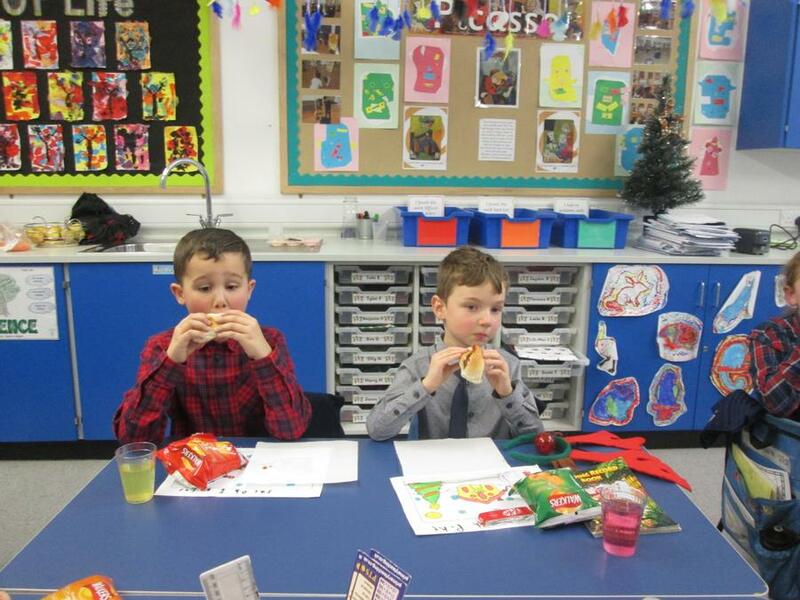 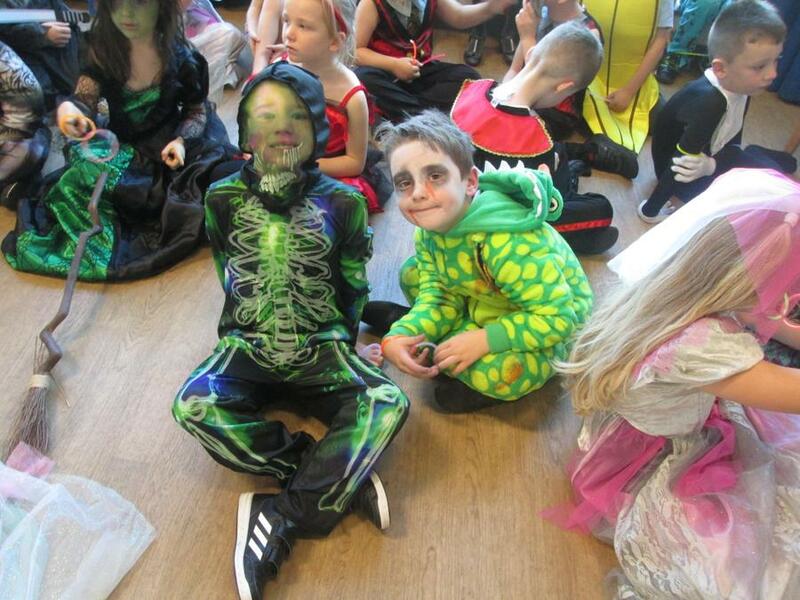 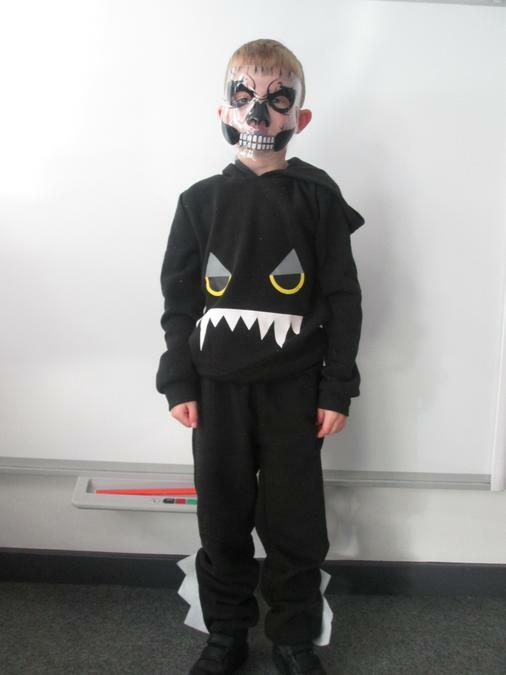 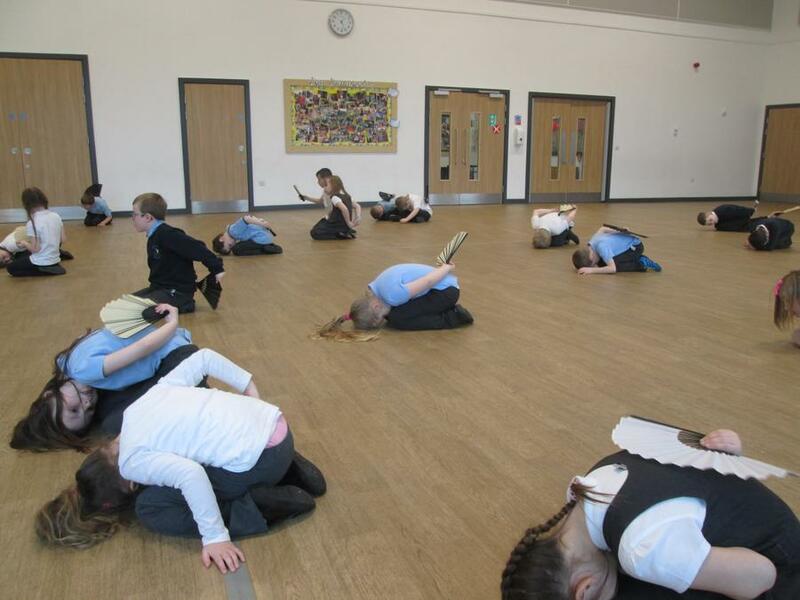 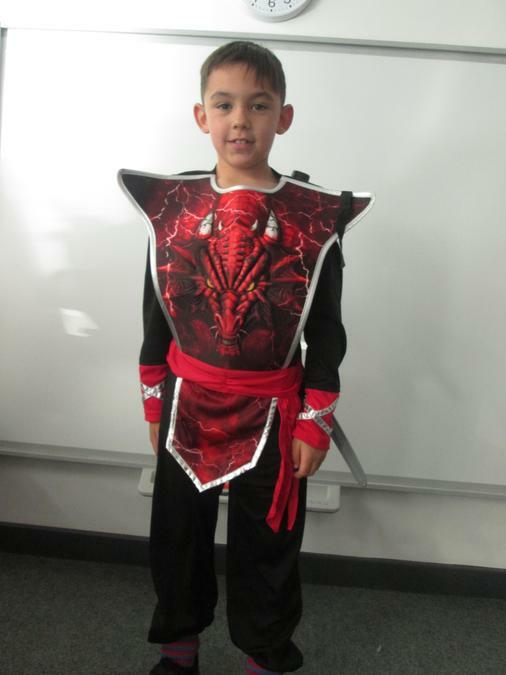 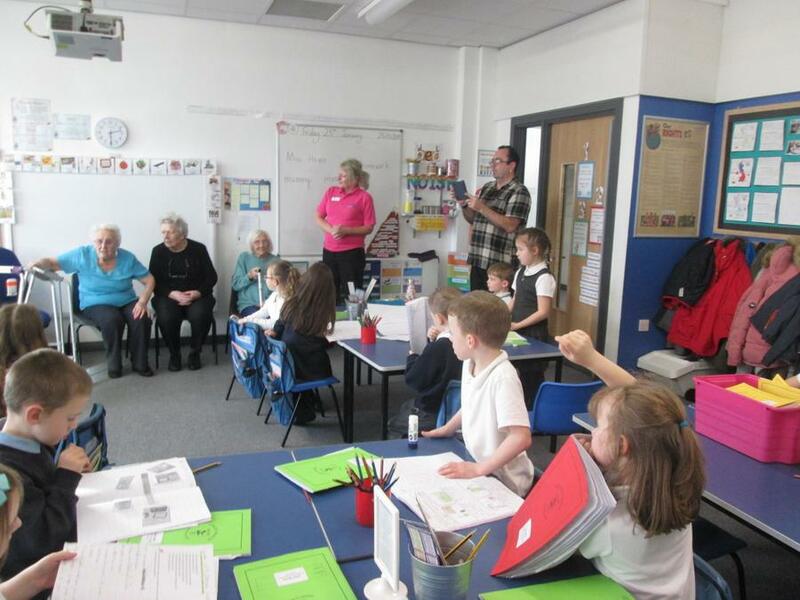 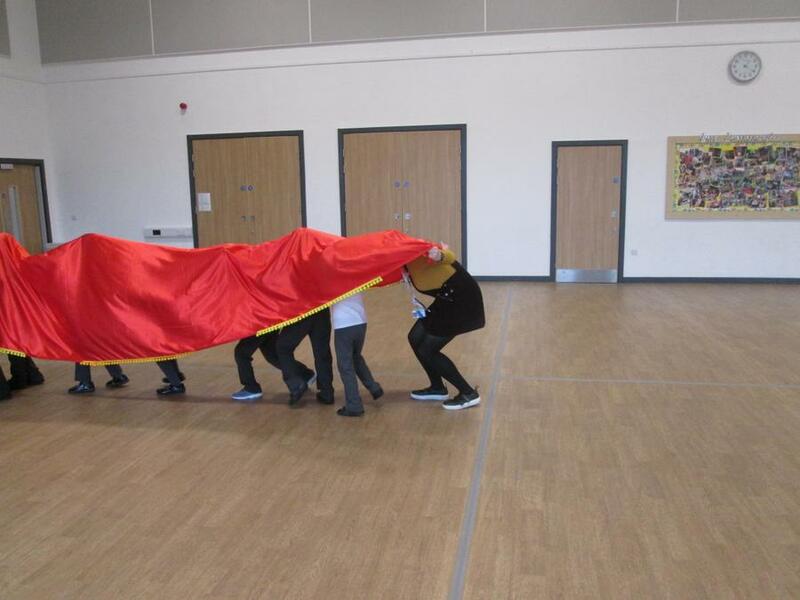 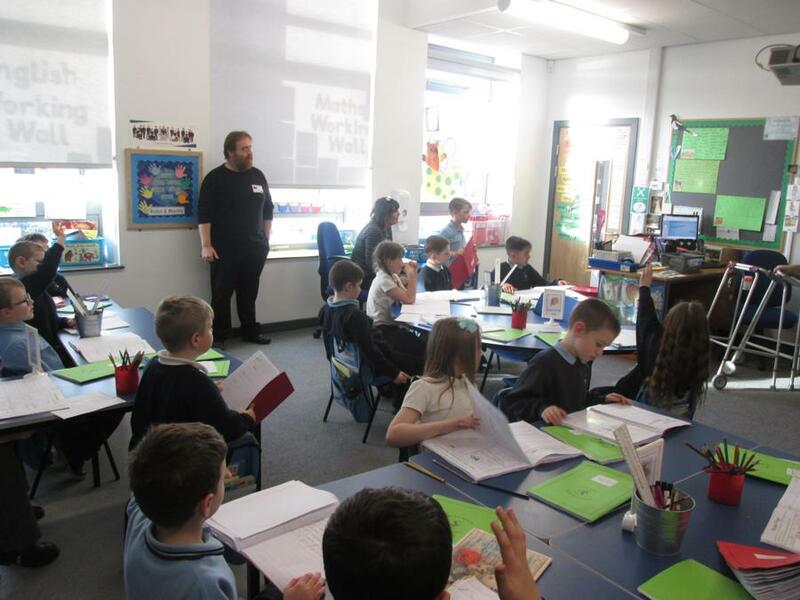 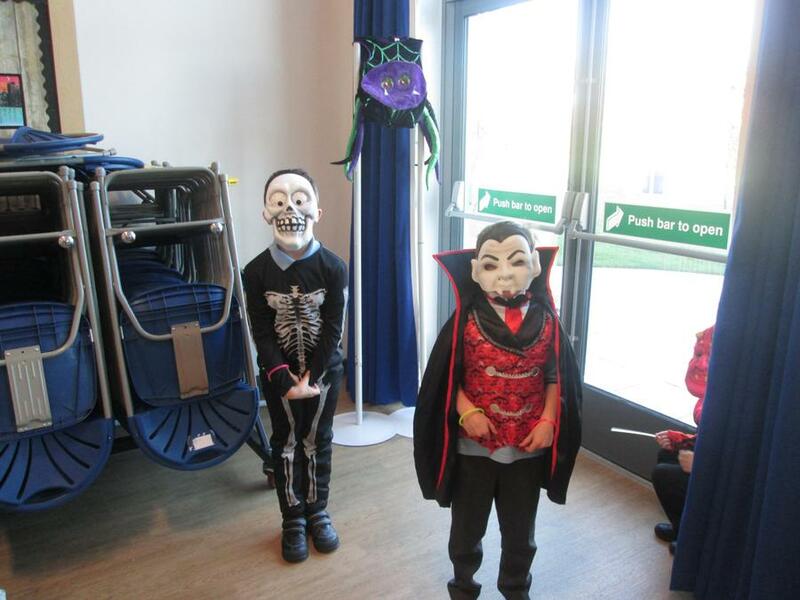 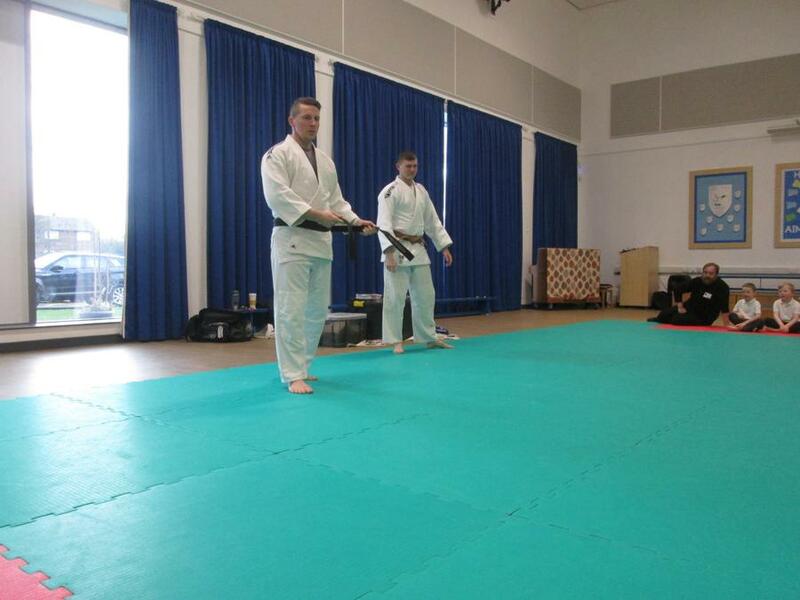 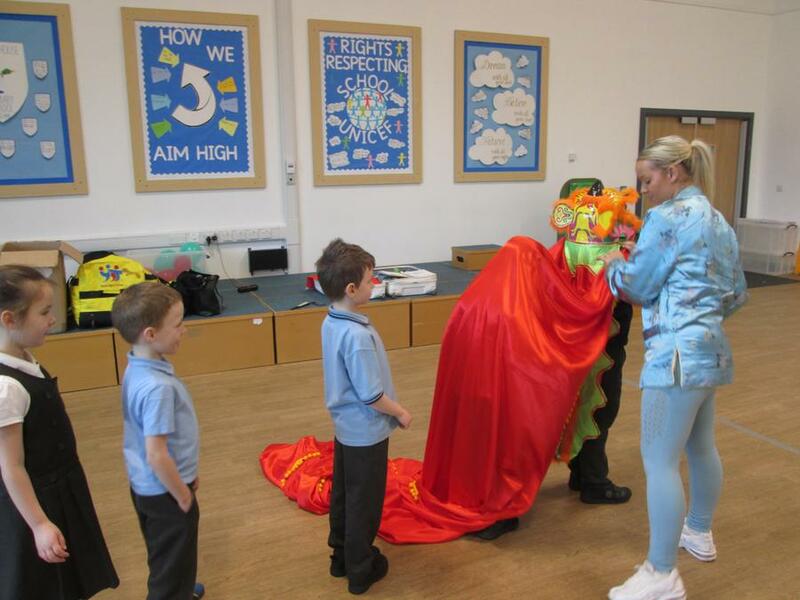 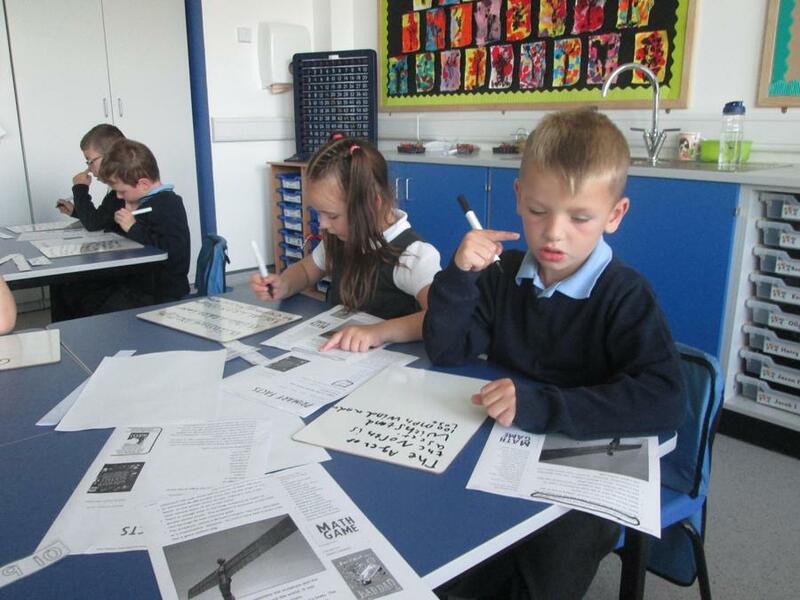 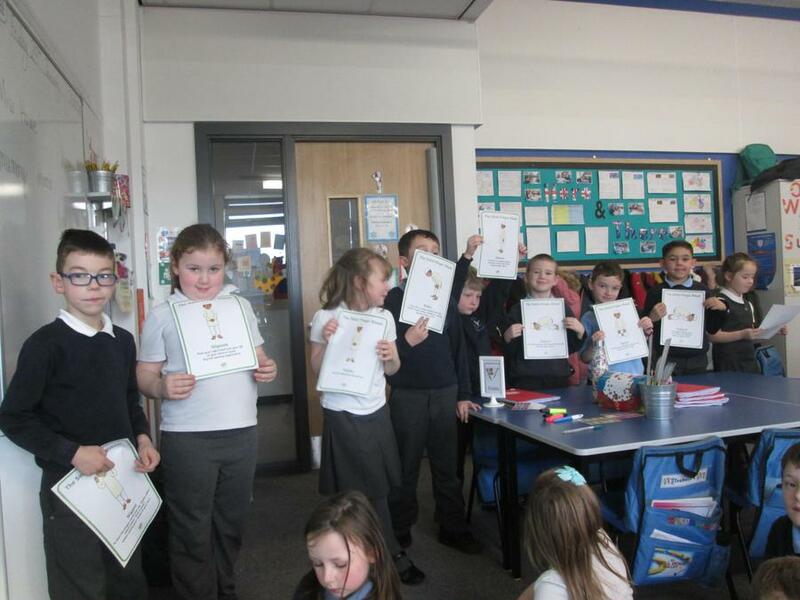 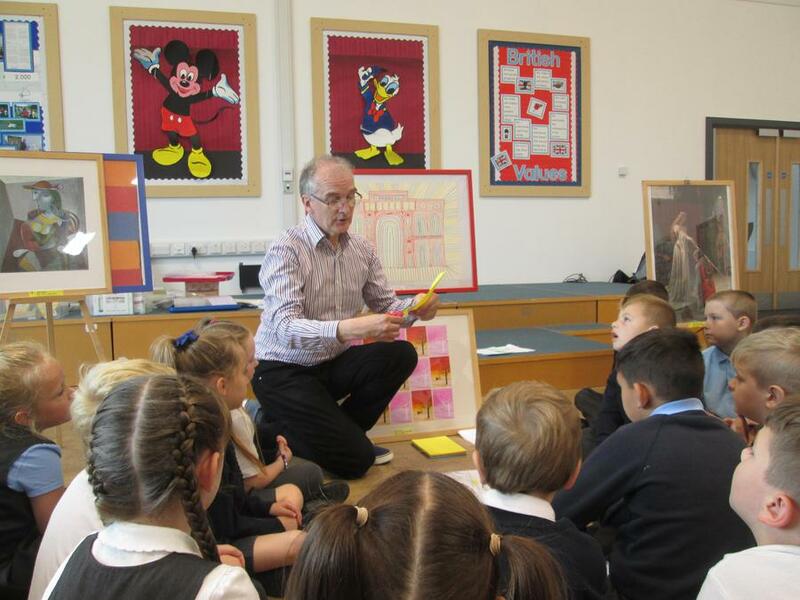 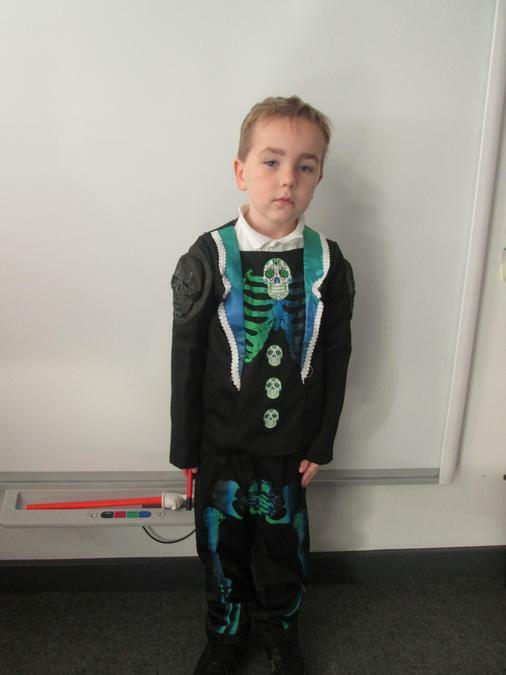 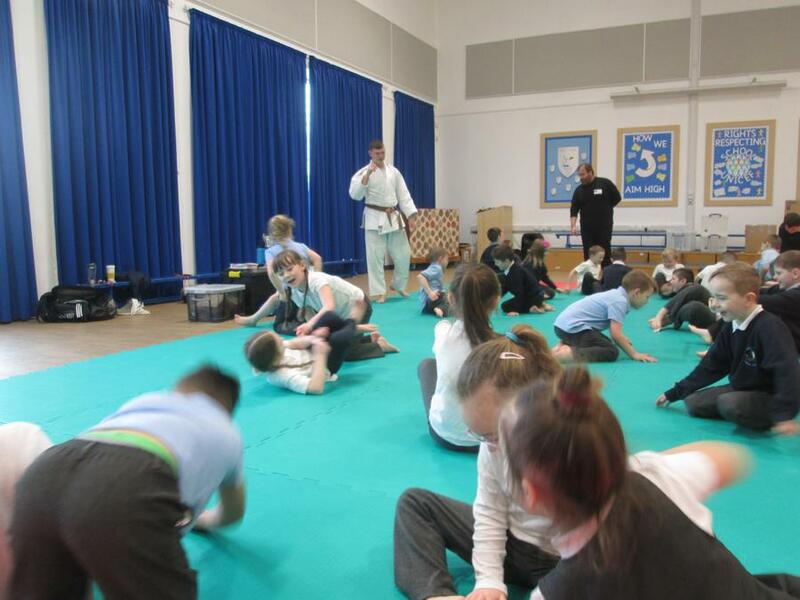 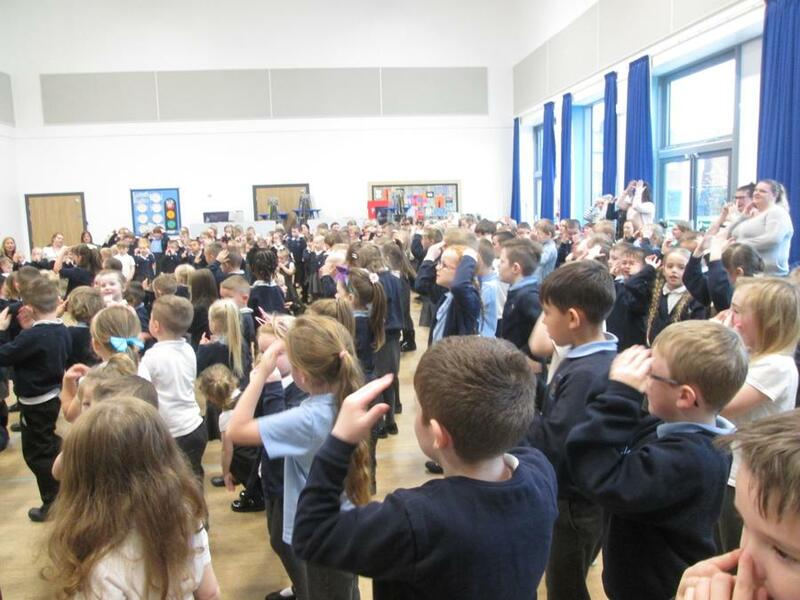 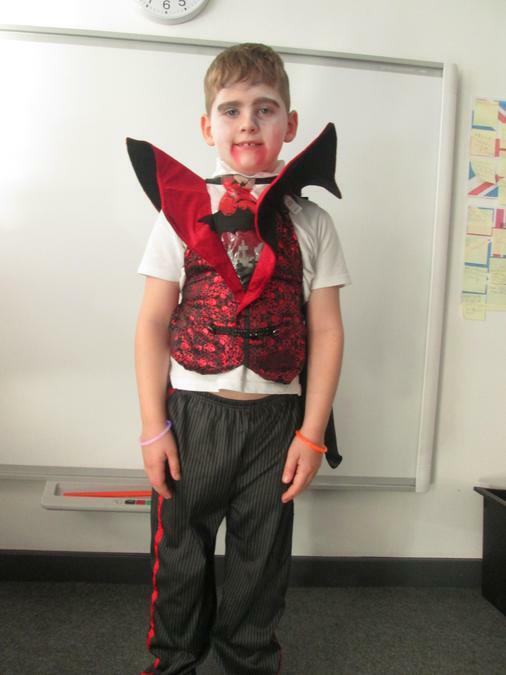 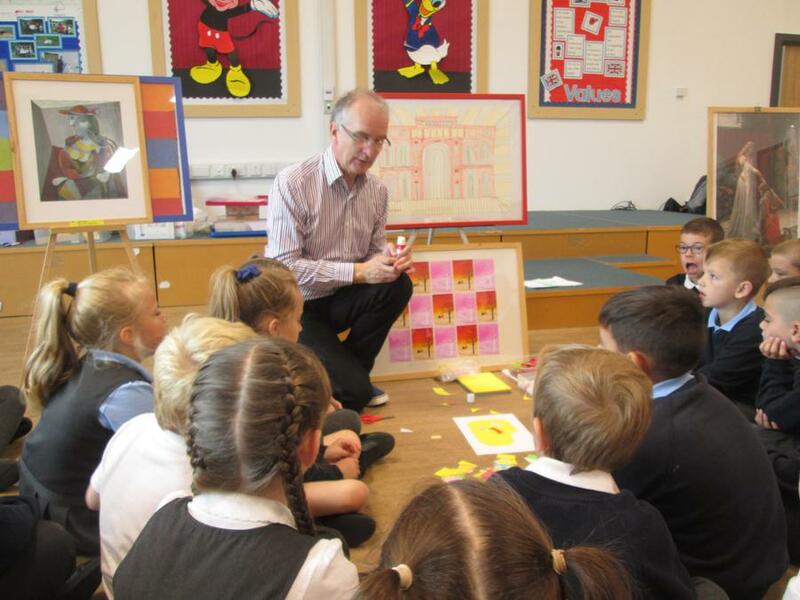 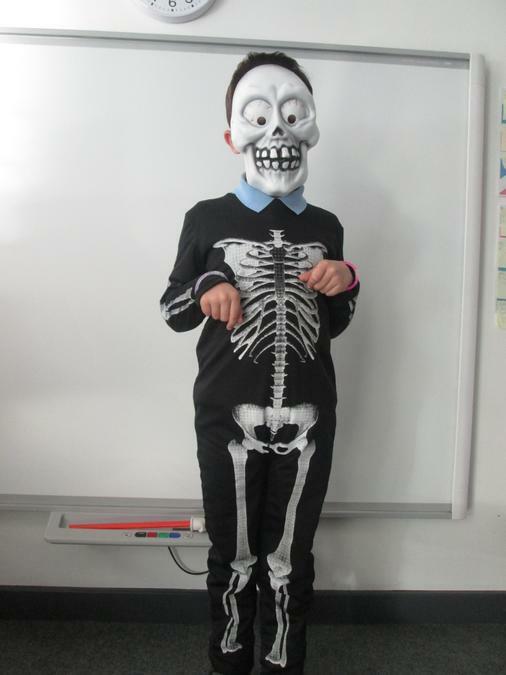 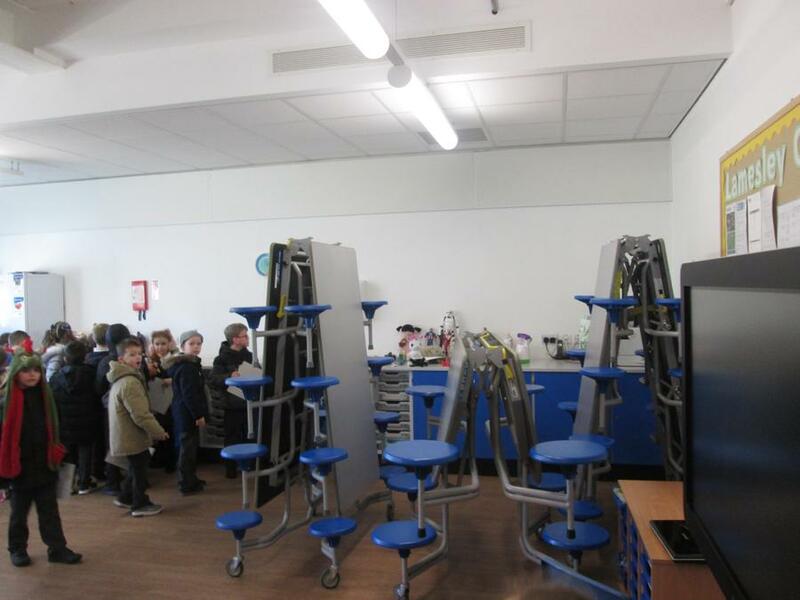 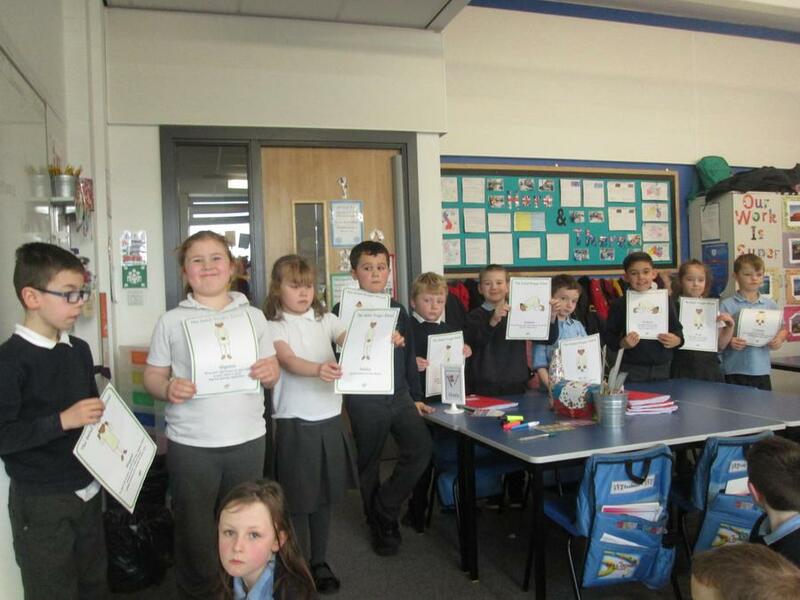 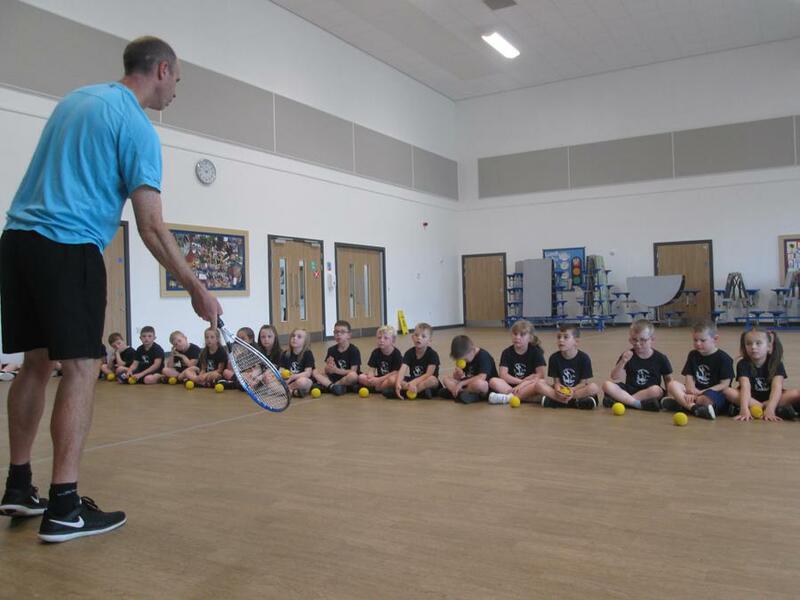 I will teach exciting and engaging lessons through a range of practical, challenging and fun activities. 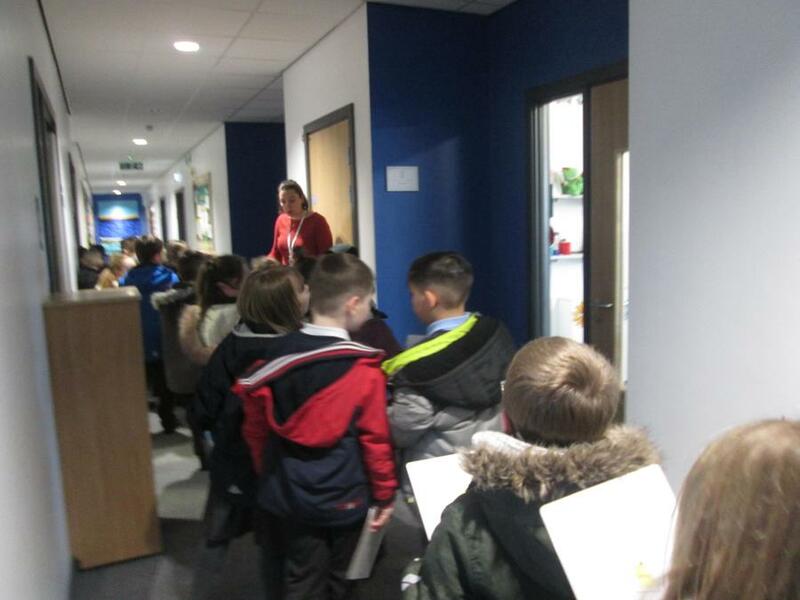 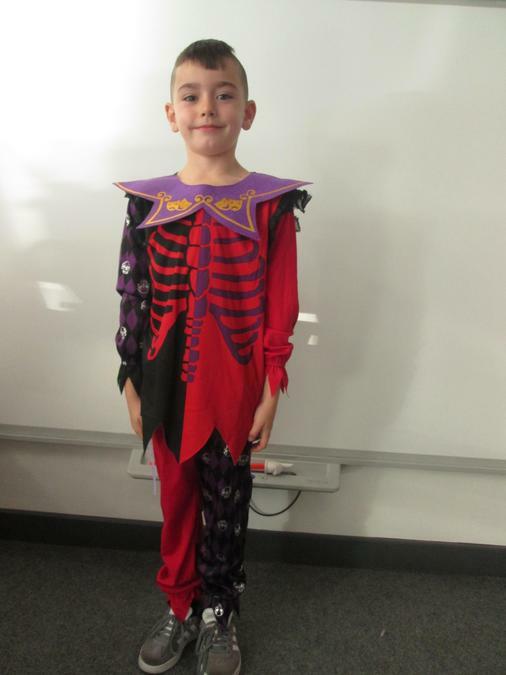 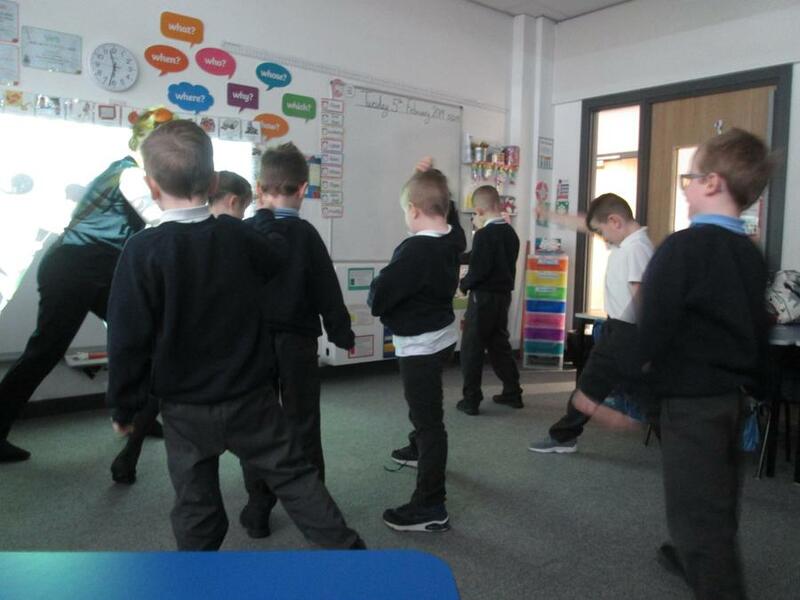 Our class is supported by Mrs Marsden who is dedicated to supporting and nurturing the children of Lingey House Primary. 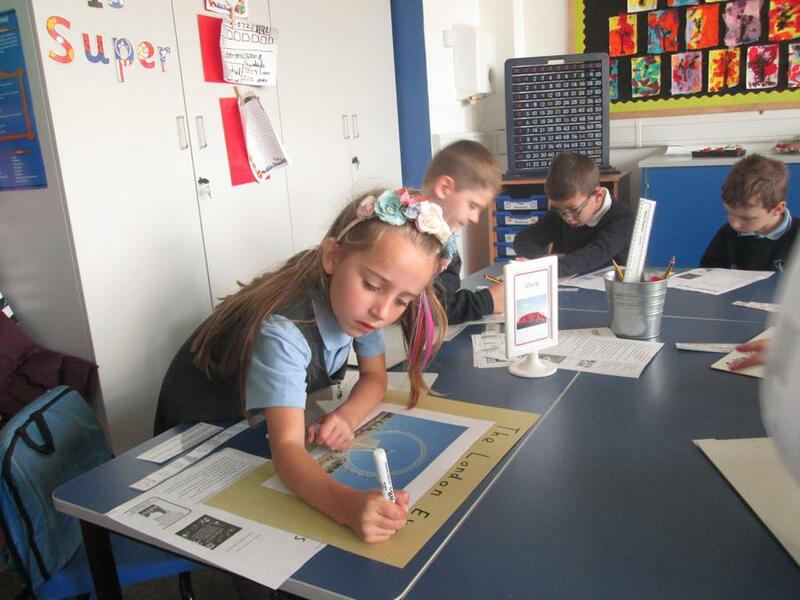 This is your last year in Key Stage 1 before moving on to Key Stage 2. 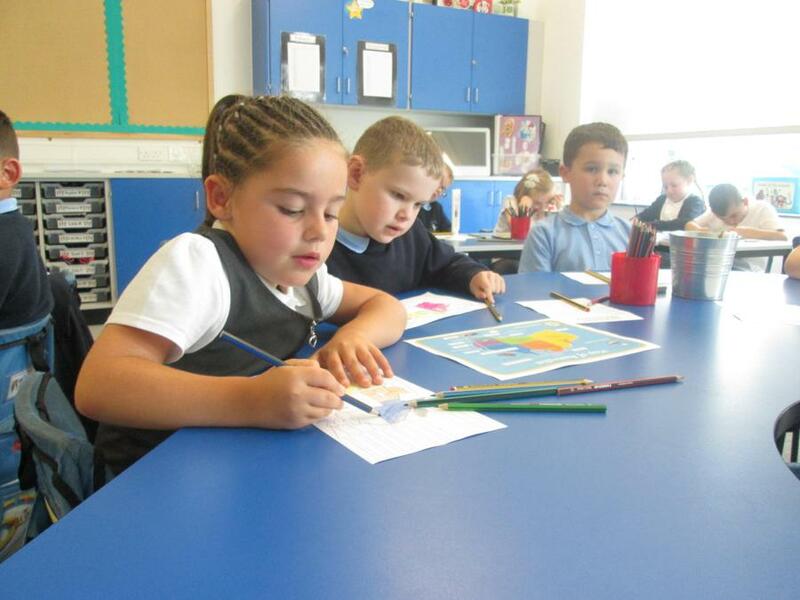 Throughout the year you will be encouraged to become independent learners and outstanding citizens to prepare you for Key Stage 2 and the community. 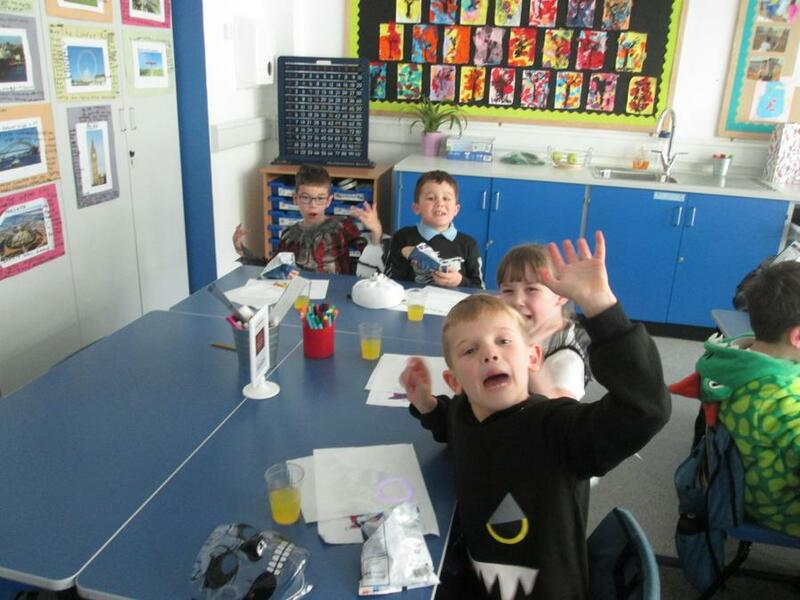 I can't wait to have lots of fun throughout this year and develop your love of learning! 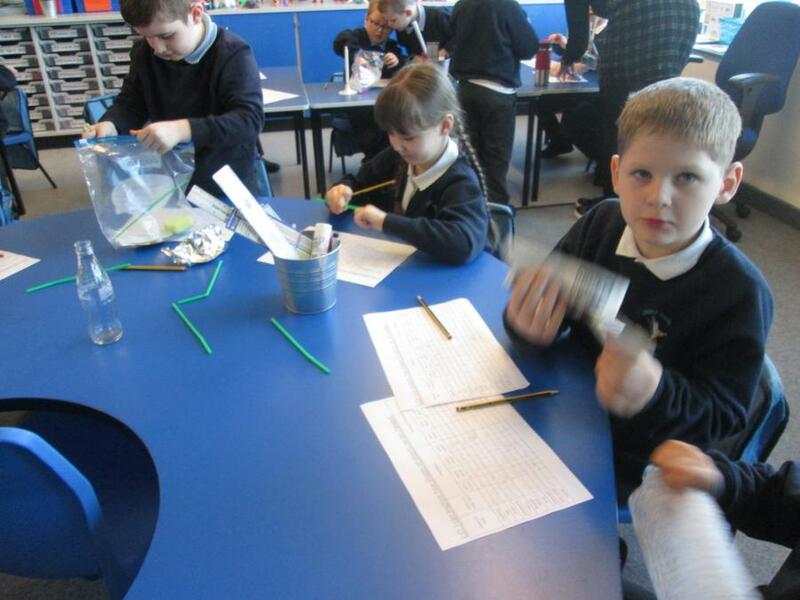 Today in Science we looked closer at ice and how this material can be changed. 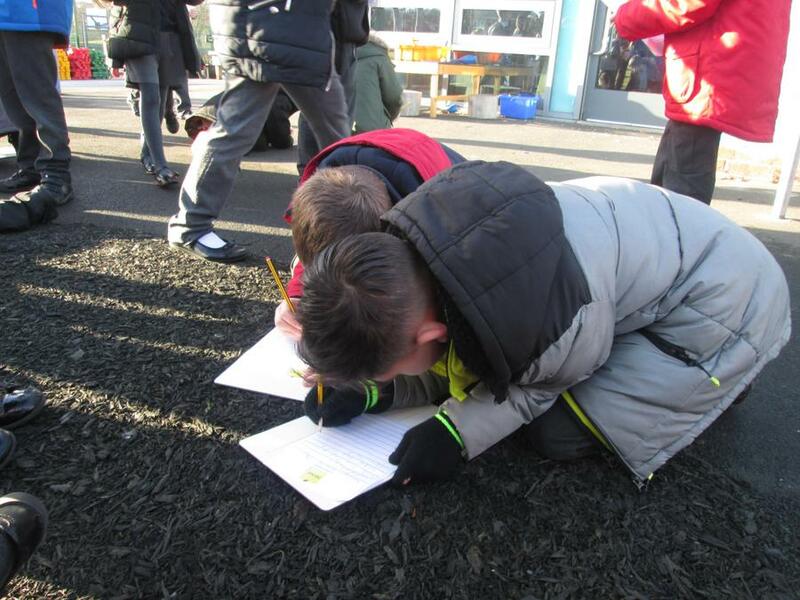 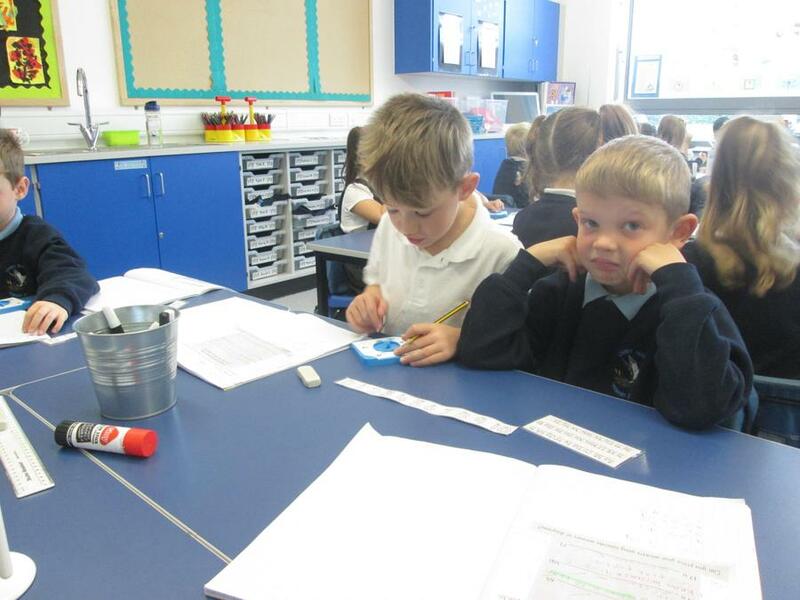 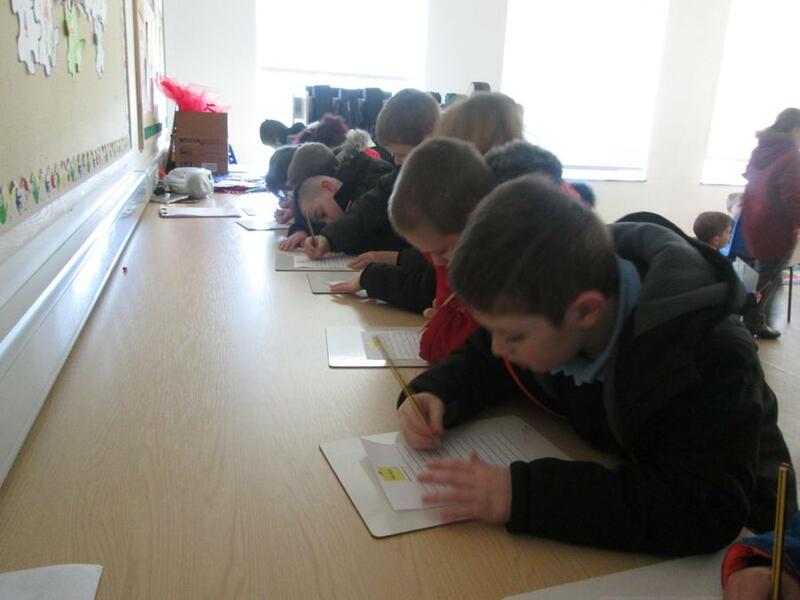 We used the words melting, heating, warming, solid and liquid to describe what we know can happen to ice and then wrote some lovely sentences that we want to share with Miss Clarke in Year 3-we know that she will be really impressed! 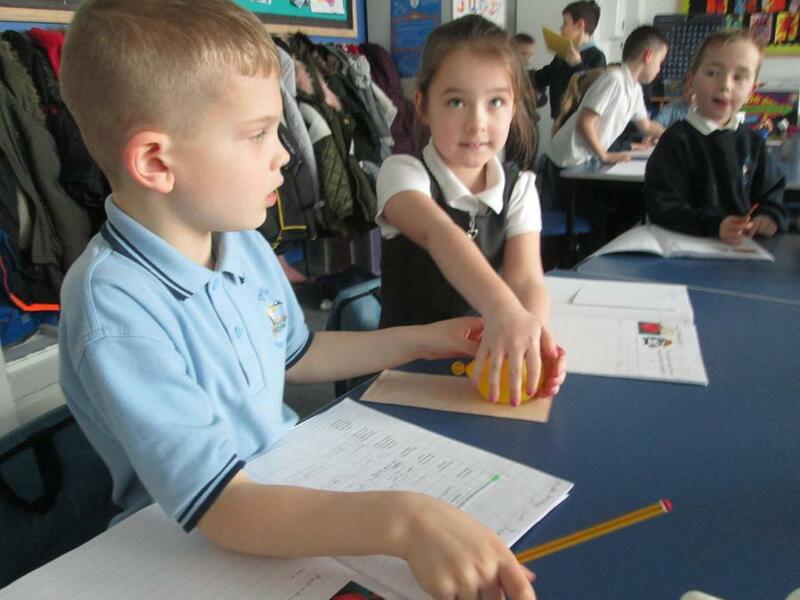 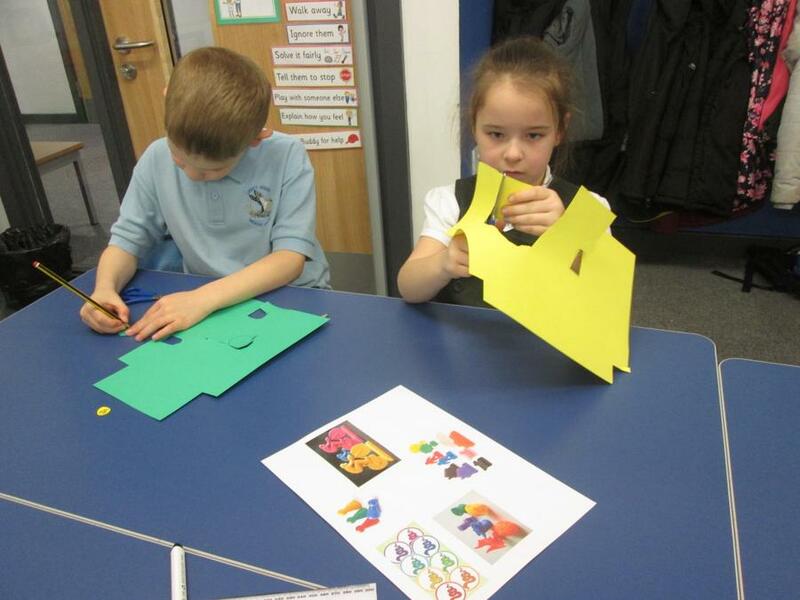 This morning in Maths Miss Howe set us a challenge thinking about our new topic of shapes. 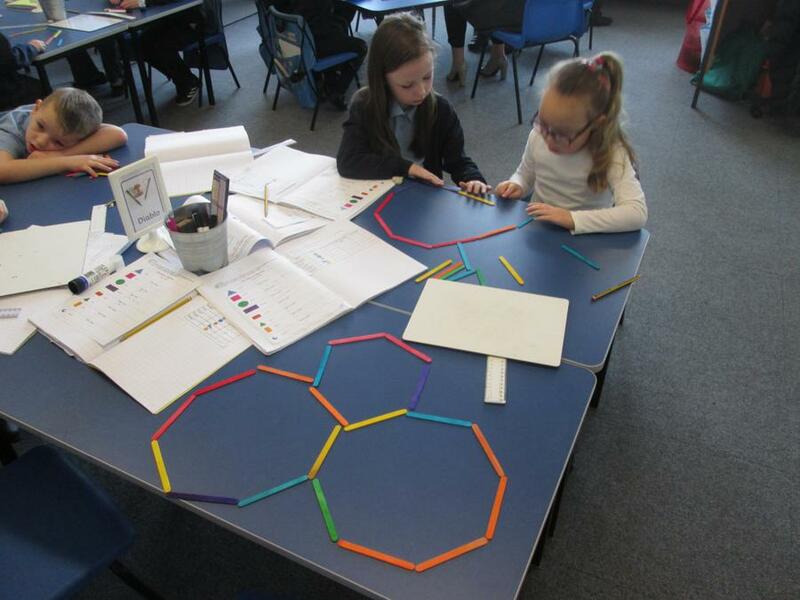 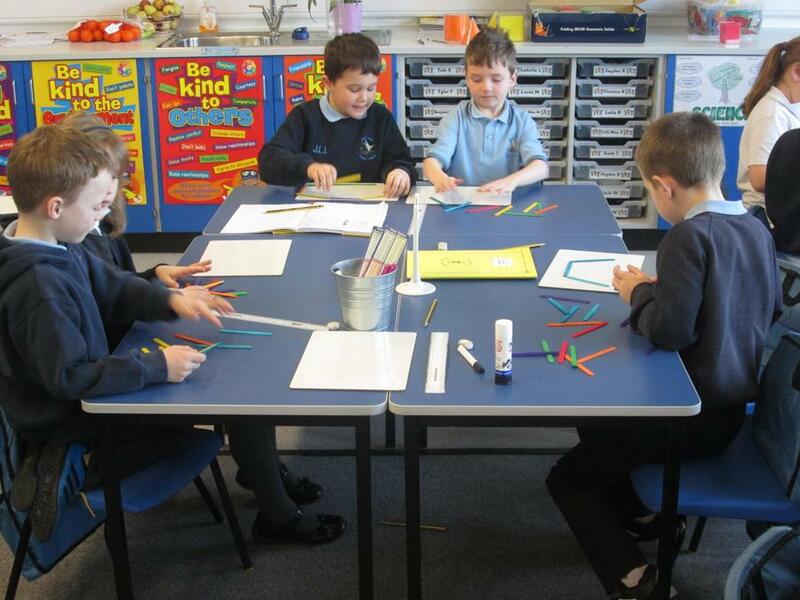 Working in pairs we used 18 lolly pop sticks to see how many octagon shapes we could make. 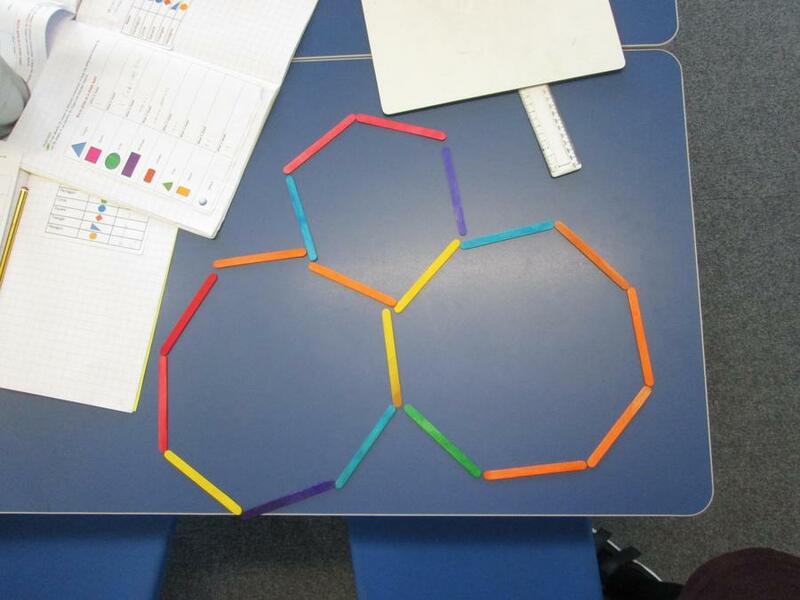 We remembered that an octagon had 8 sides and then set about completing our challenge! 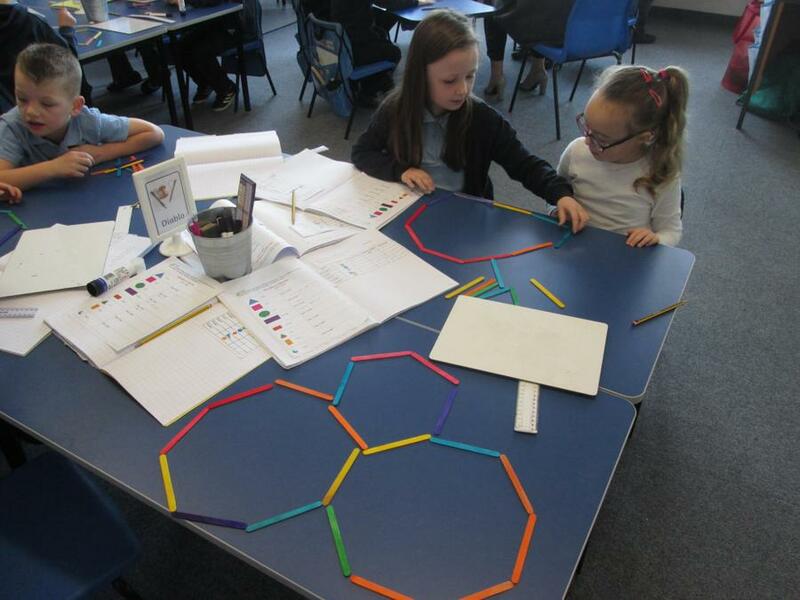 It was pretty tricky at first but using the shapes to help we finally found a way to make 2 octagons with 2 sticks remaining and then found a way to make 3 solid octagons but we would need 19 sticks! 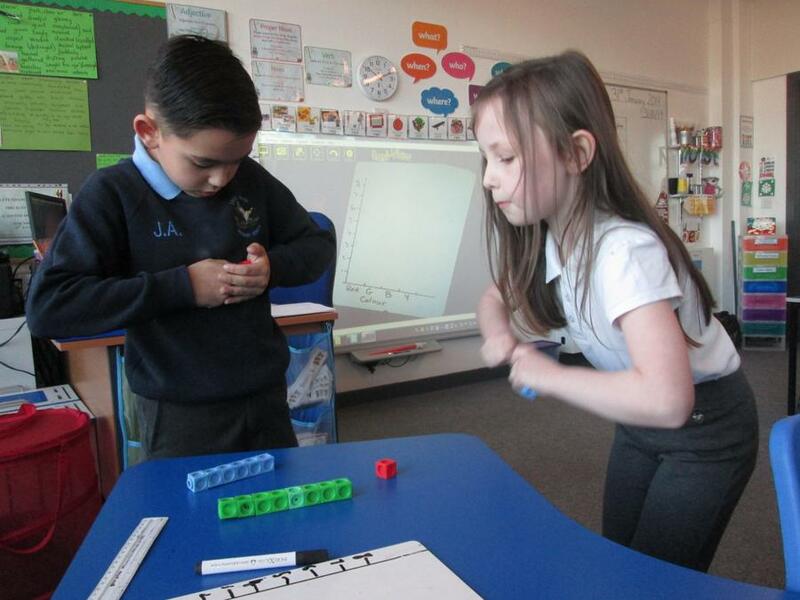 We love a tricky challenge in year 2L! 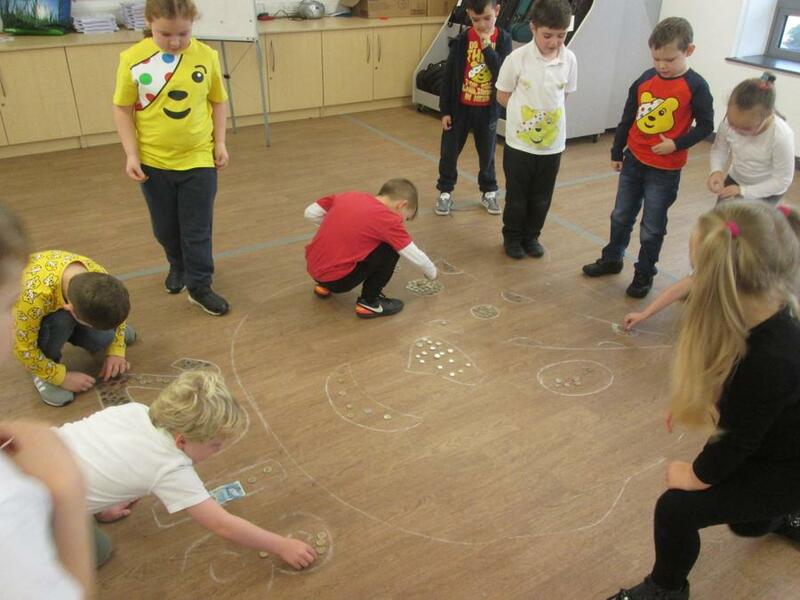 Making our games for year 1C! 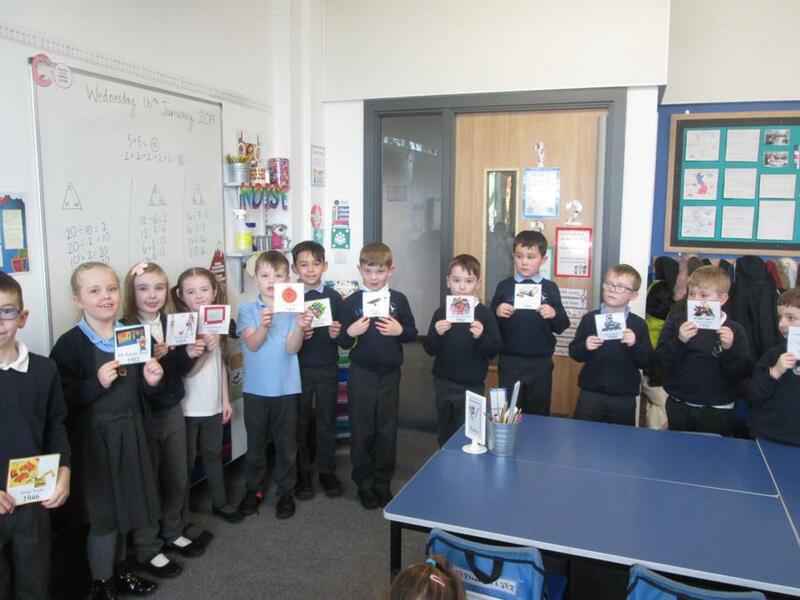 Today in our creative curriculum lesson we spent some time creating or challenge and question cards that we will use on the board games that we are making for year 1. 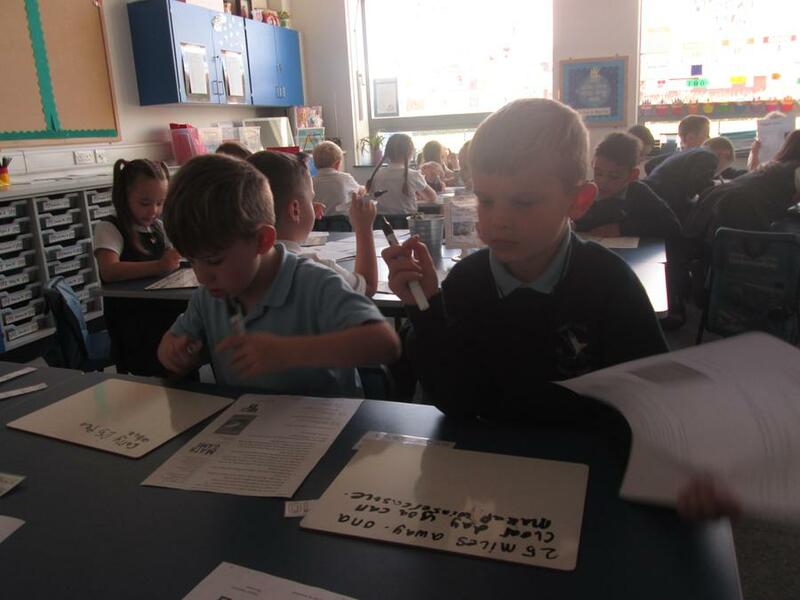 We used our best handwriting and used our planned questions from last week thinking carefully about perfect punctuation! 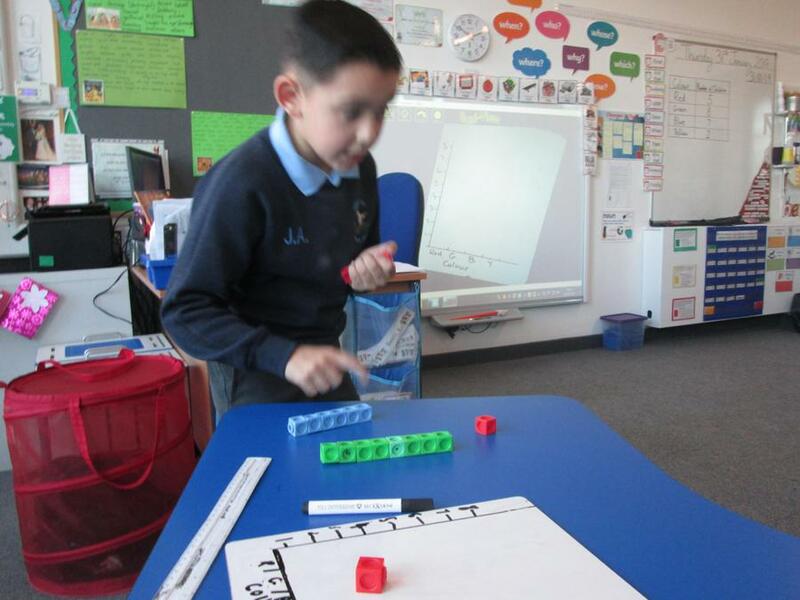 Then, we made some counters to keep a record of where we are on the board. 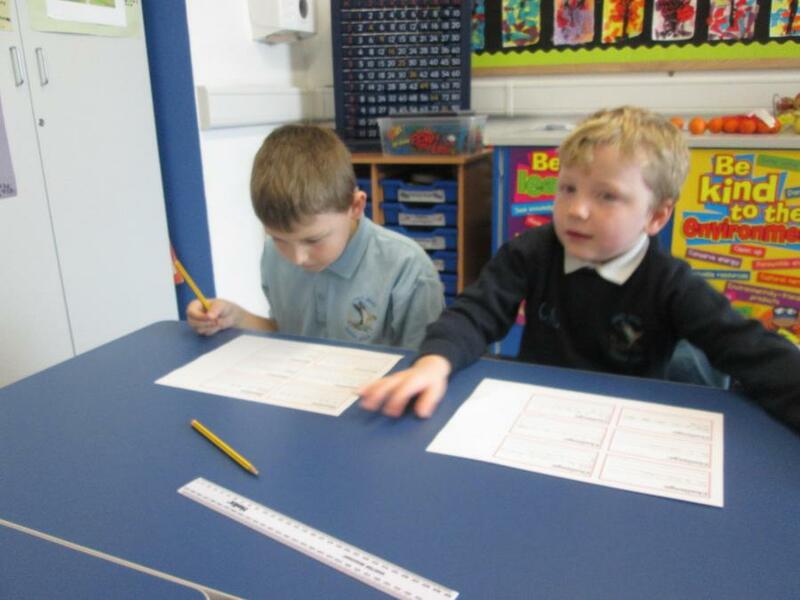 We talked about some of the counters that we use at home, like a dog and a top hat in monopoly or just a flat disc in a game of checkers. 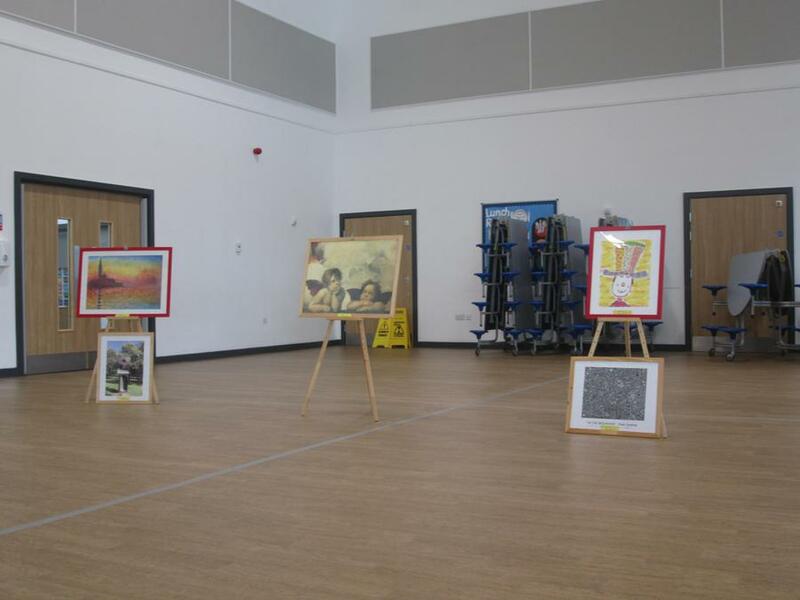 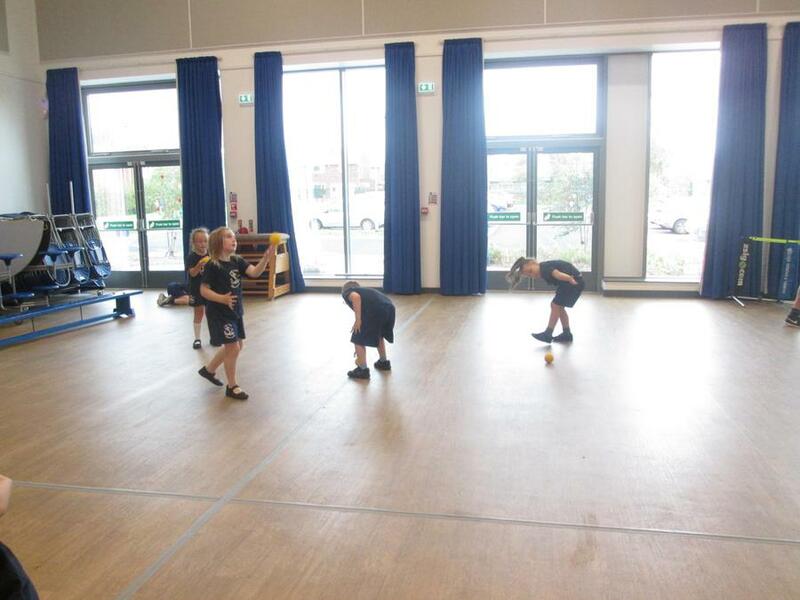 We are ready to invite year 1C to come and play our games now and cant wait to see how they like them! 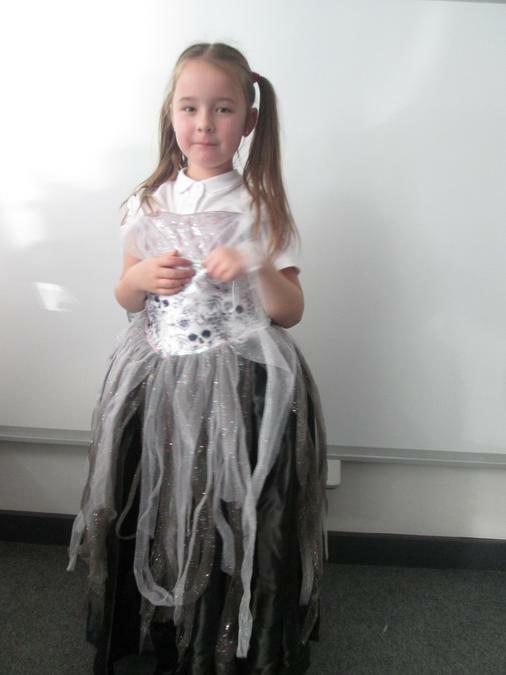 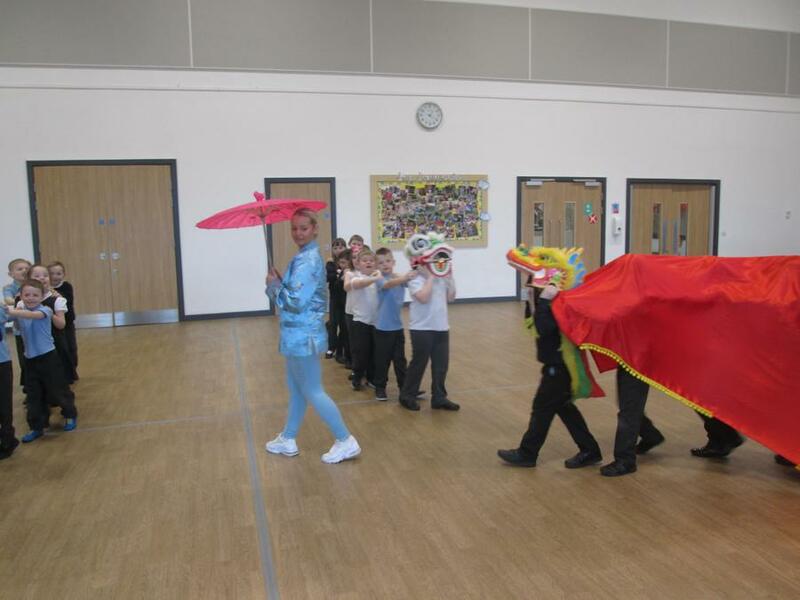 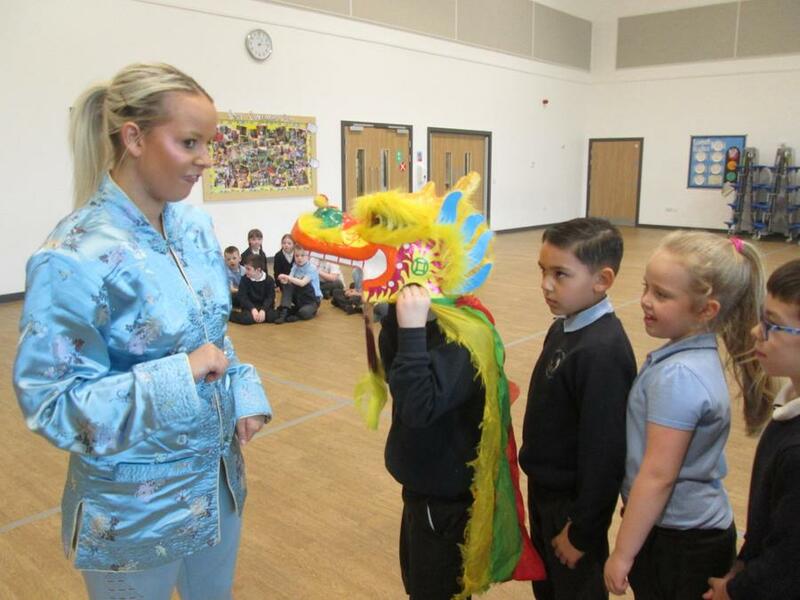 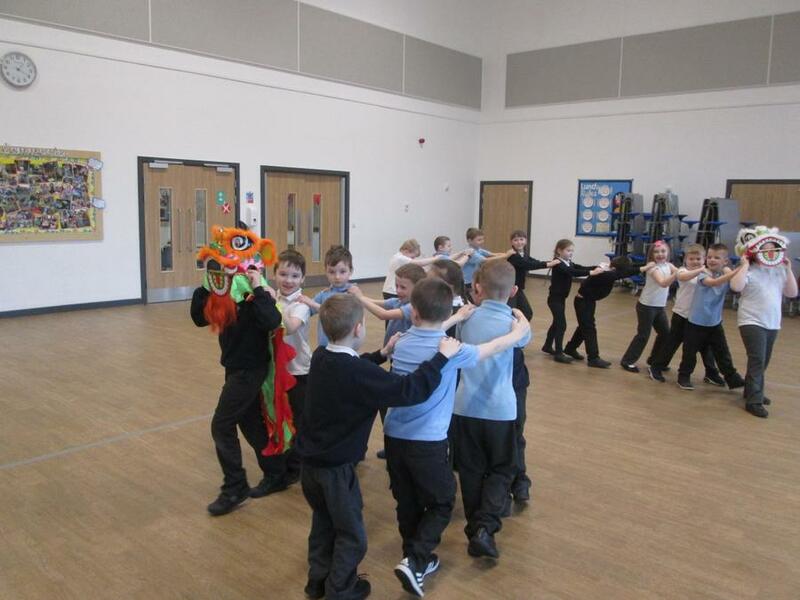 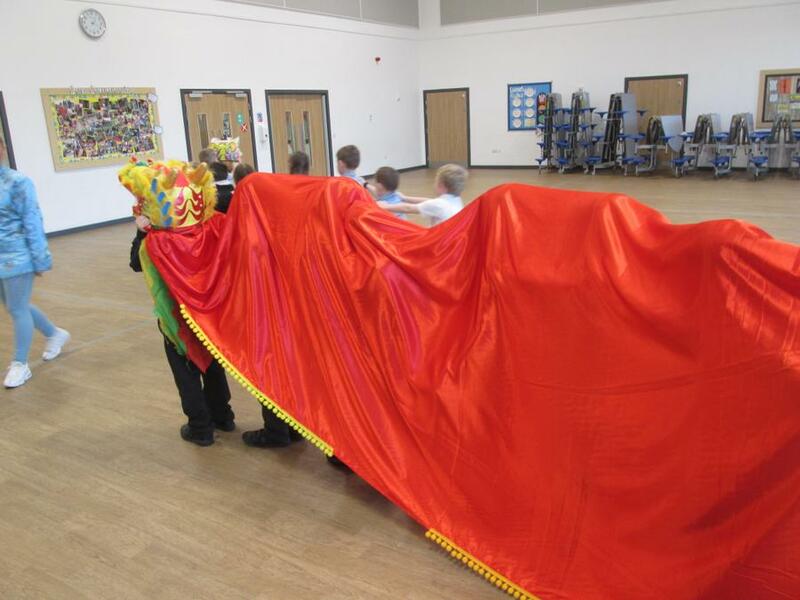 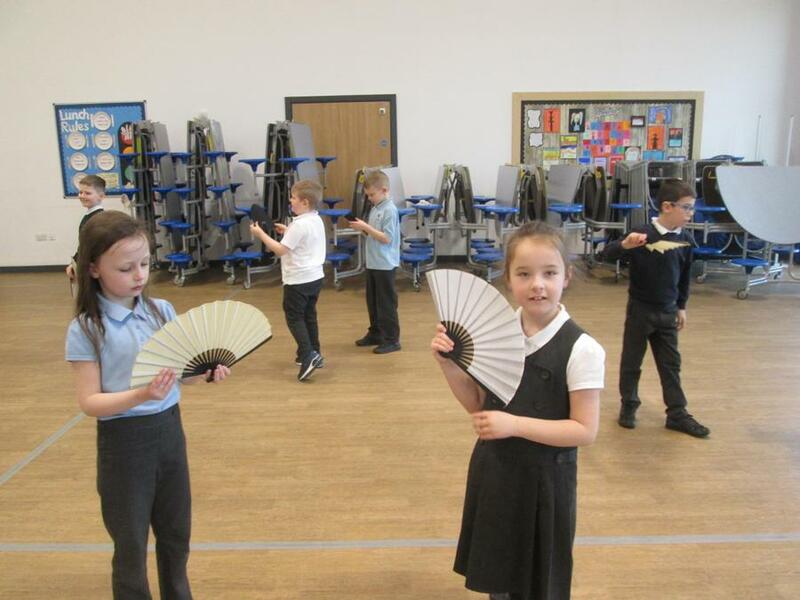 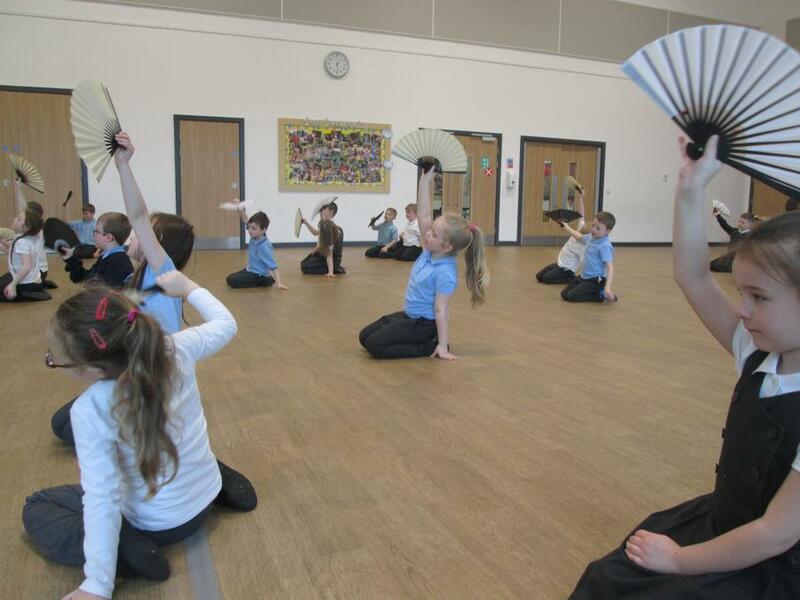 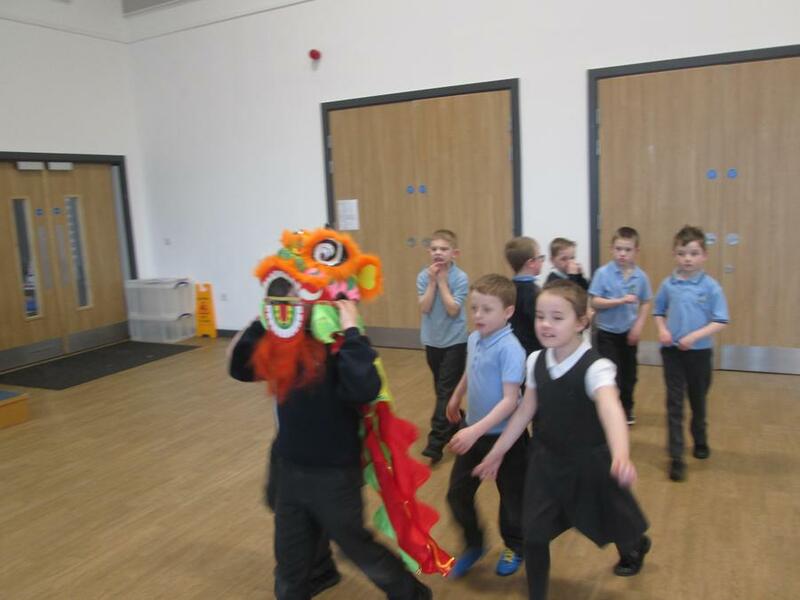 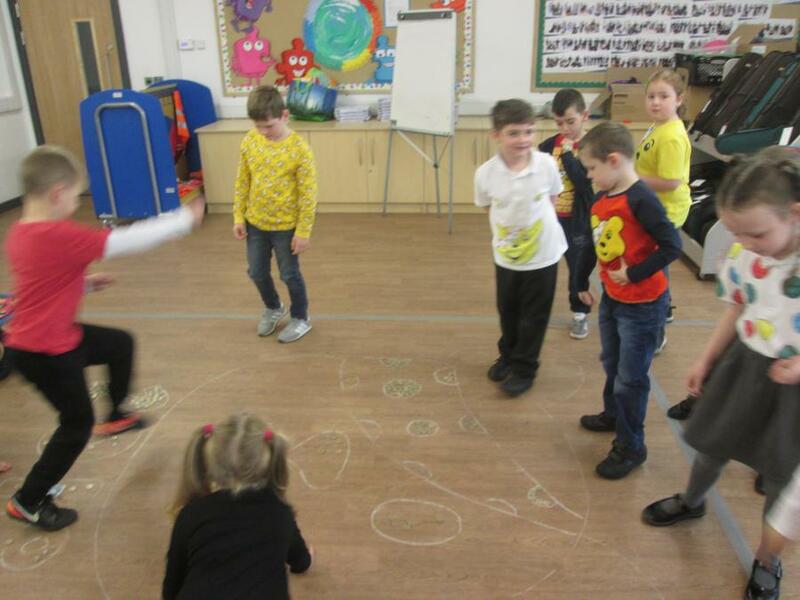 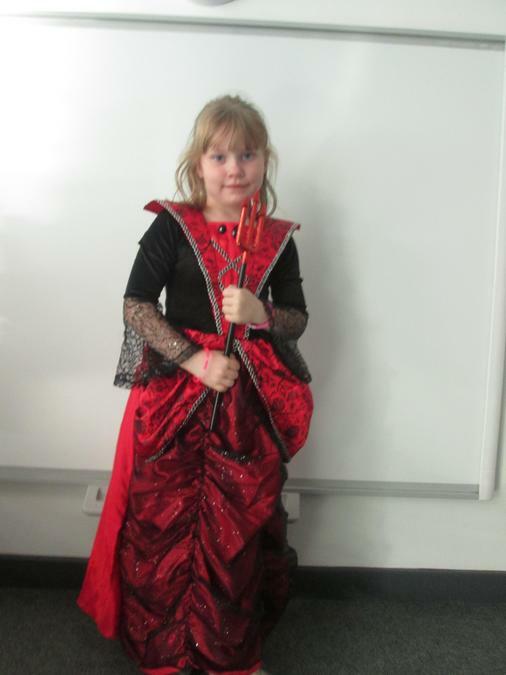 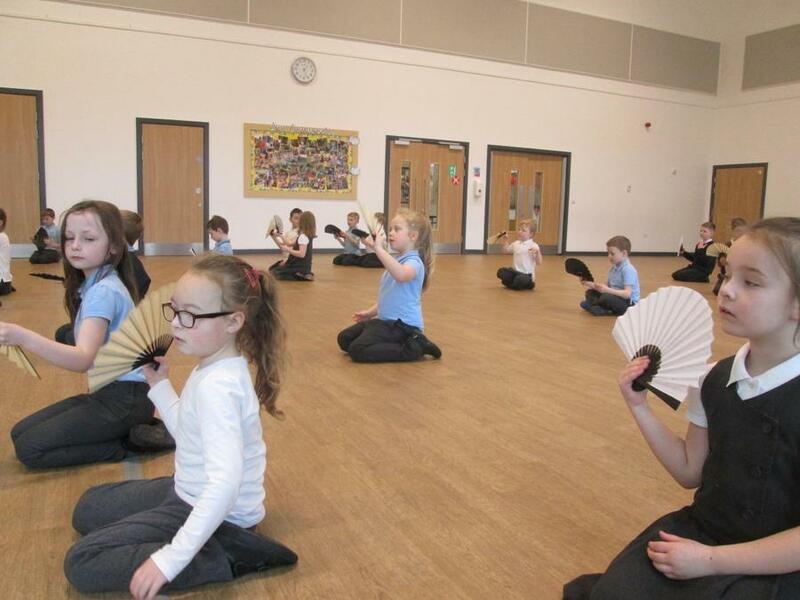 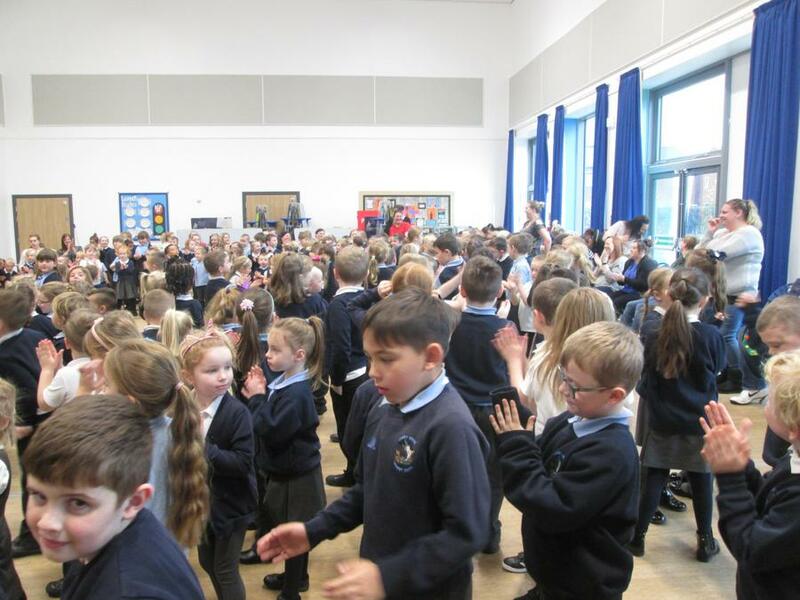 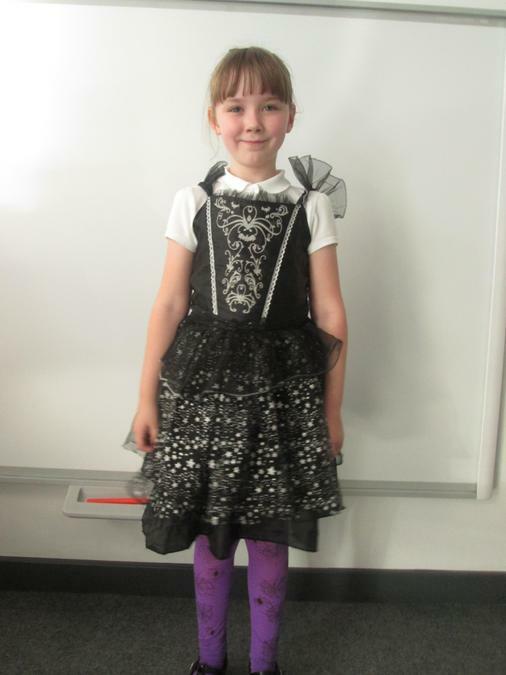 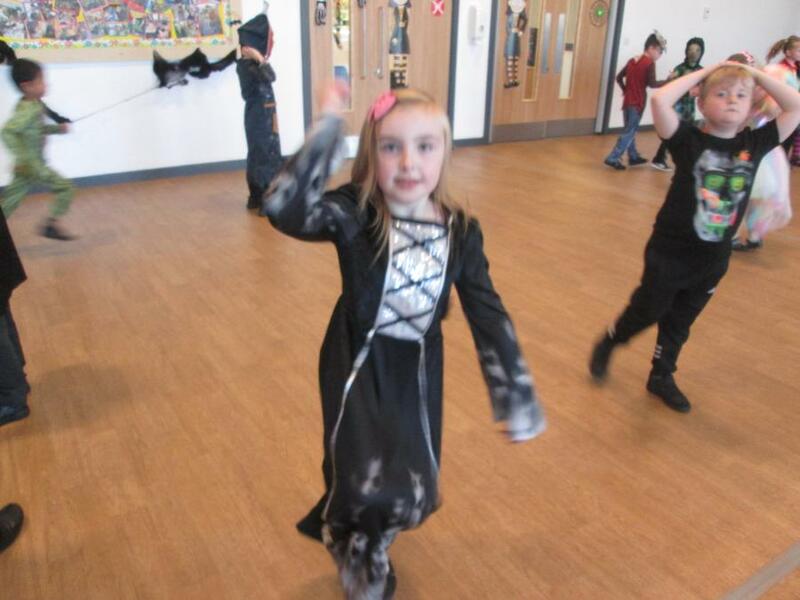 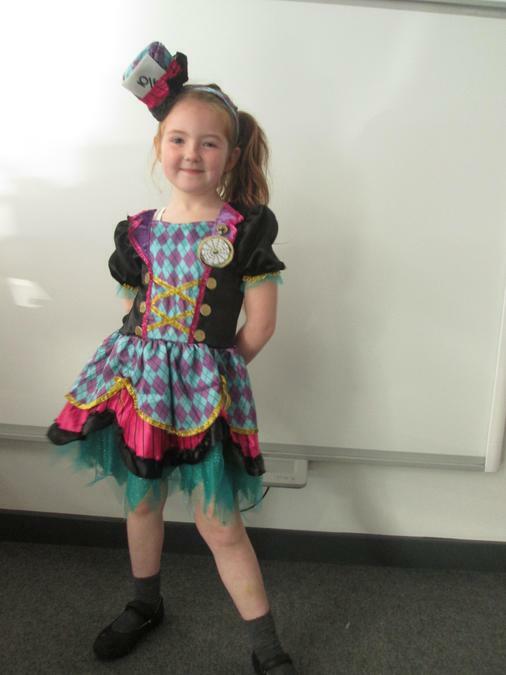 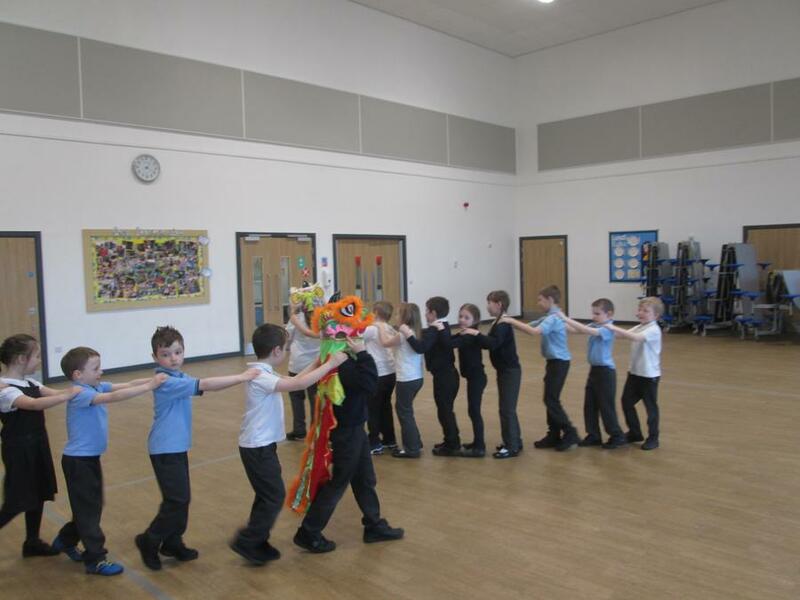 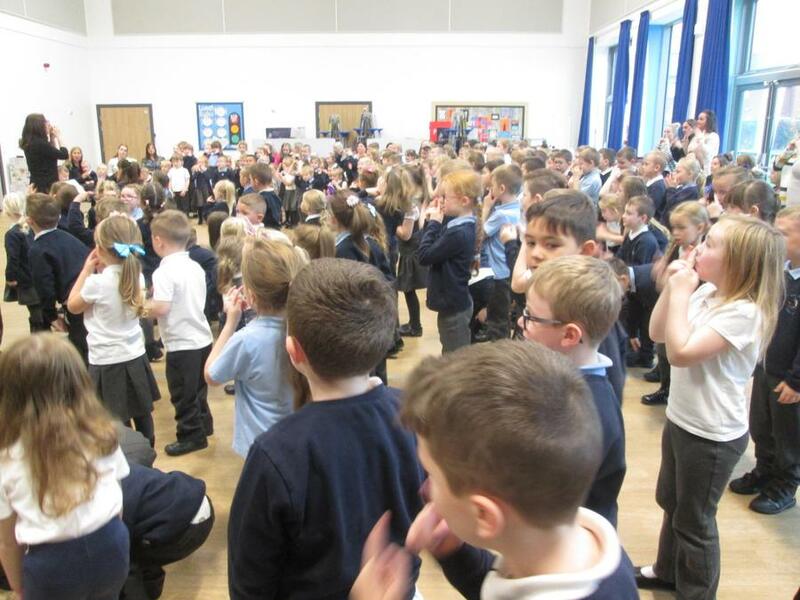 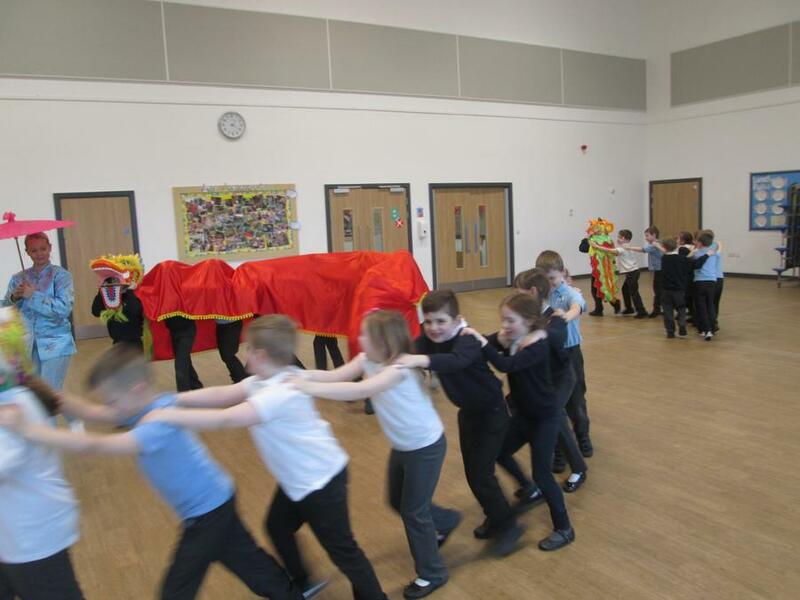 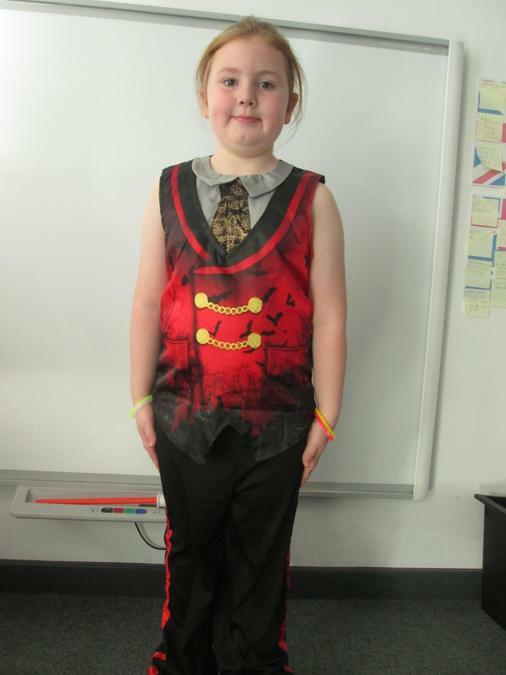 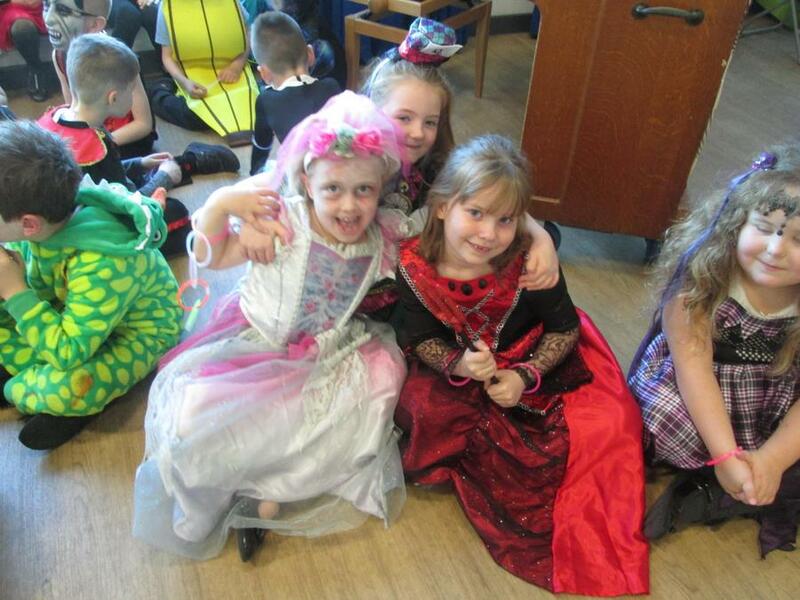 Building on from our Chinese New Year theme this week, today we enjoyed a lovely dancing lesson with Miss Lucy. 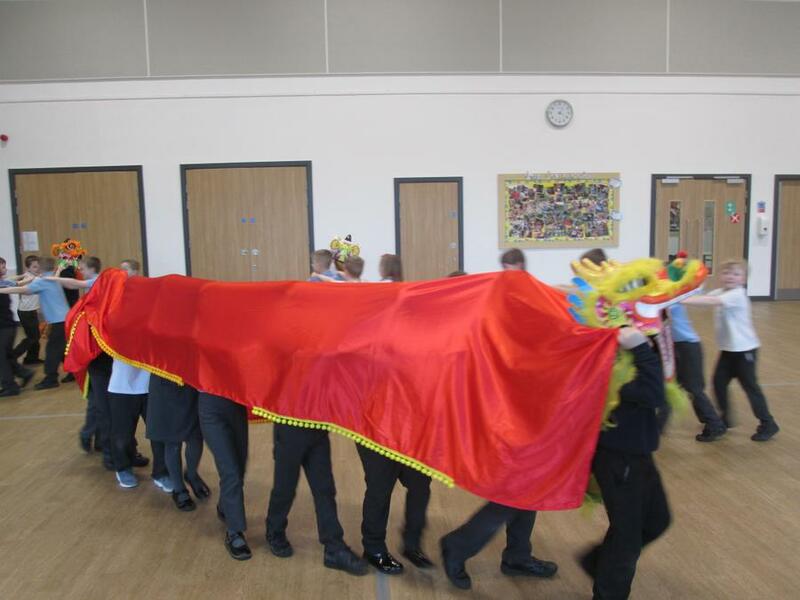 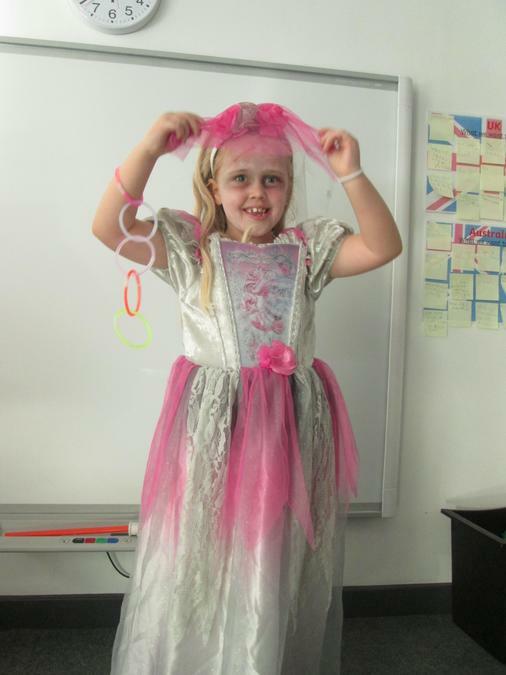 She played some really fun games with us, acting out like animals found within the Chinese calendar, dressing up using Chinese headdresses, and even dancing with Chinese fans. 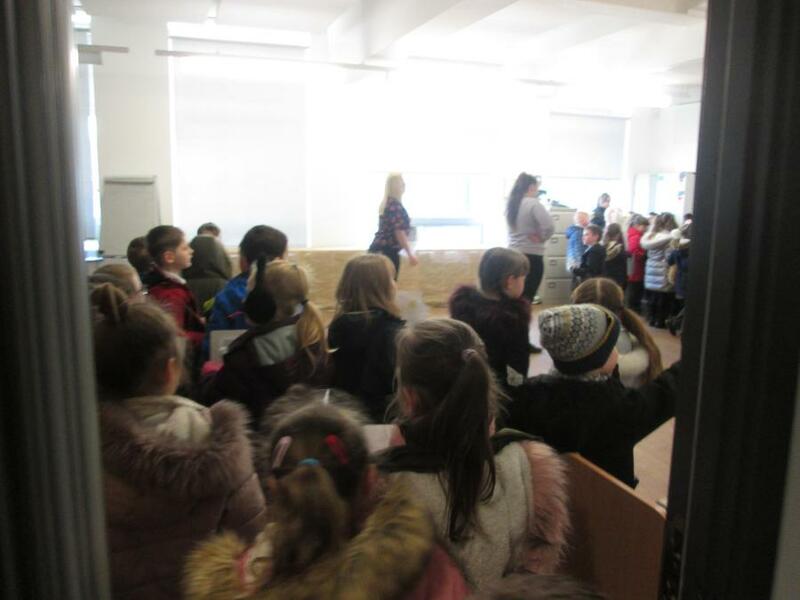 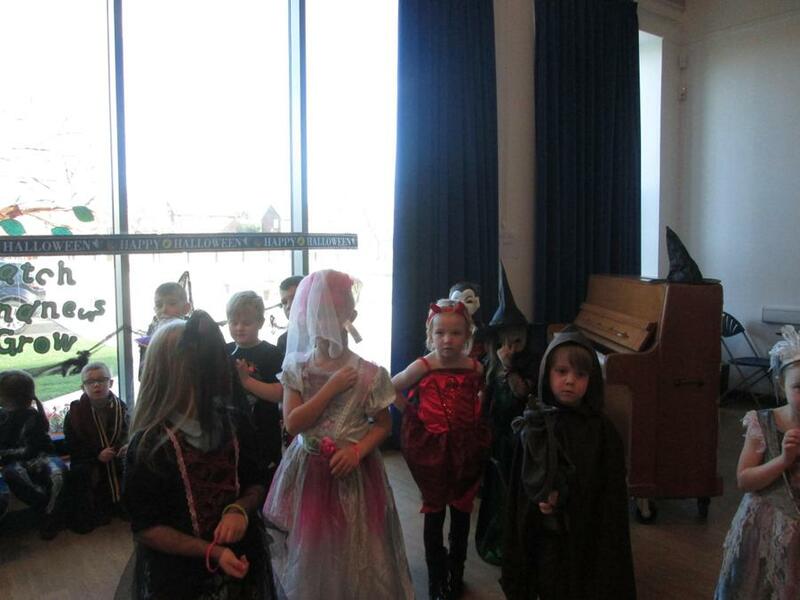 We had so much fun and really enjoyed the music! 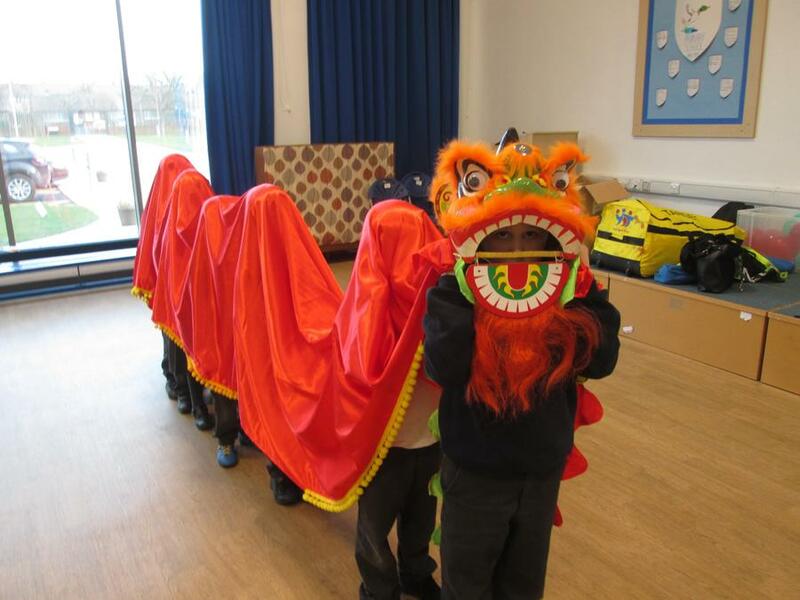 Today at Lingey house we celebrated Chinese New Year! 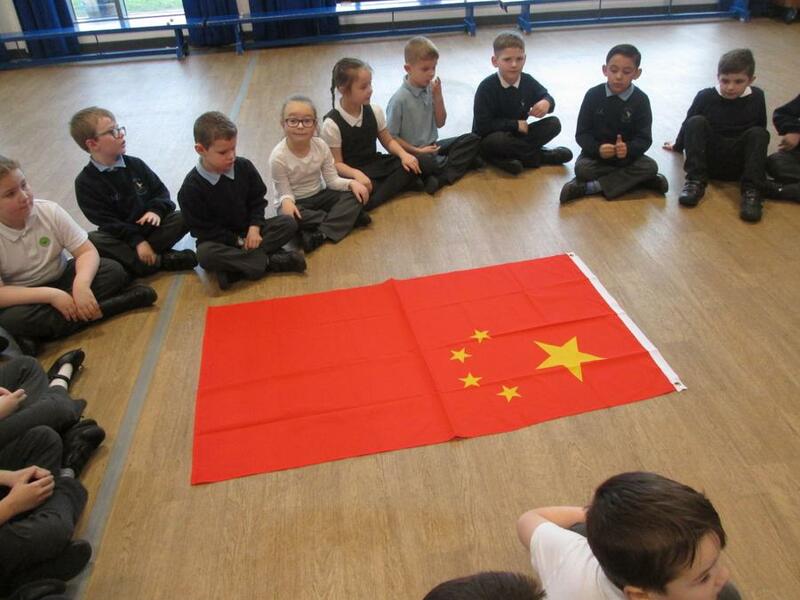 It is the year of the pig. 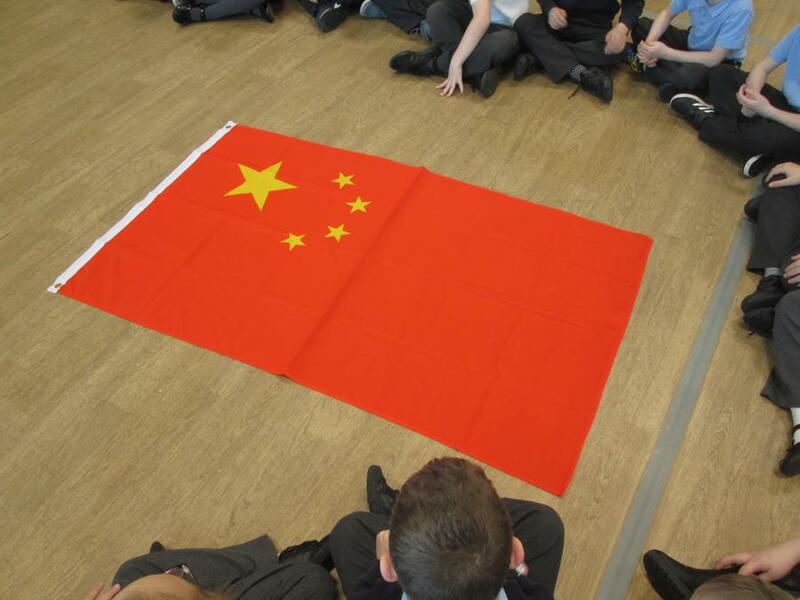 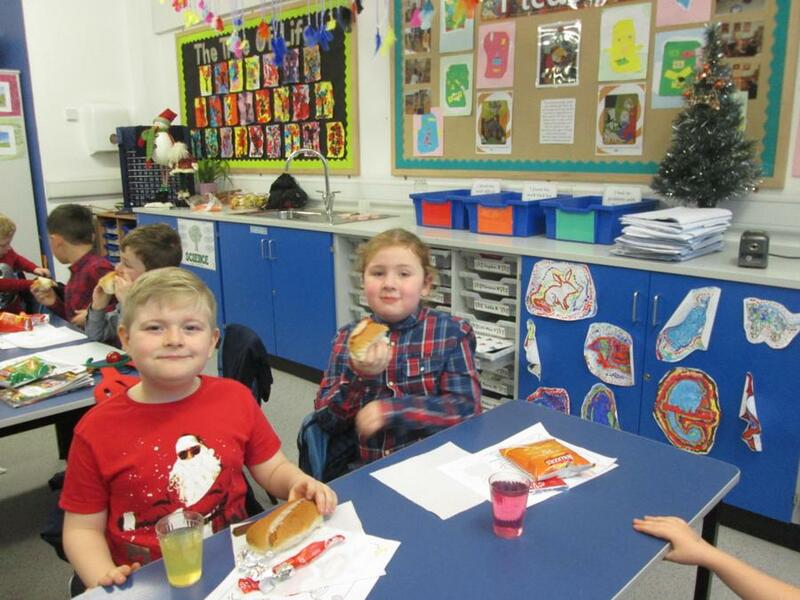 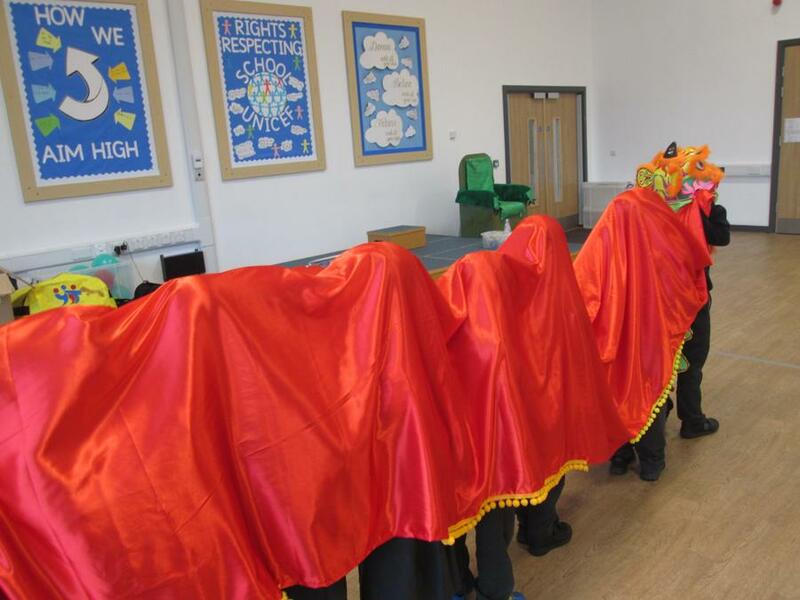 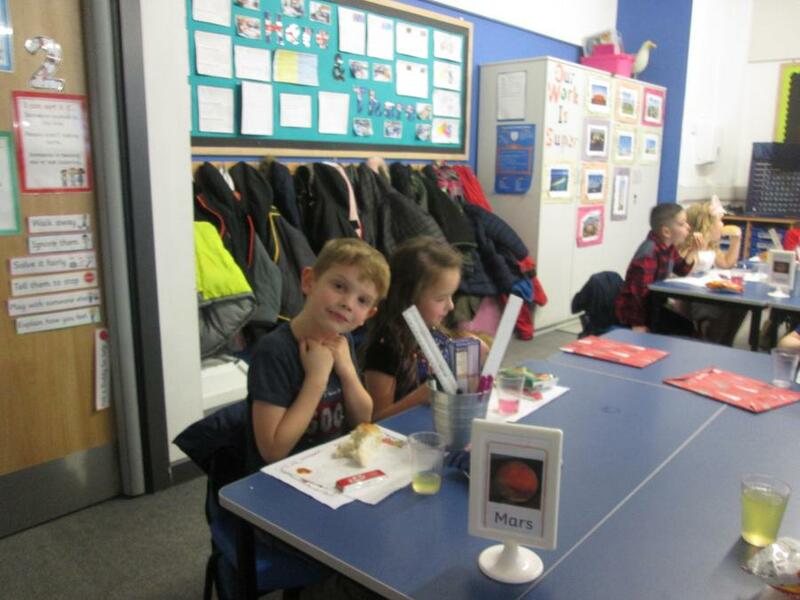 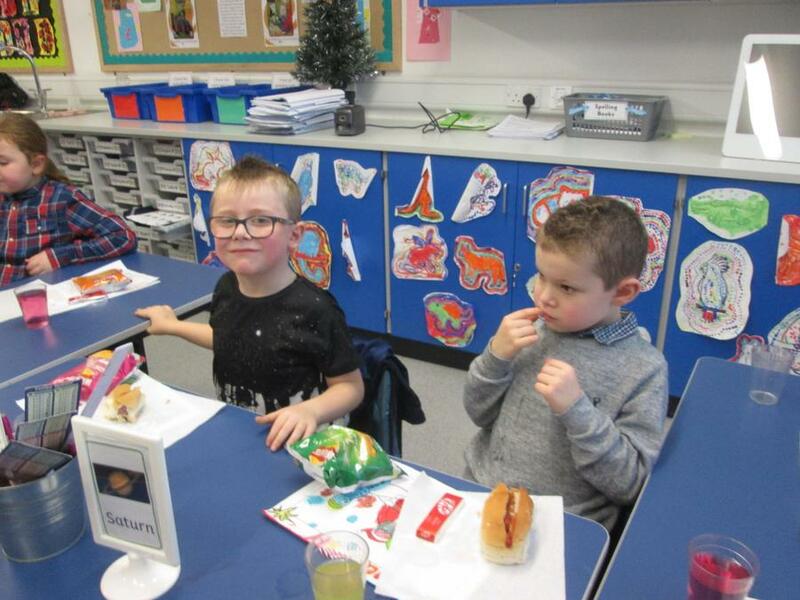 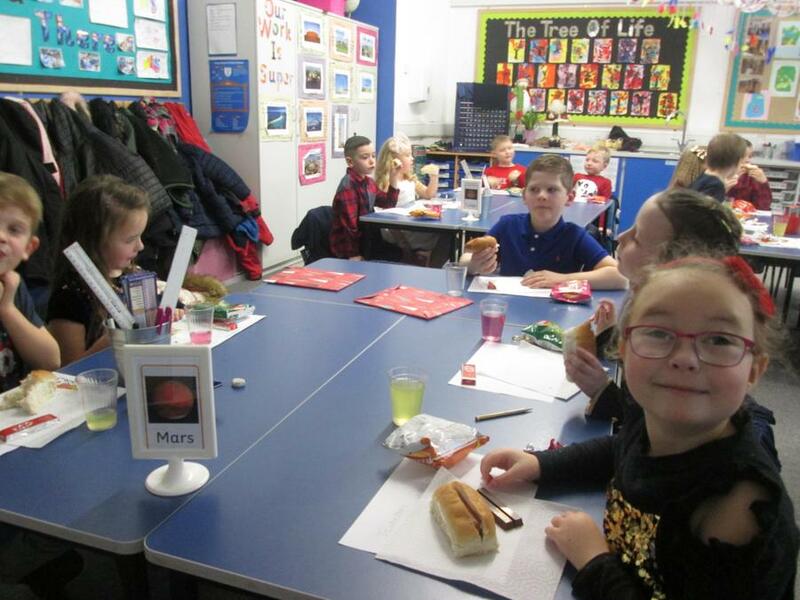 In our assembly Mrs Jackson taught us all how to say 'Happy New Year' in Chinese, we had a special Chinese banquet for lunch, listened to relaxing Chinese music as we worked hard today and even enjoyed eating fortune cookies! 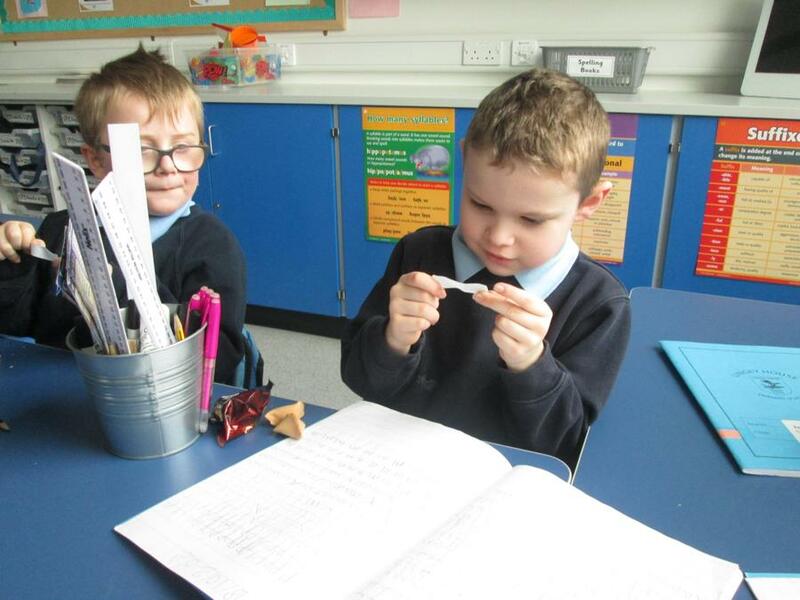 We loved reading our fortunes and talking with our partner about what their cookie said! 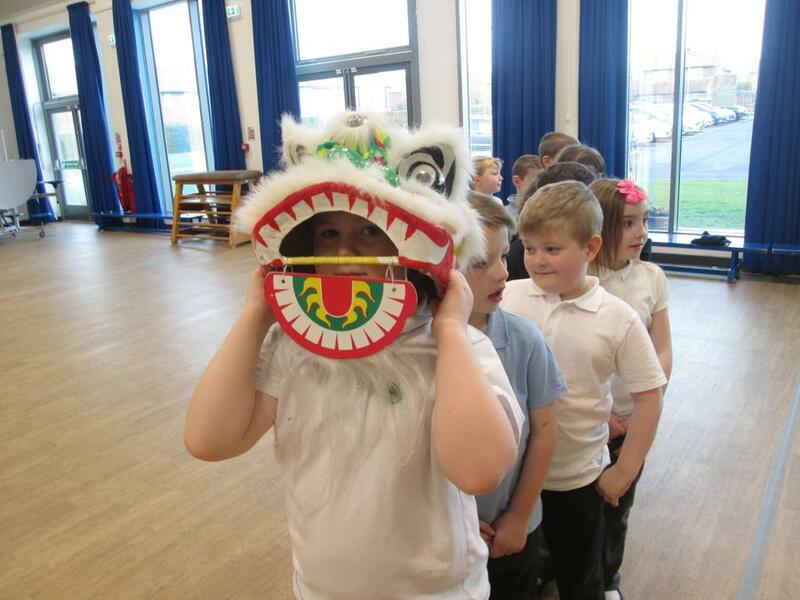 Gung Hay Fat Choy year 2! 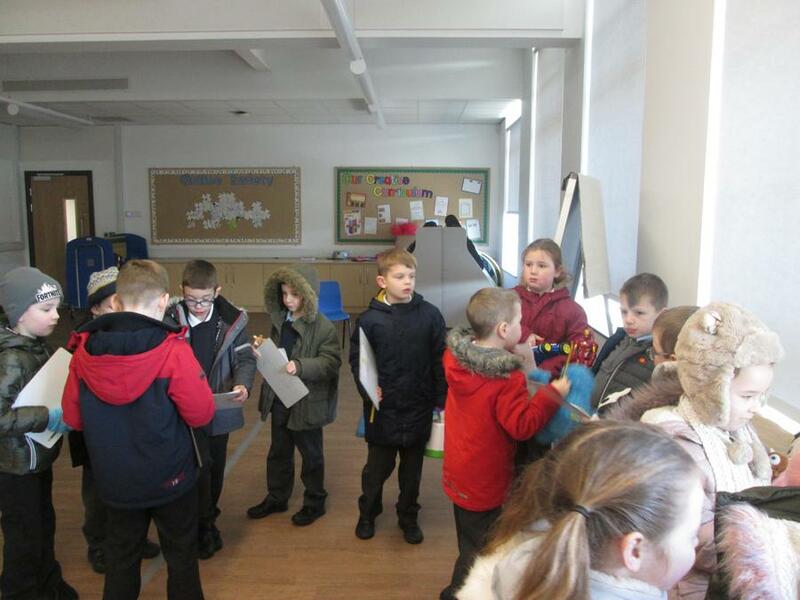 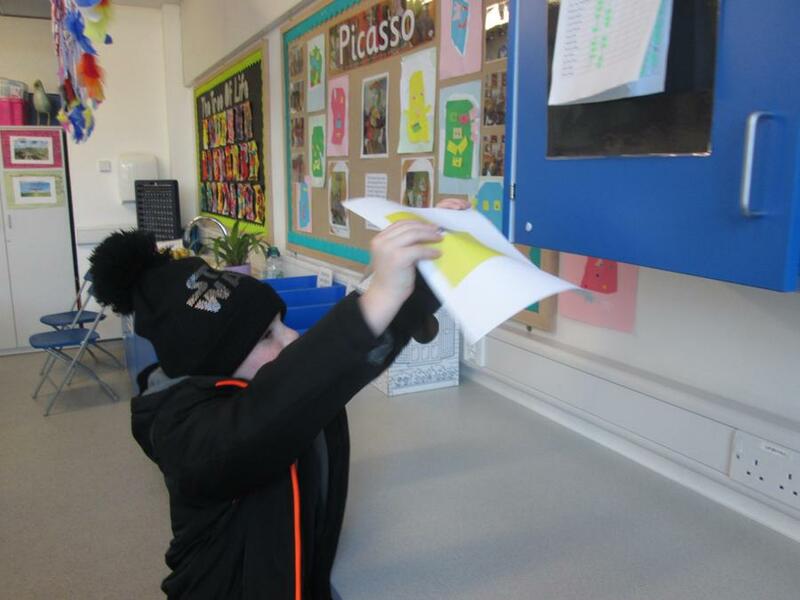 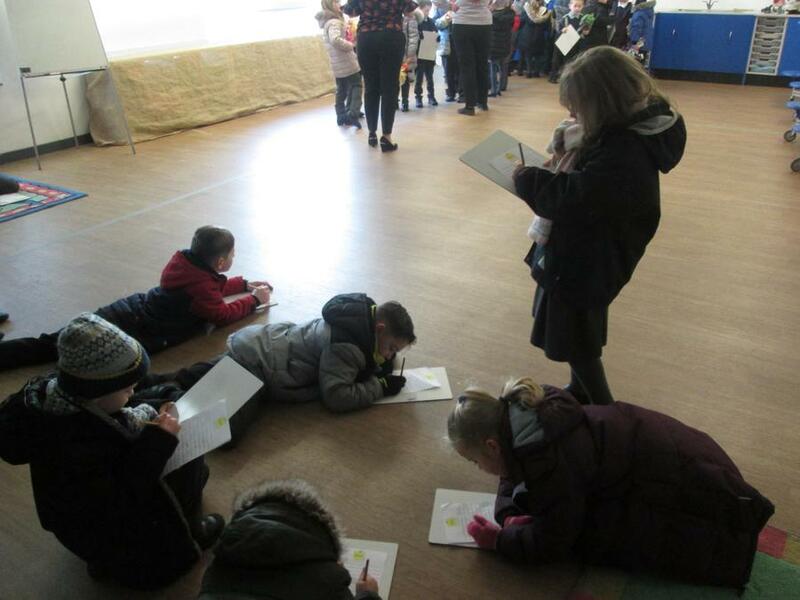 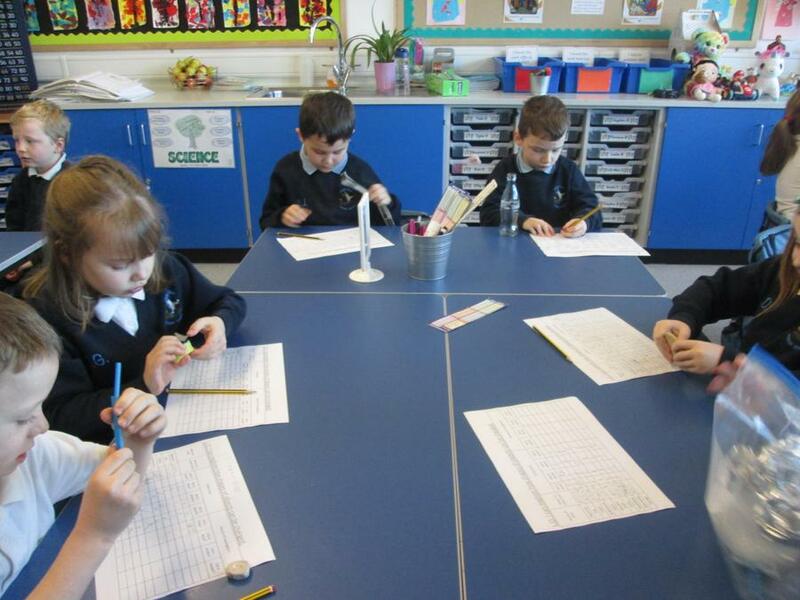 This morning during our maths lesson we had so much fun going on a shape hunt with Miss Howe. 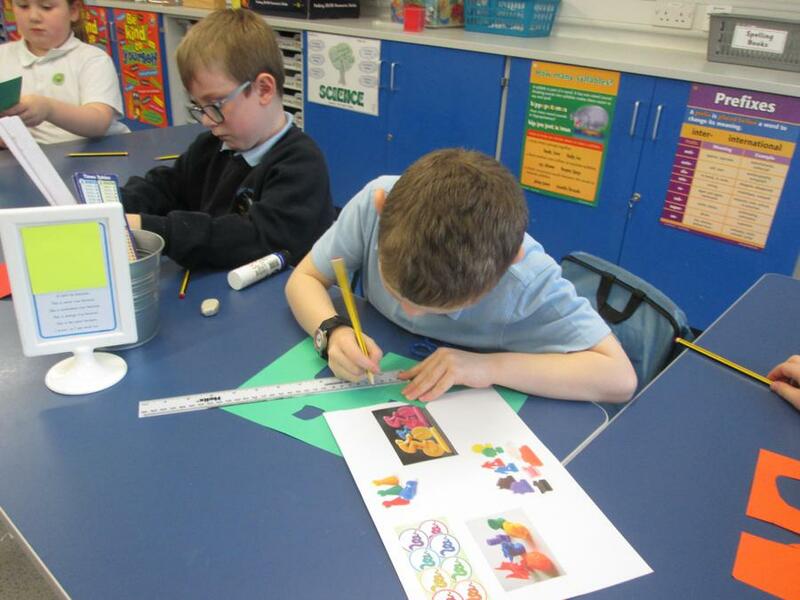 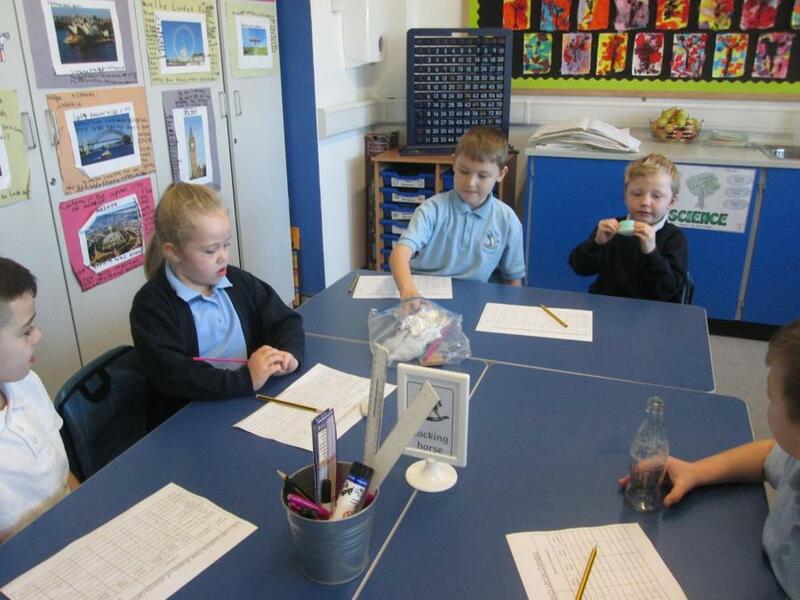 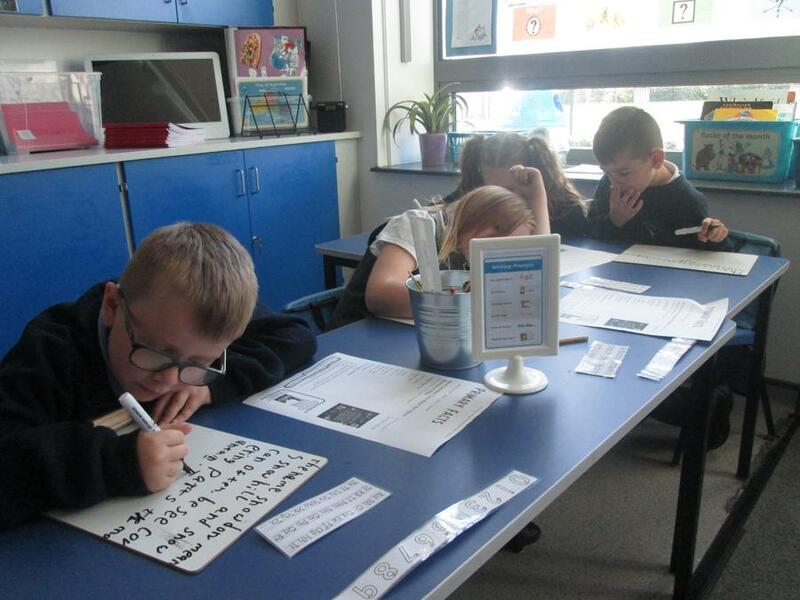 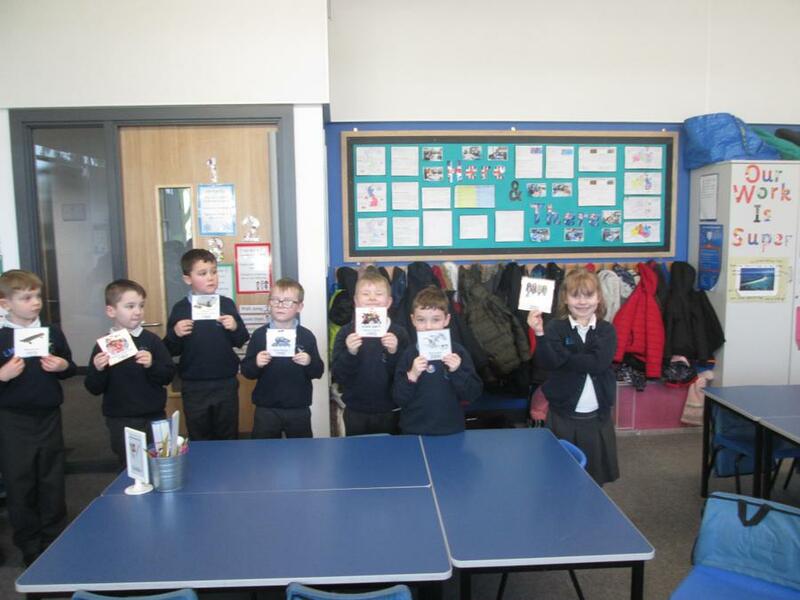 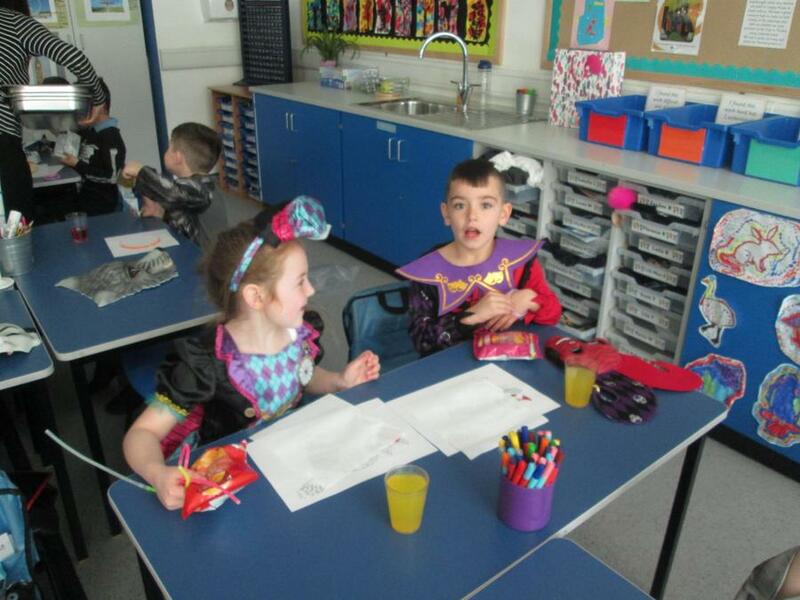 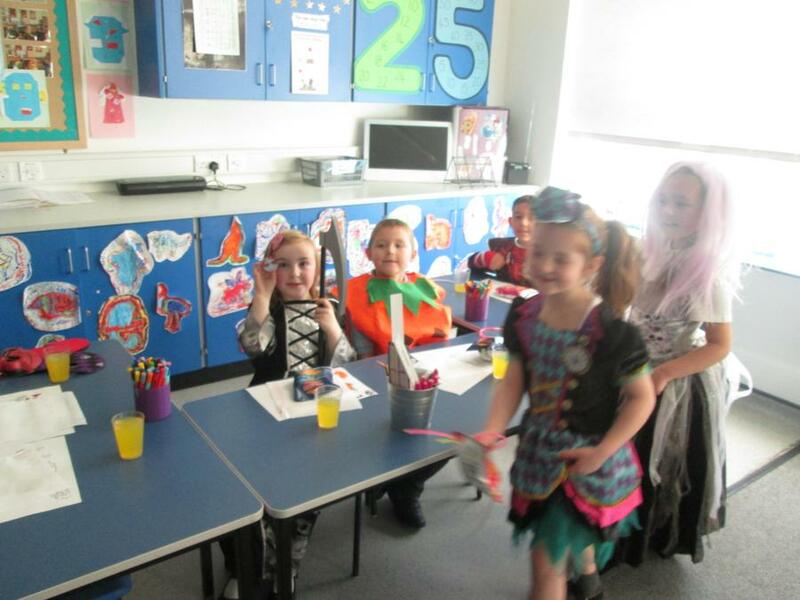 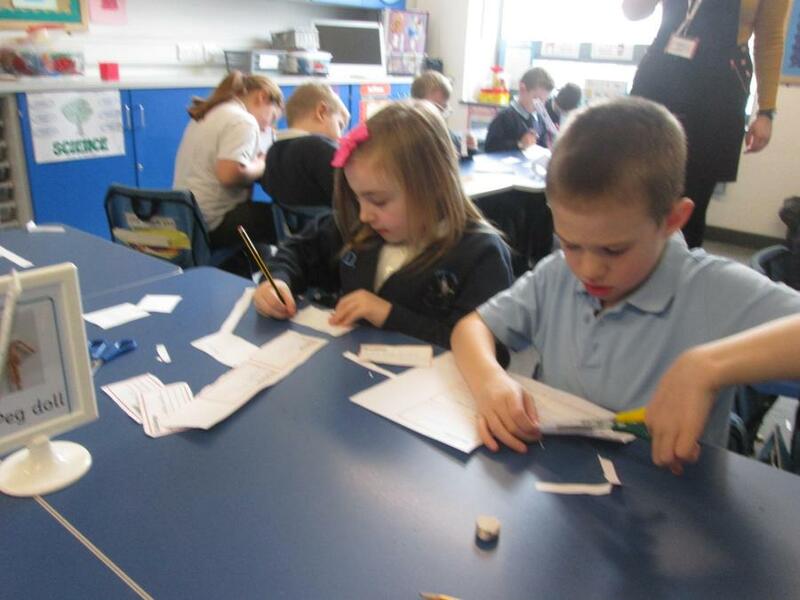 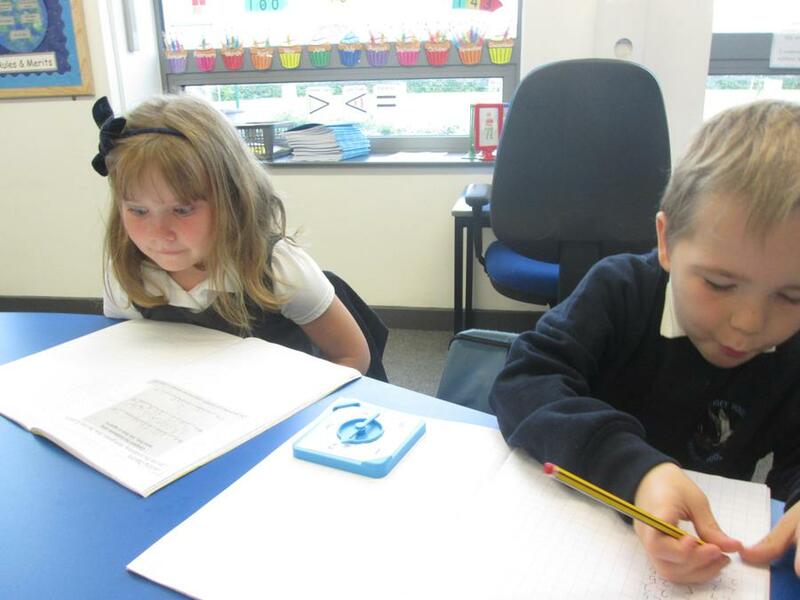 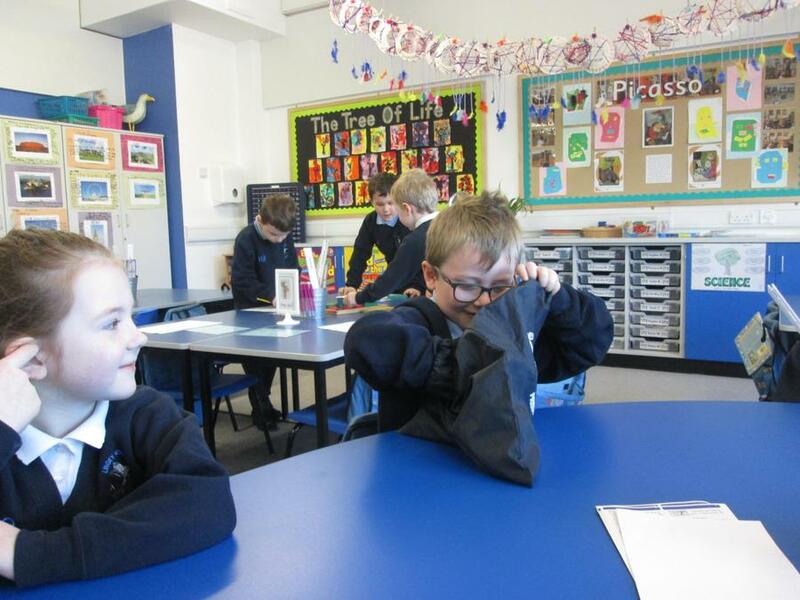 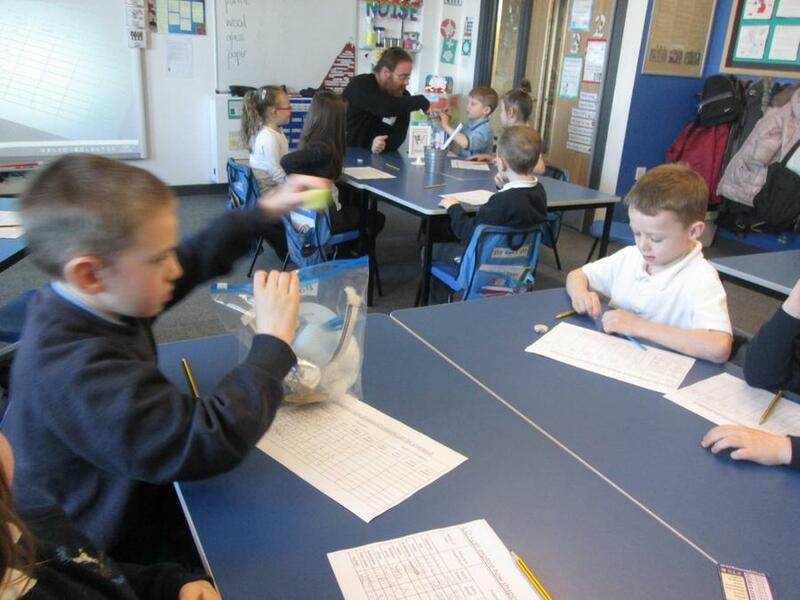 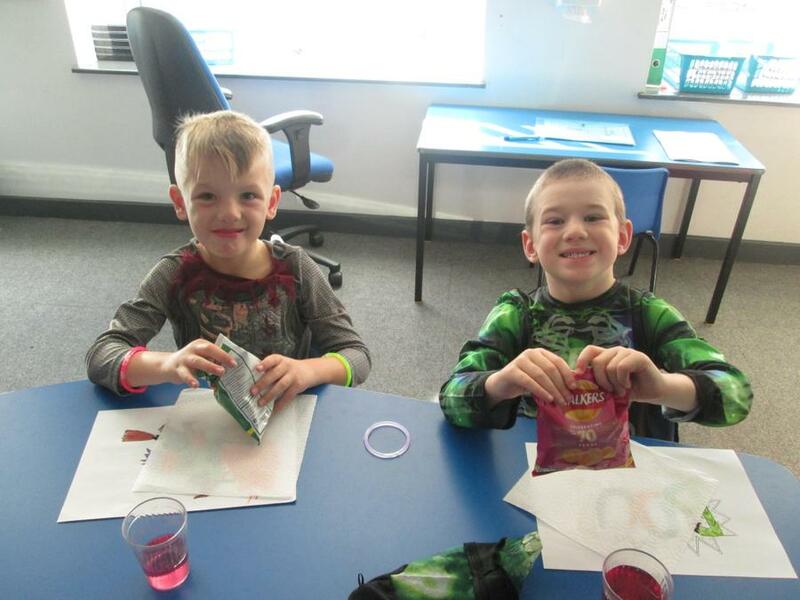 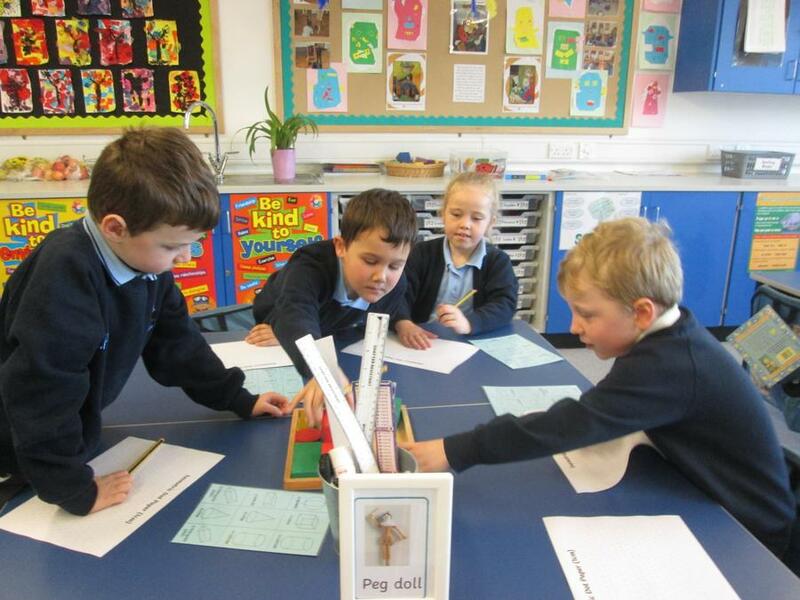 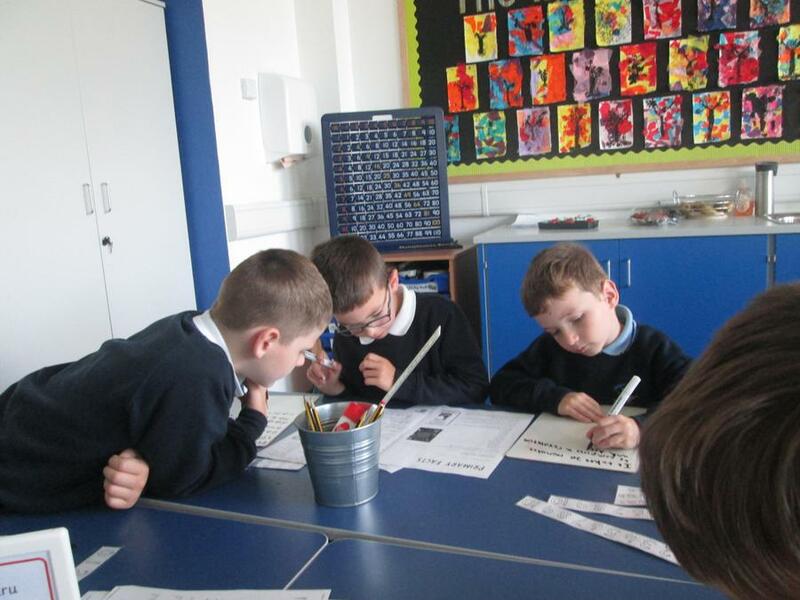 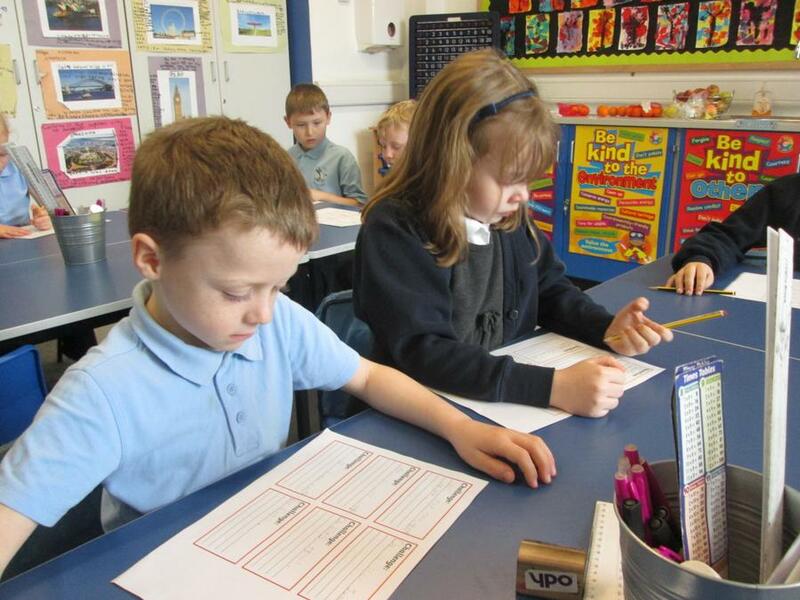 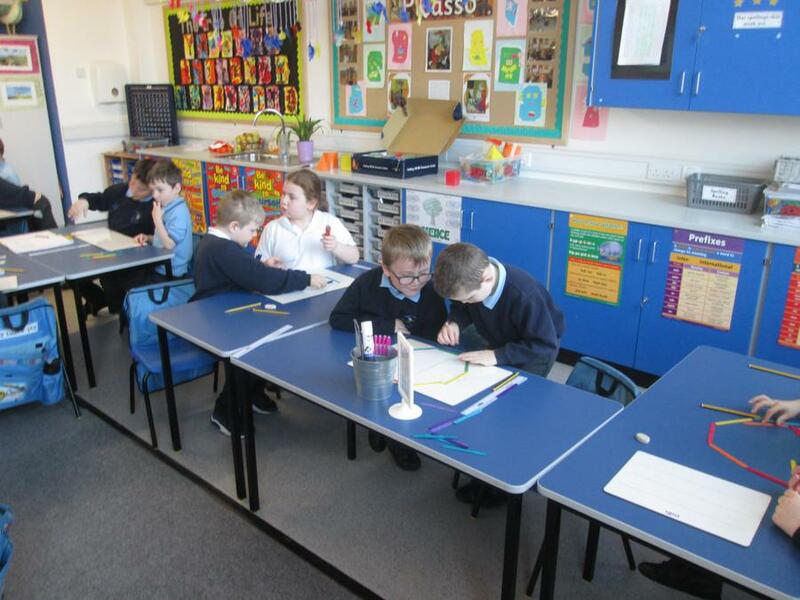 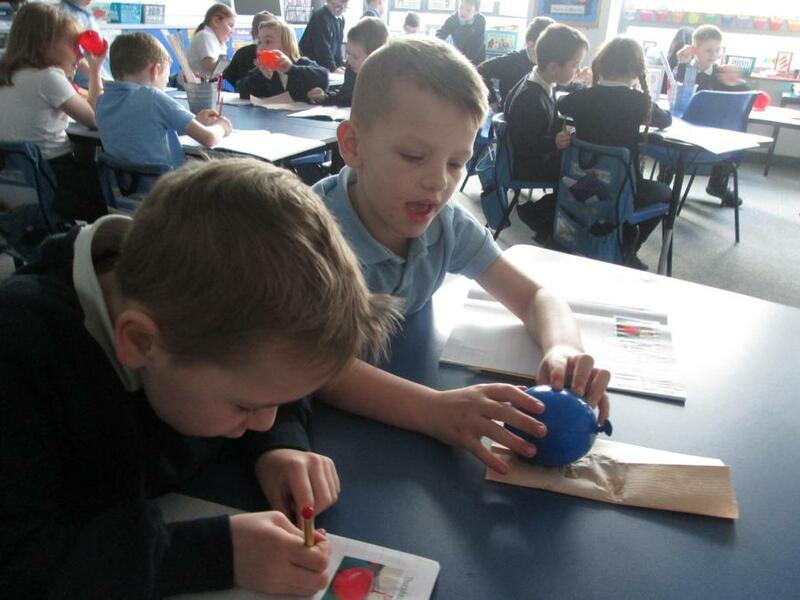 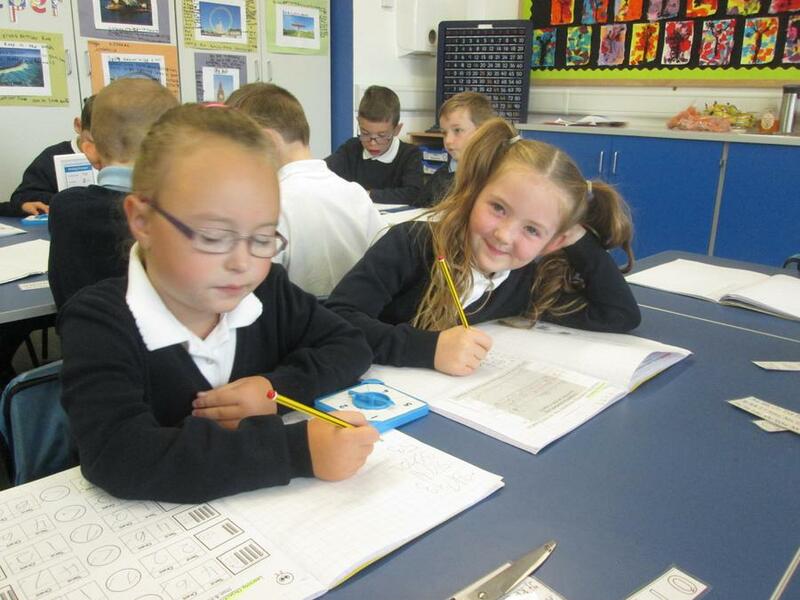 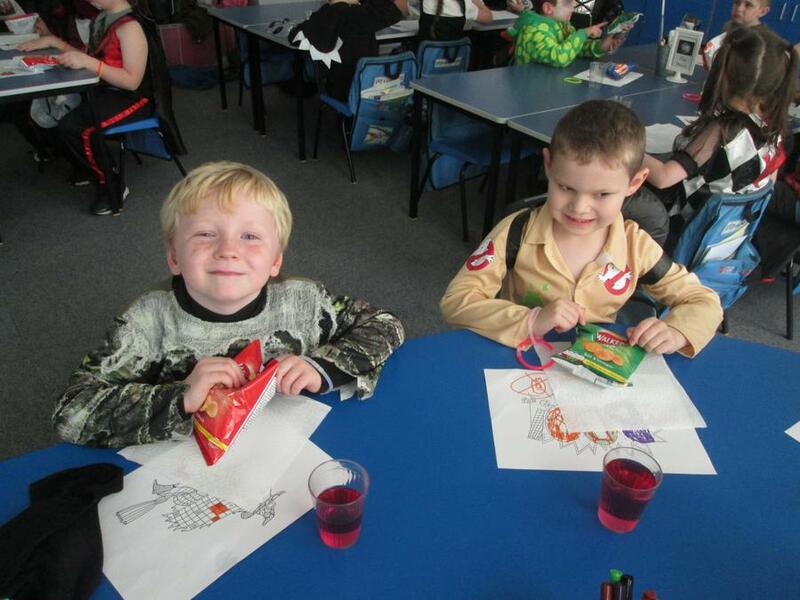 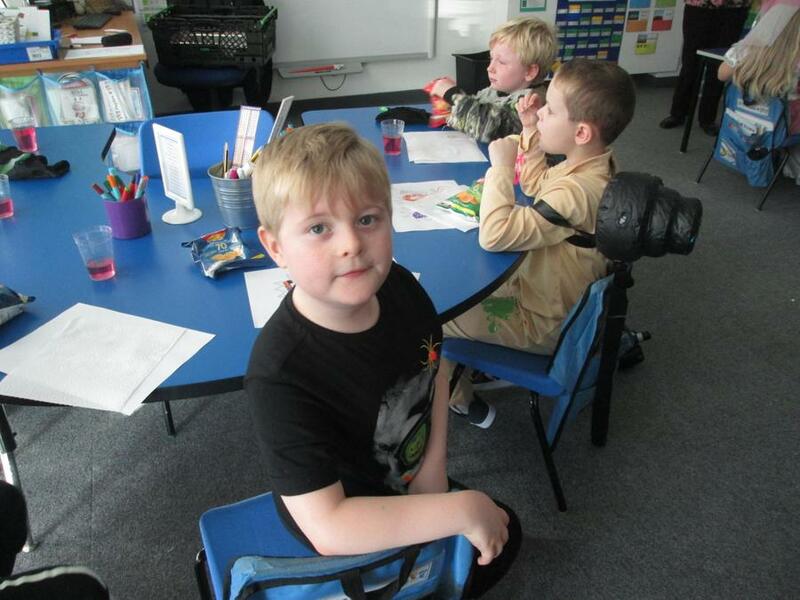 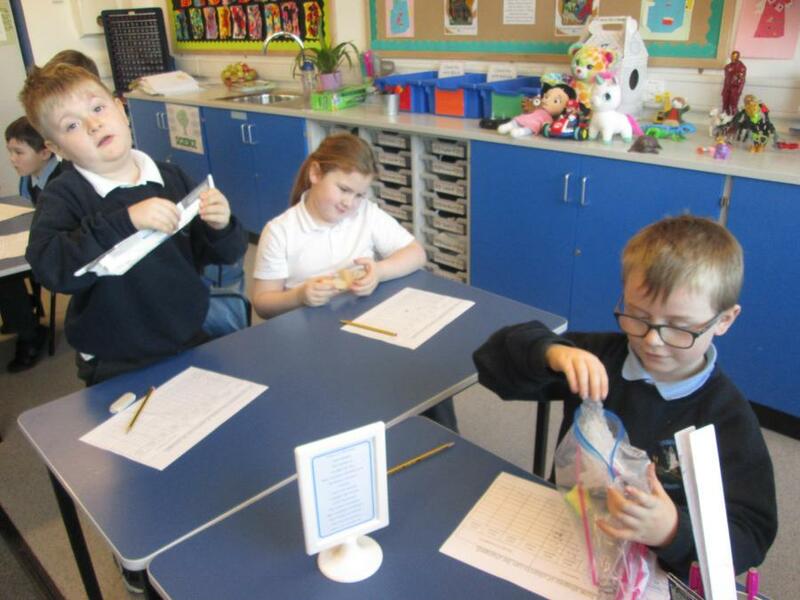 In the classroom we enjoyed using a feely bag, drawing shapes and writing about some of the shapes properties! 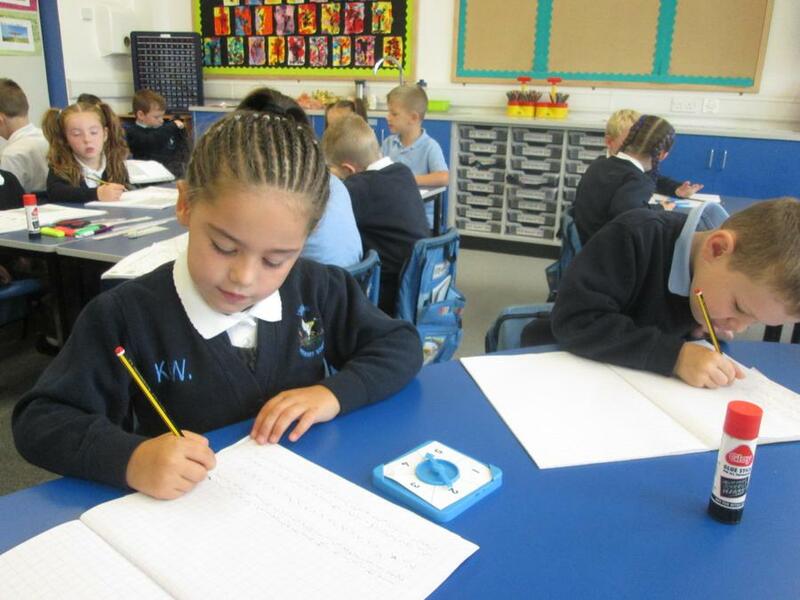 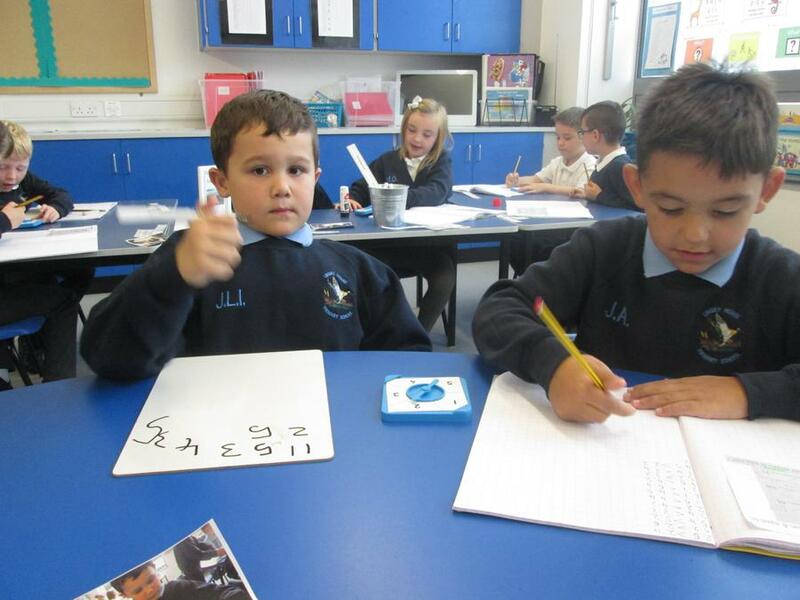 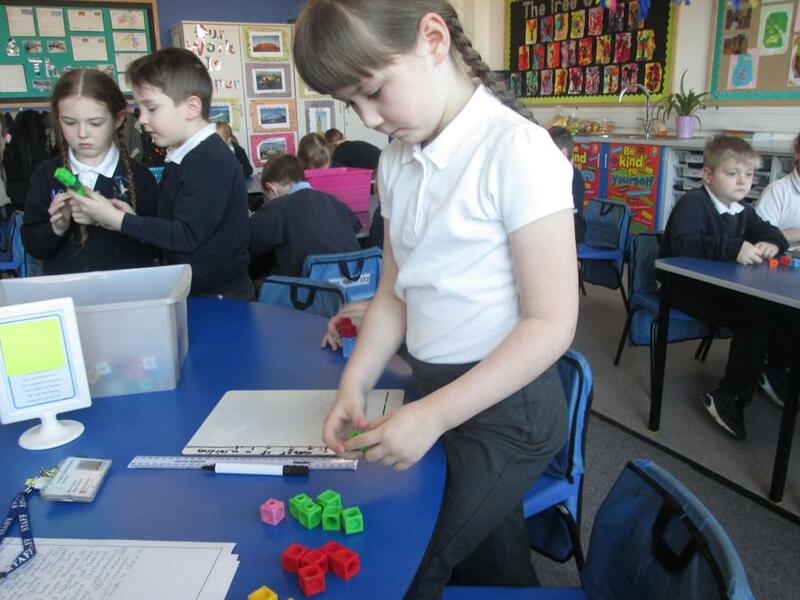 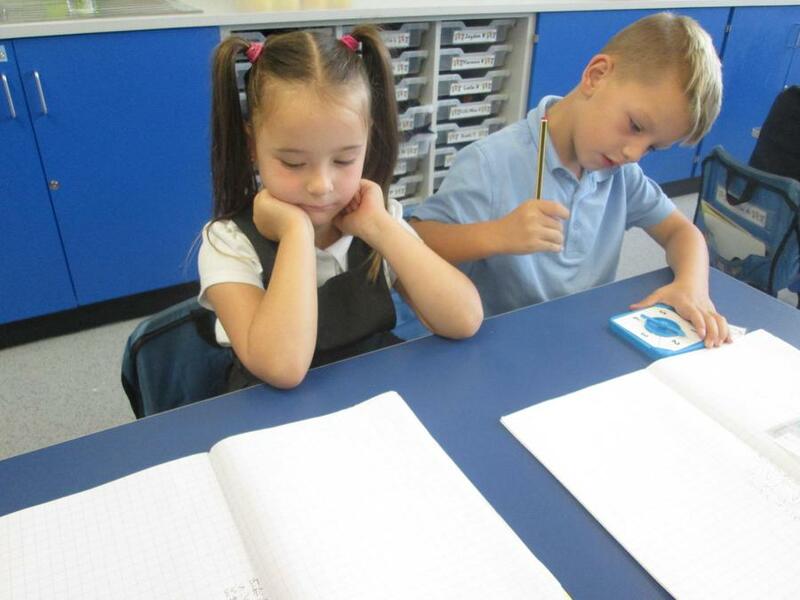 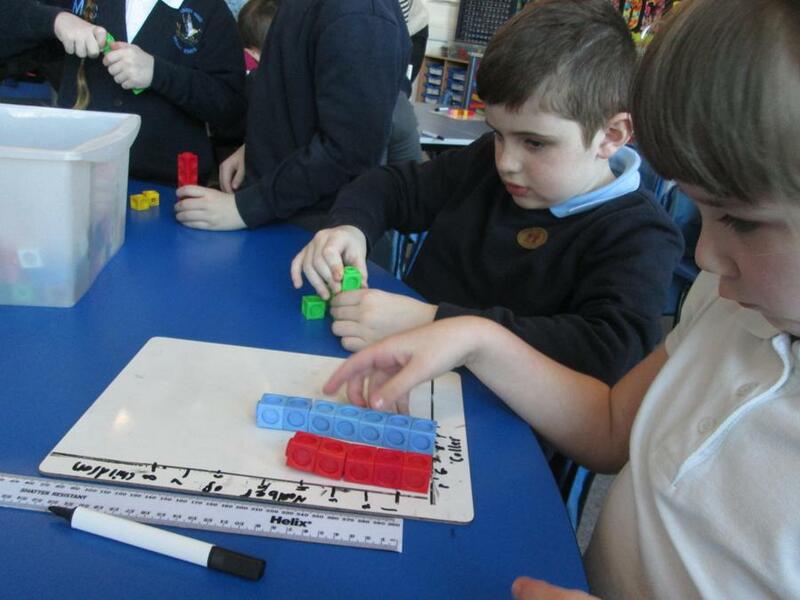 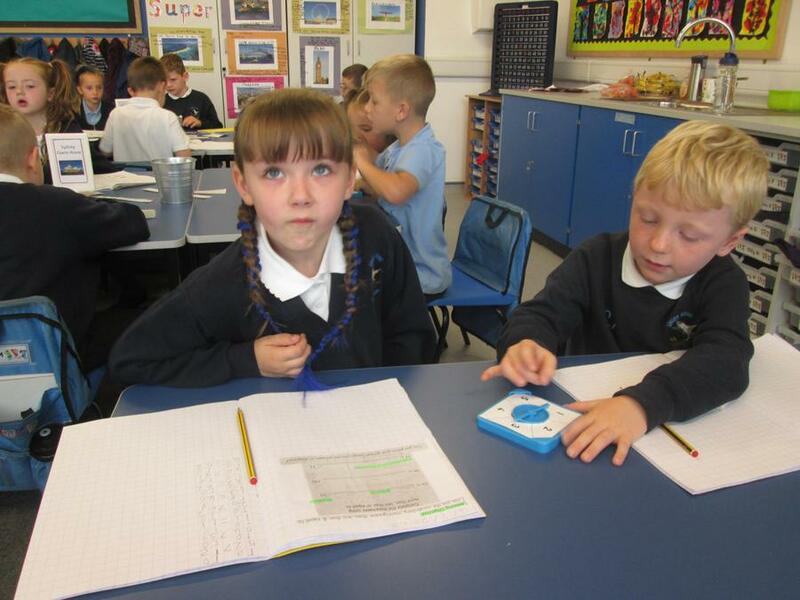 We love maths in year 2L! 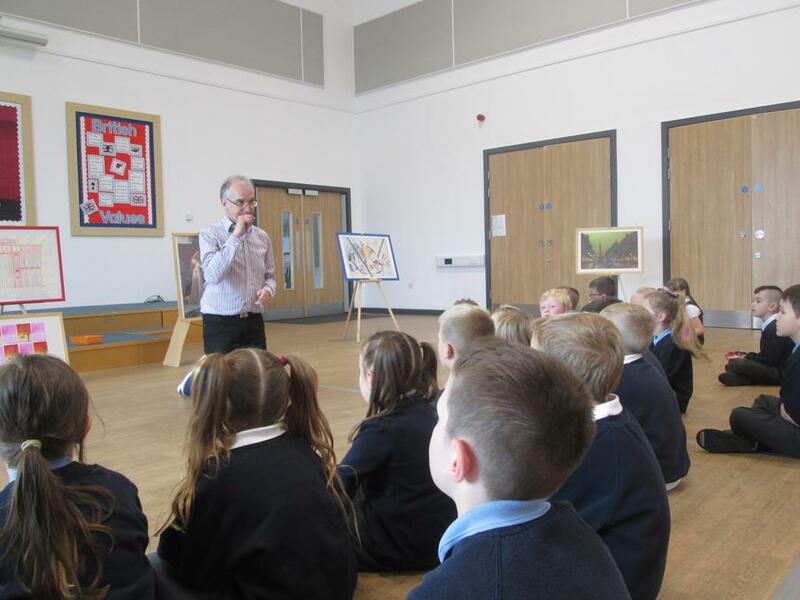 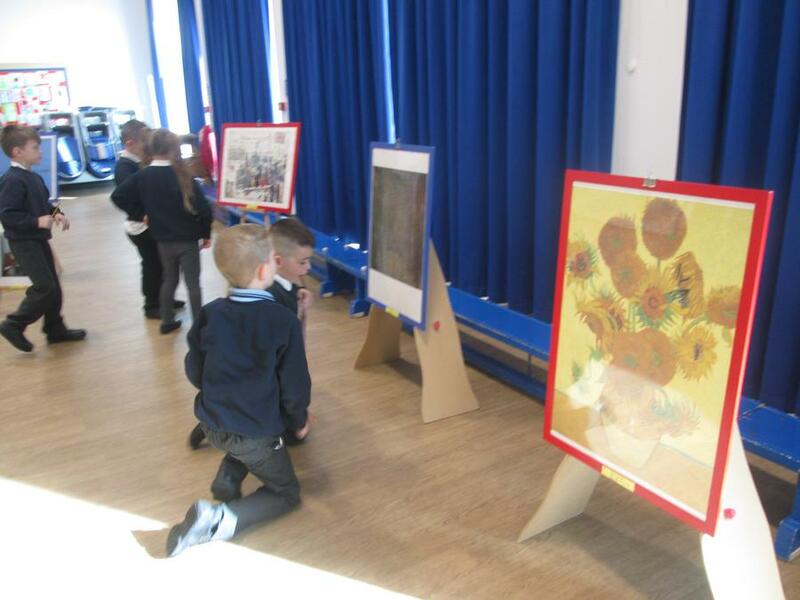 This morning we had such a lovely visit from Pippa Bell, she brought lots of paintings linked to our topic into school and brought them to life during our lesson. 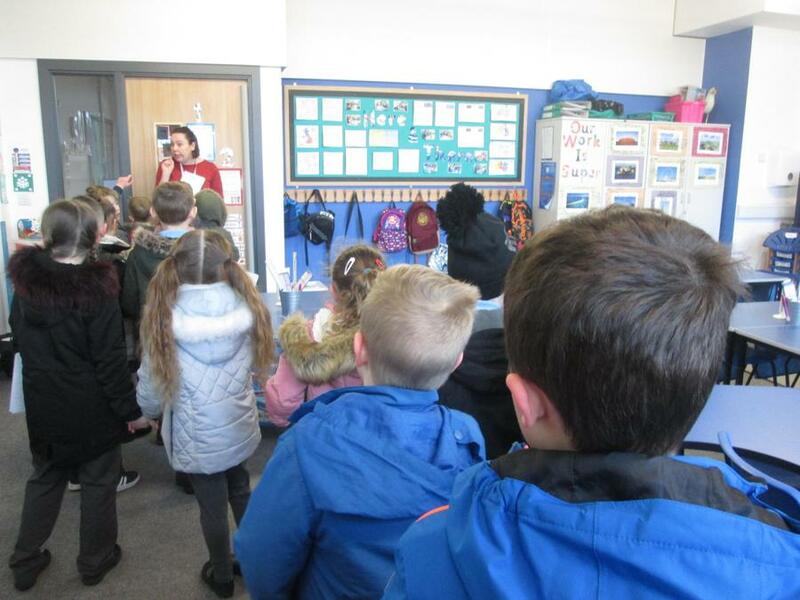 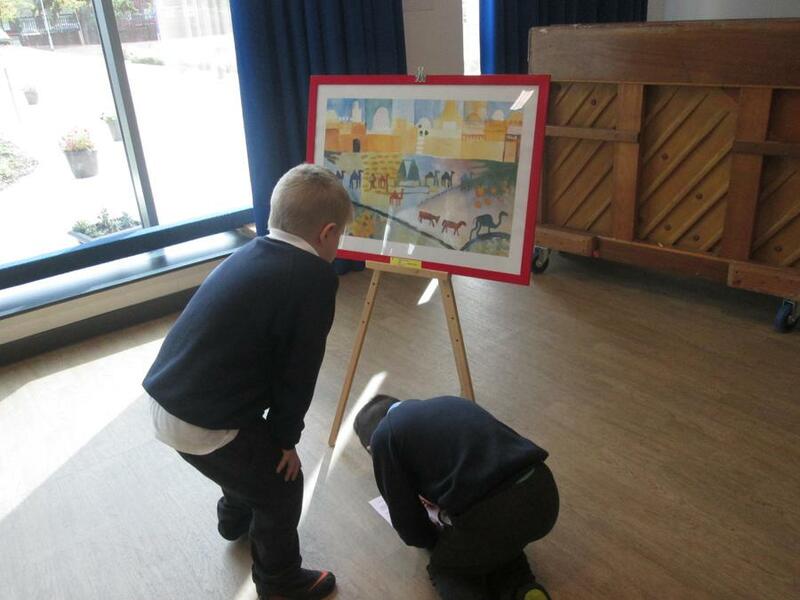 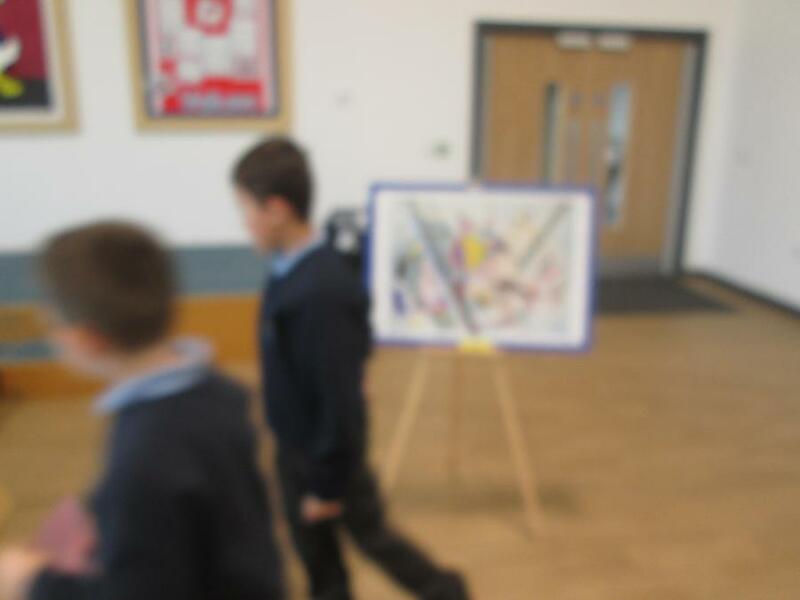 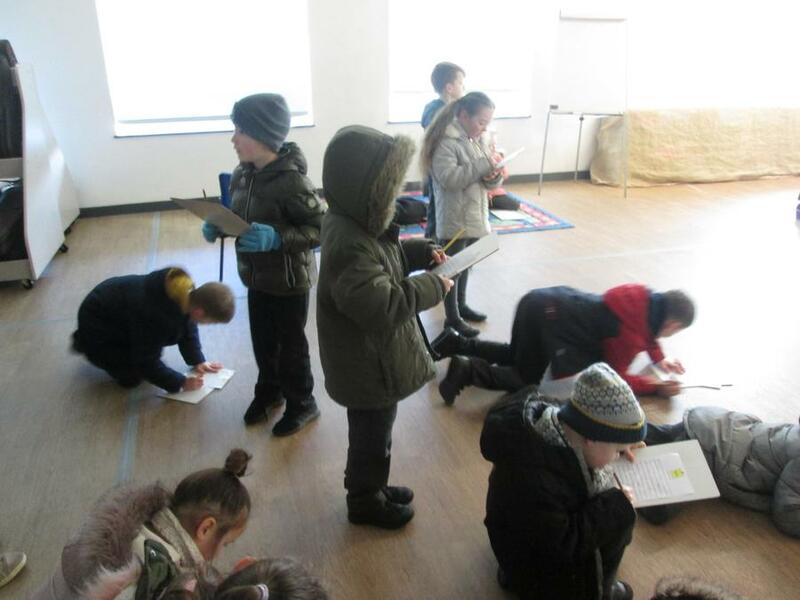 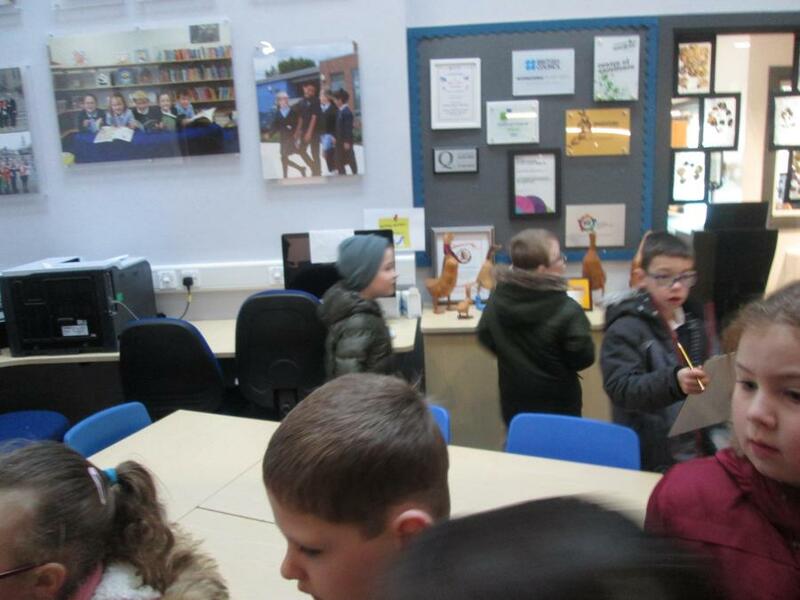 We searched for items in a toy shop from Peter Blake's sculpture, moved around the room like we were using a hoop and stick like Ethel Spowers painting, and searched for 80 playground games within the painting by Pieter Breughel the Elder. 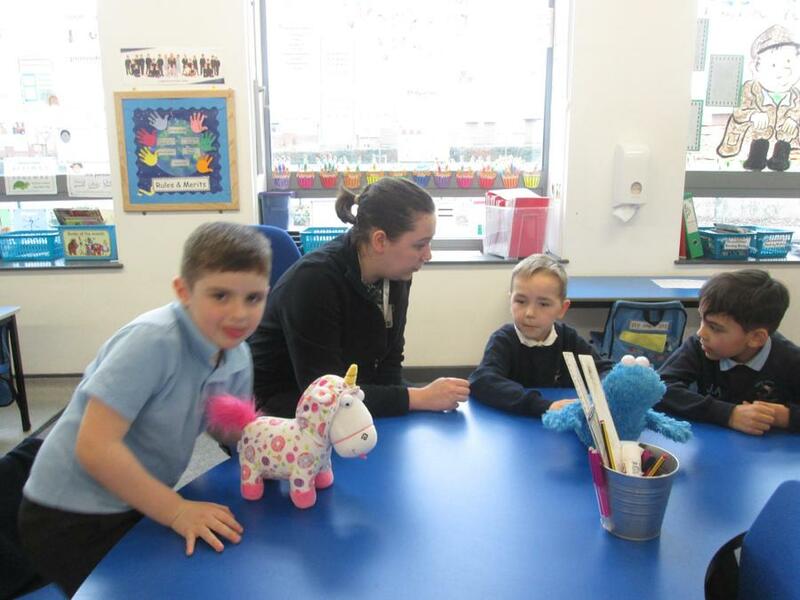 Thanks so much Pippa for a lovely morning learning all about changes to toy within Art! 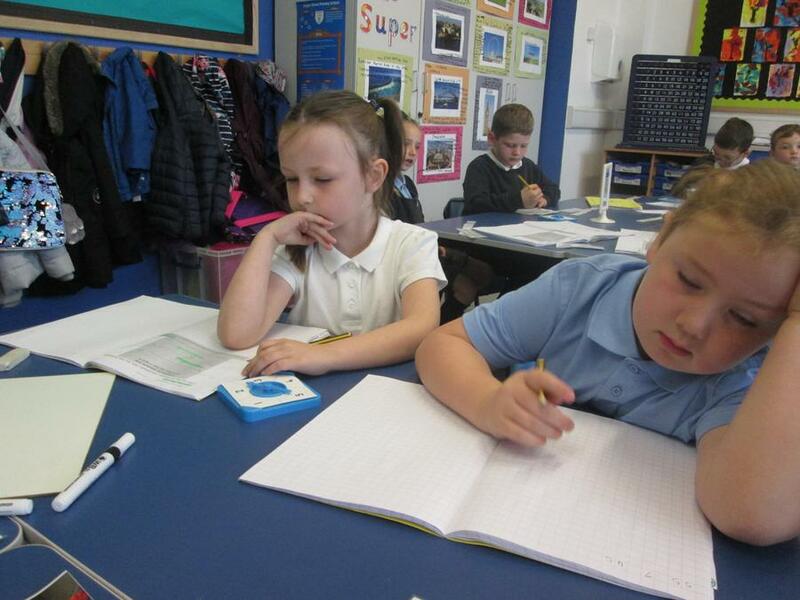 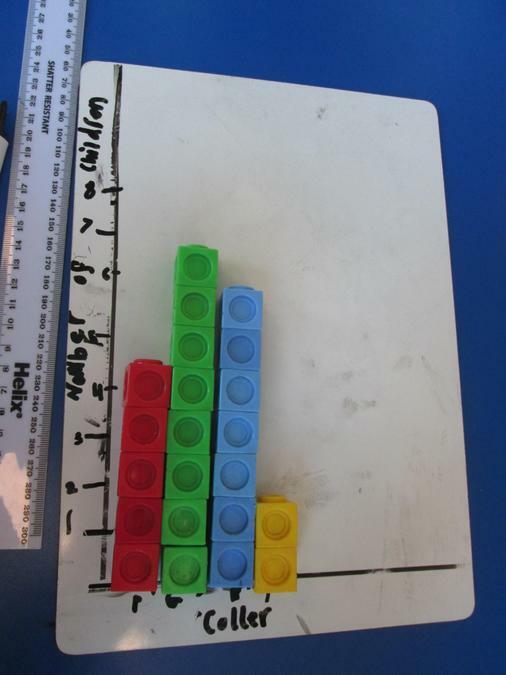 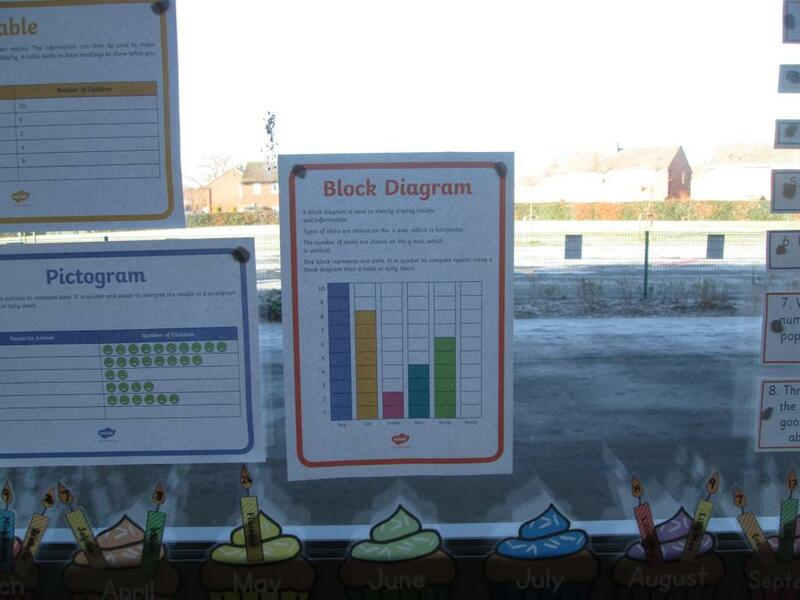 Today in maths we have used our statistic skills to learn more about a different graph type. 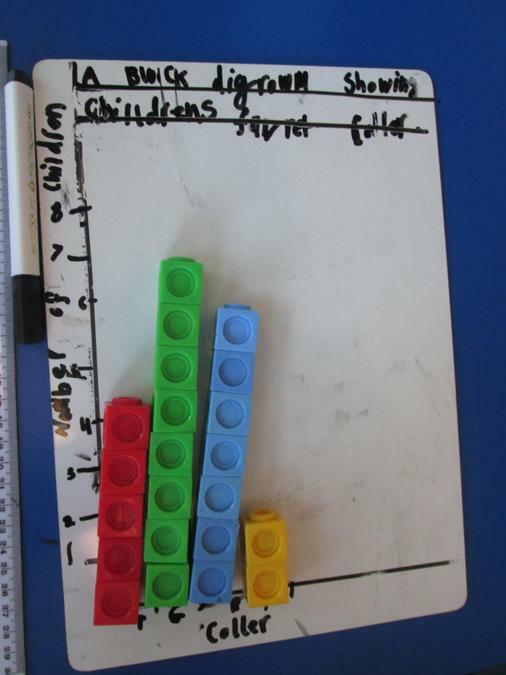 We have looked at building and creating a block graph using multi link, this afternoon we are going to challenge ourselves by drawing our own block graph within our creative curriculum lesson, showing Miss Collins' classes favourite board games. 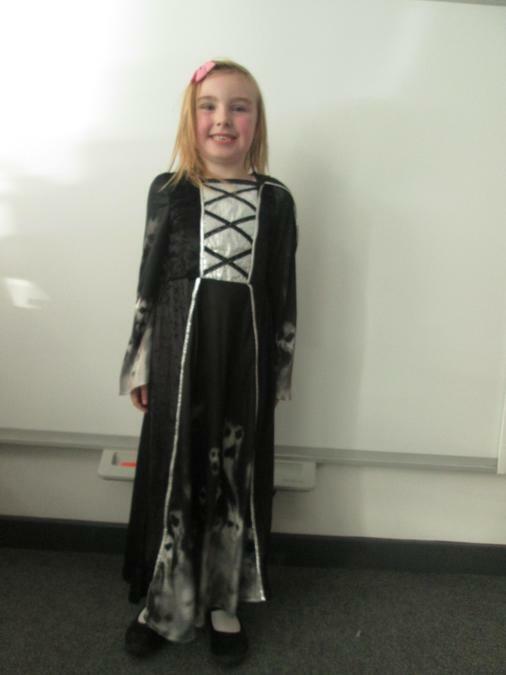 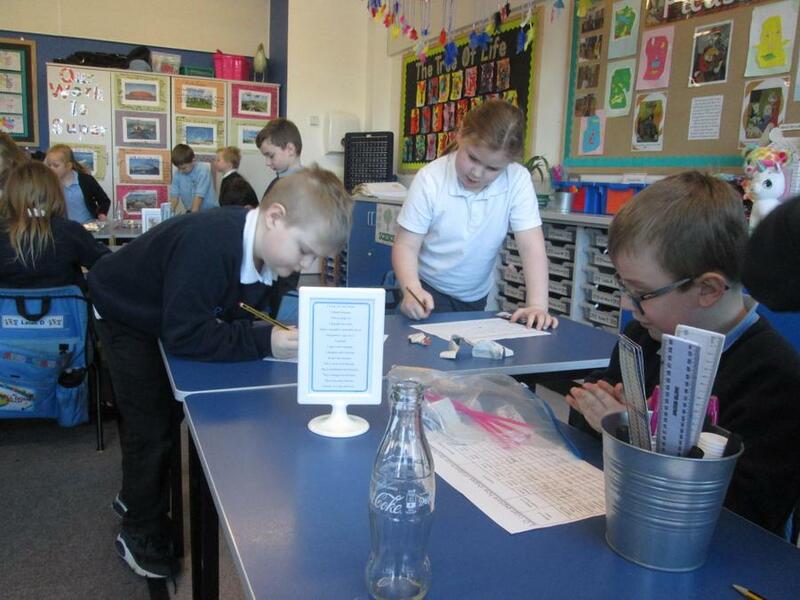 In Re we have been learning about how important prayer is within the Muslim culture. 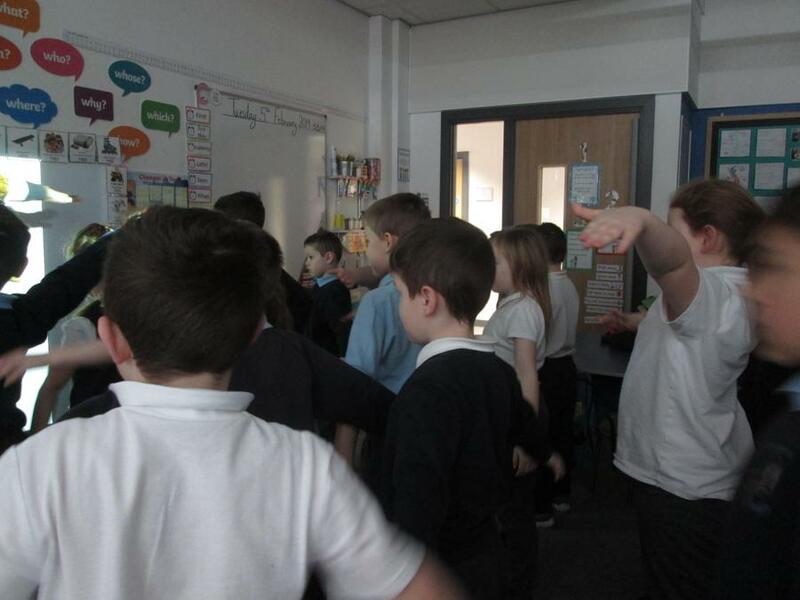 Today we ordered the Salat and some children even followed the movements! 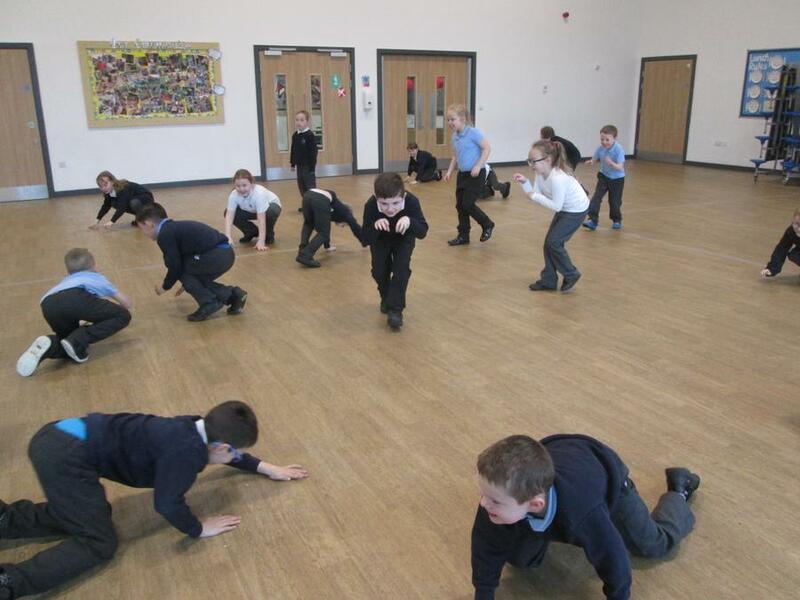 Salat is the obligatory Muslim prayers, performed five times each day by Muslims. 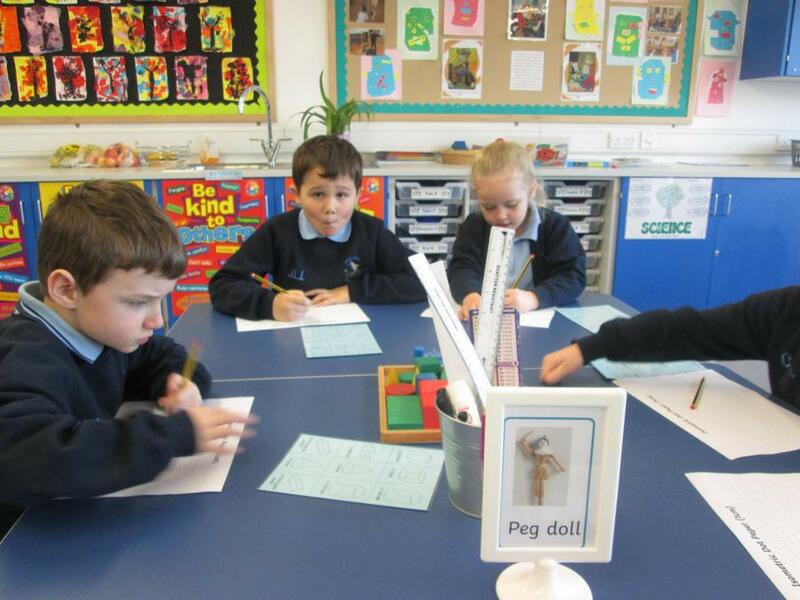 It is the second Pillar of Islam. 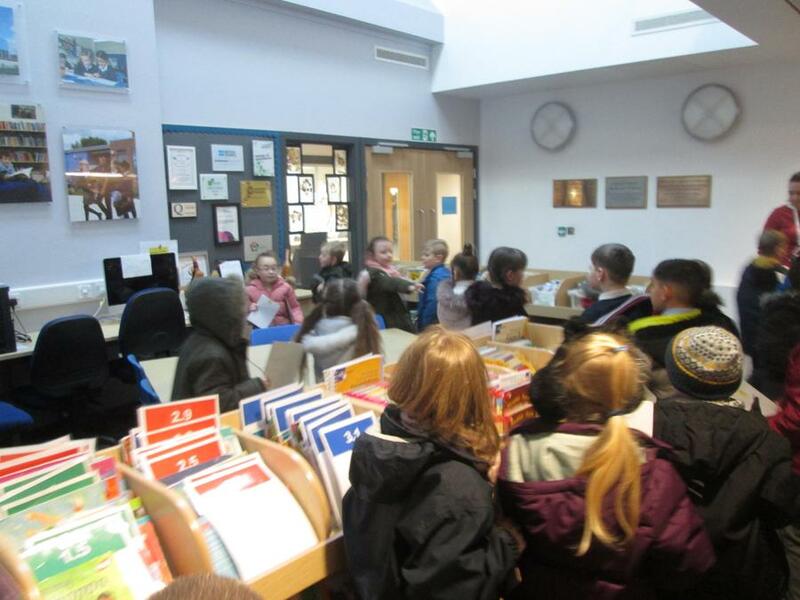 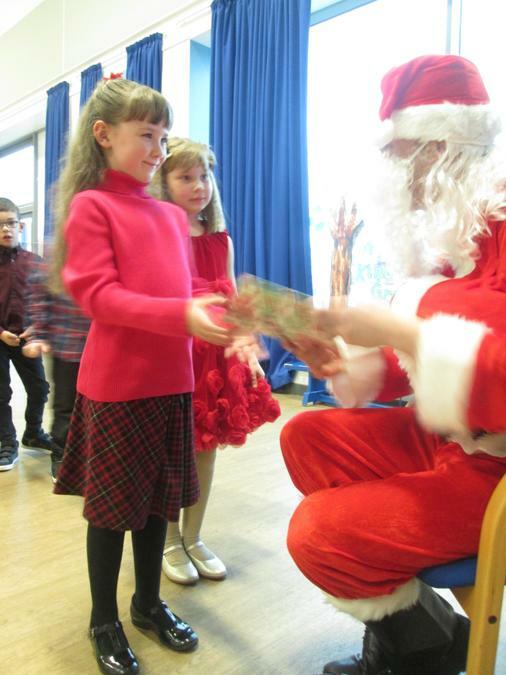 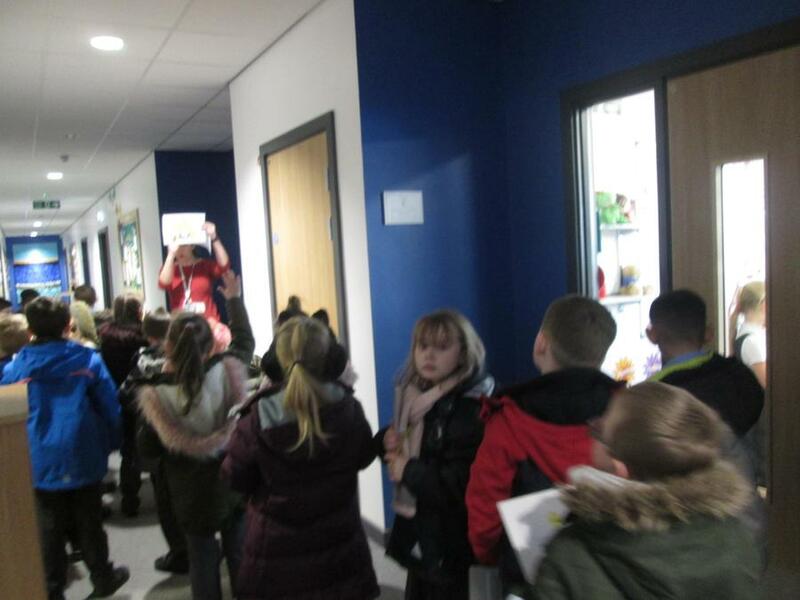 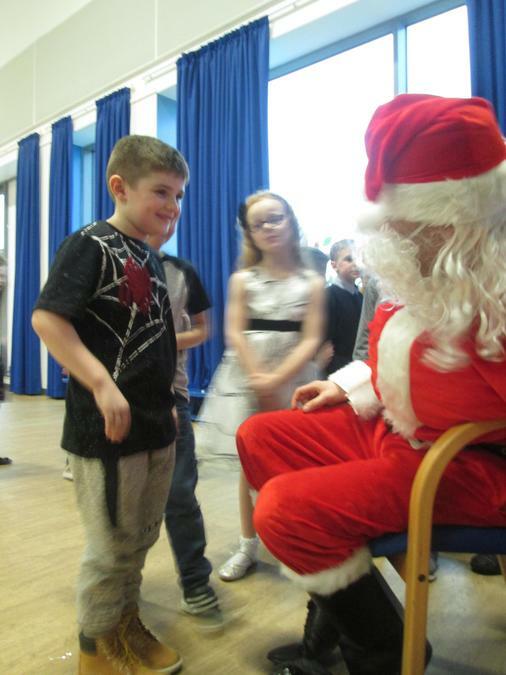 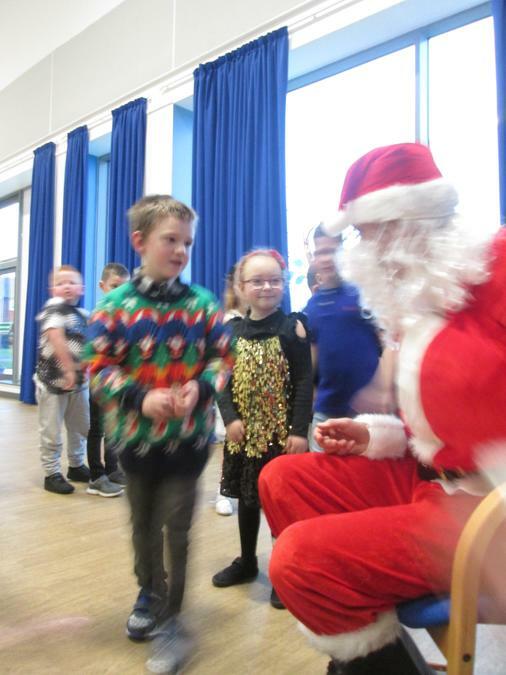 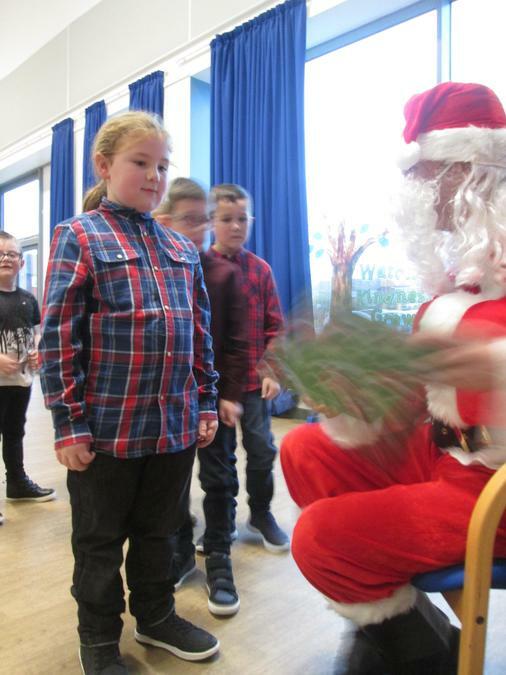 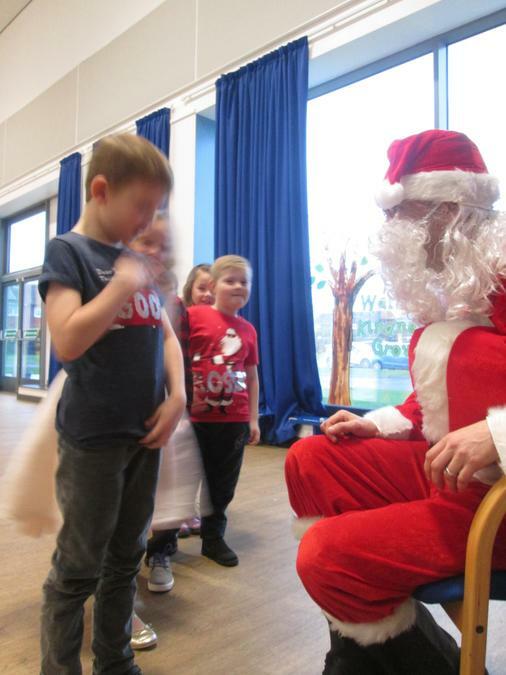 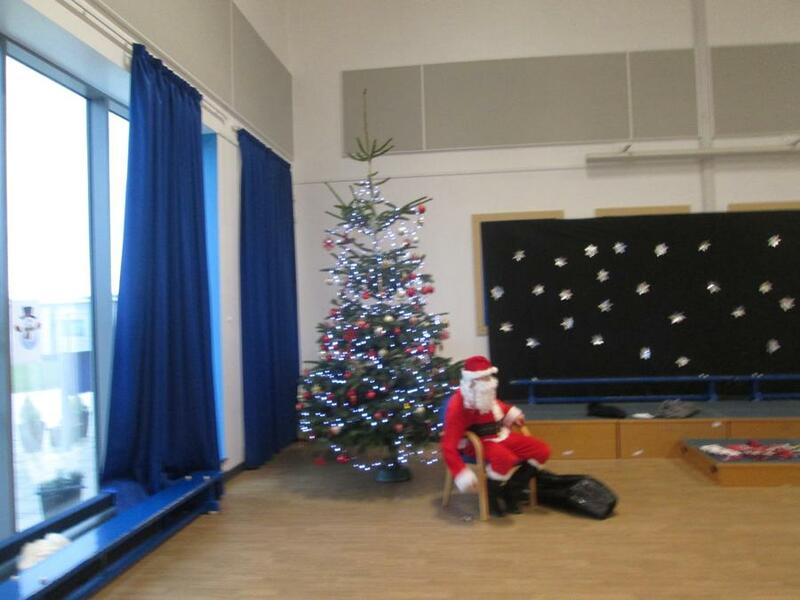 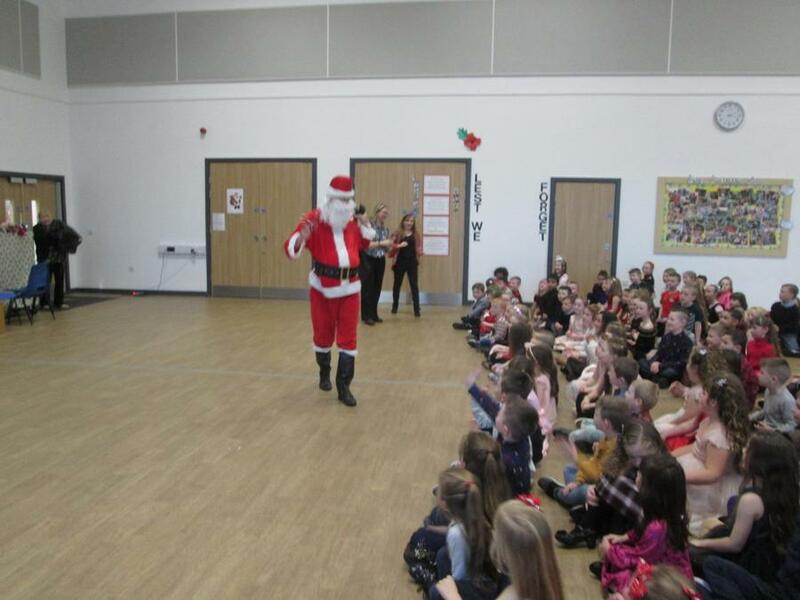 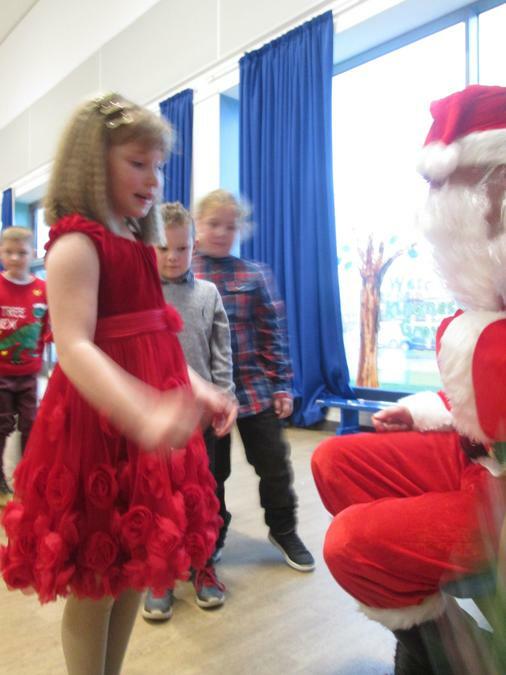 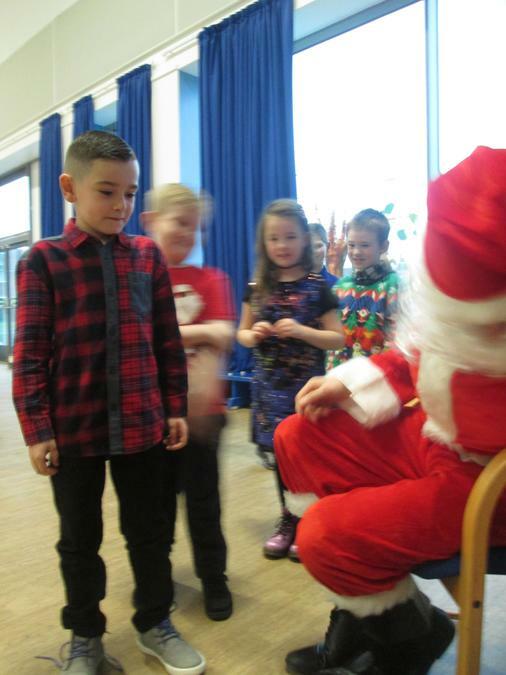 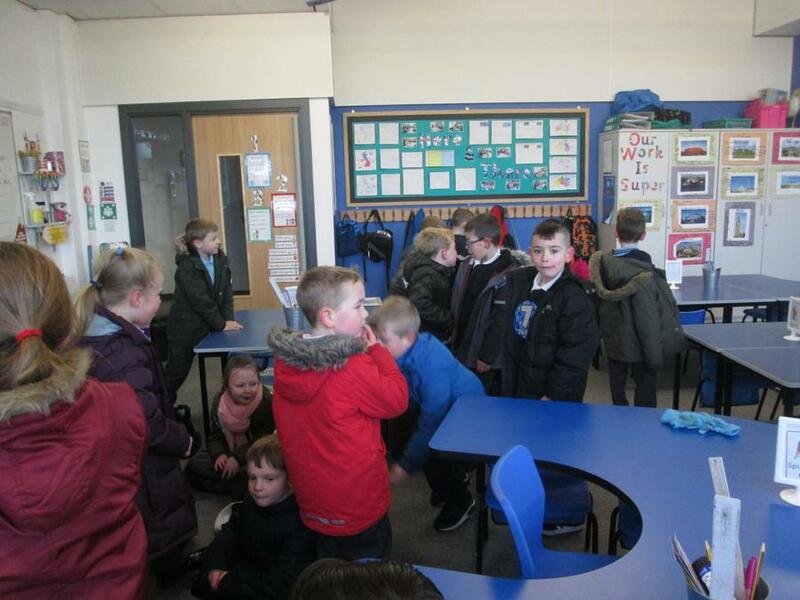 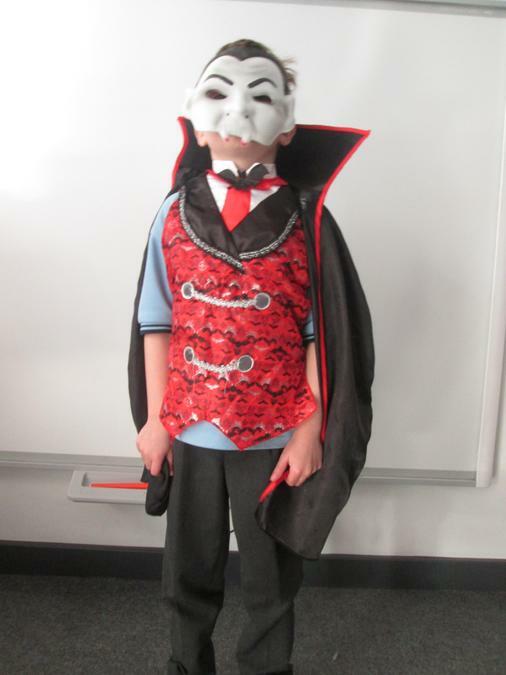 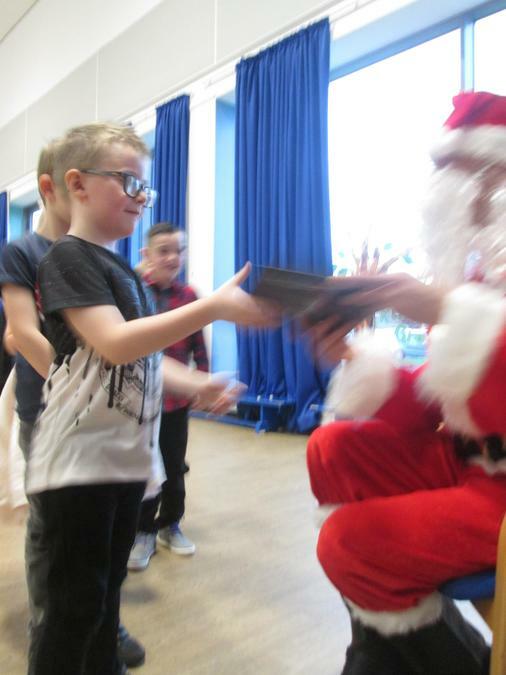 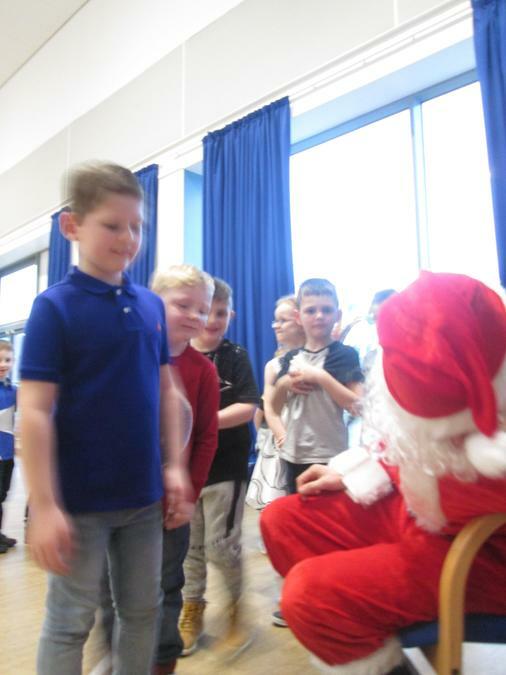 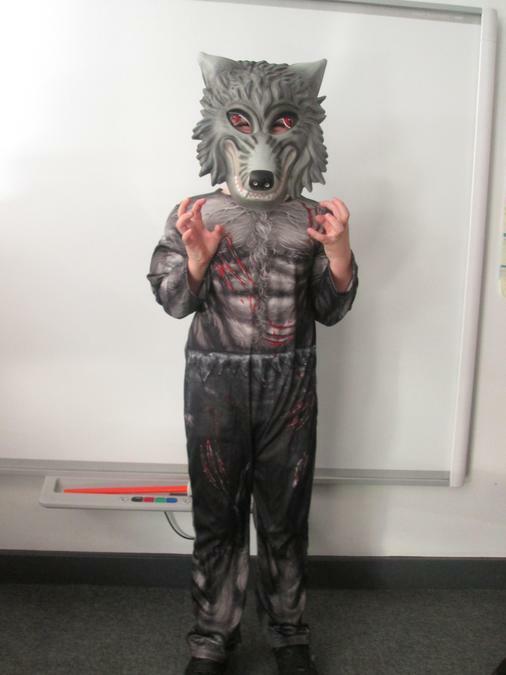 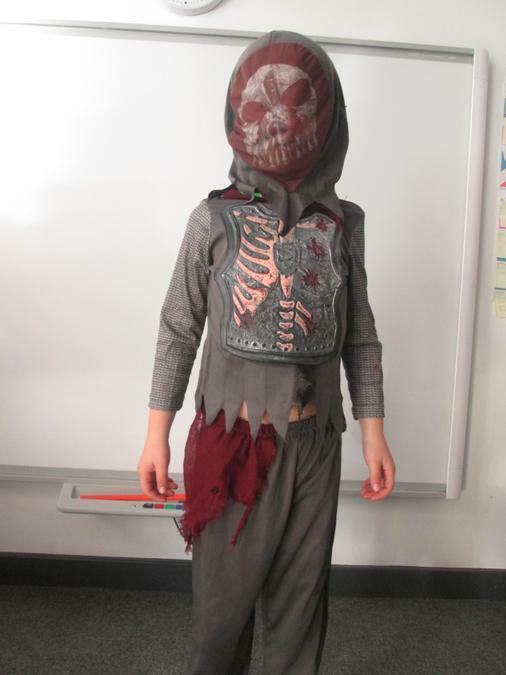 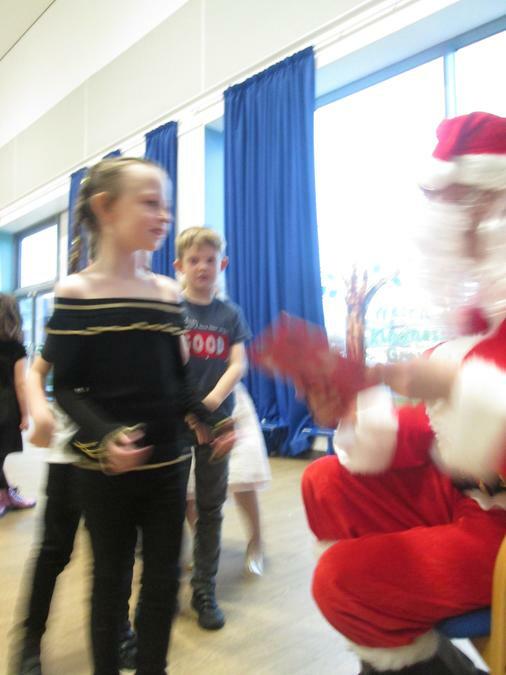 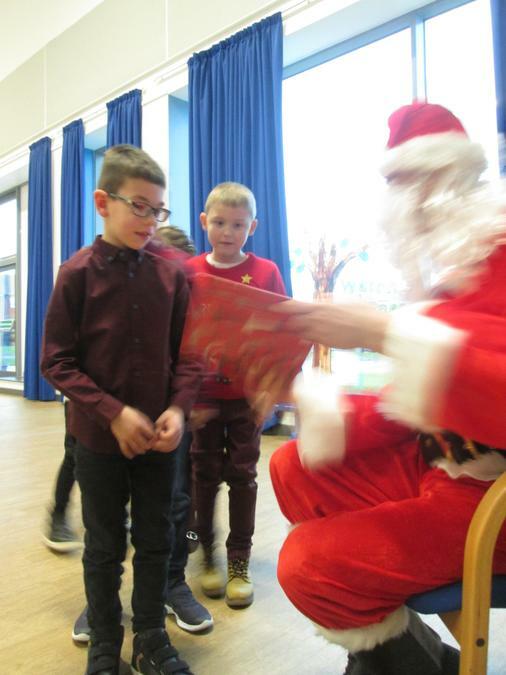 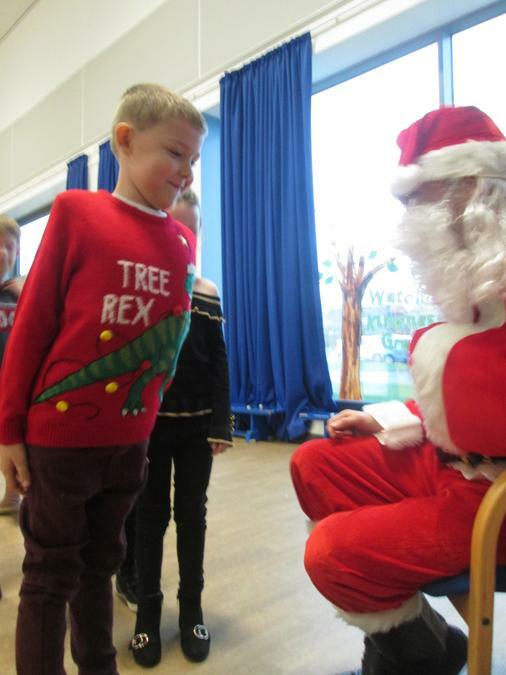 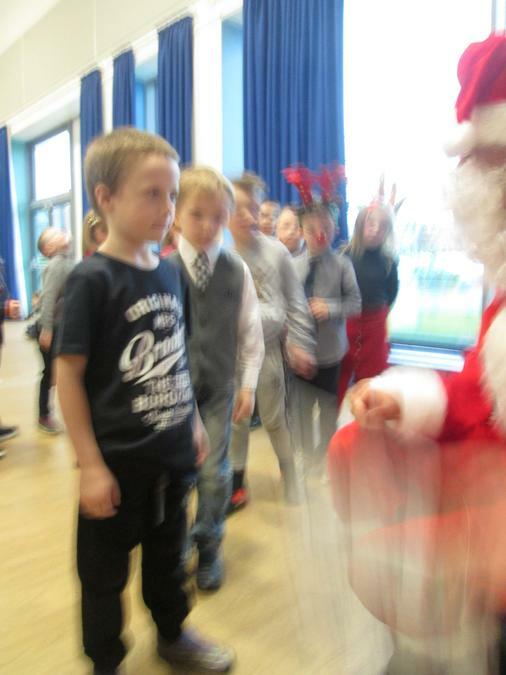 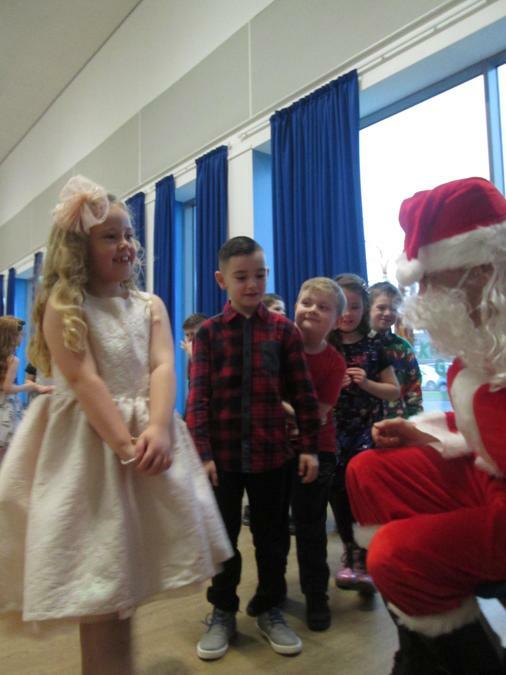 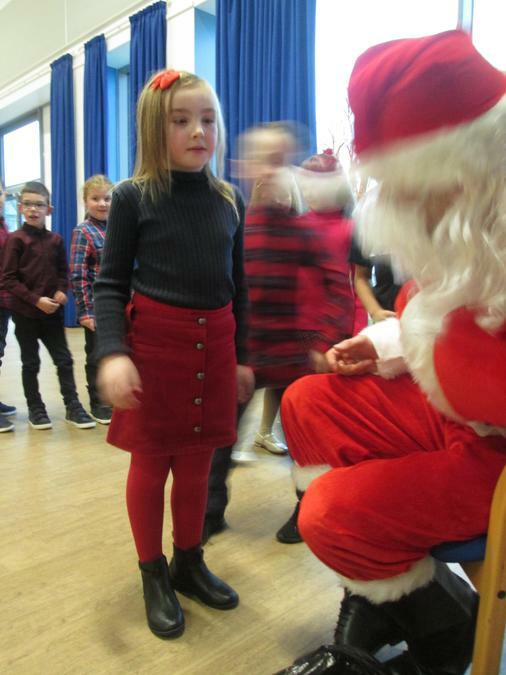 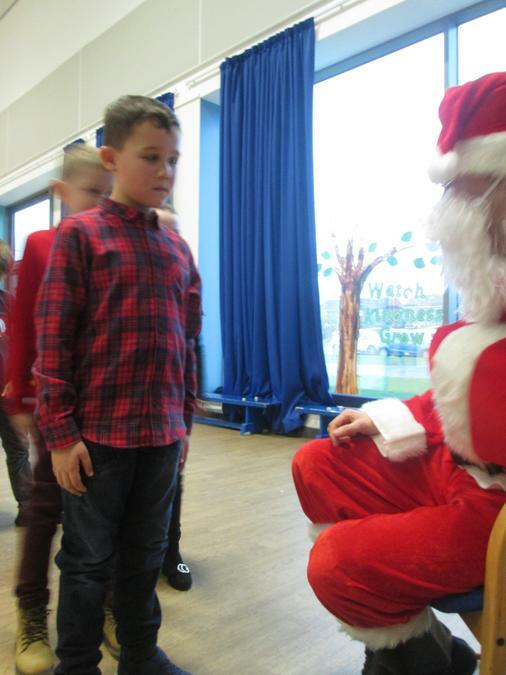 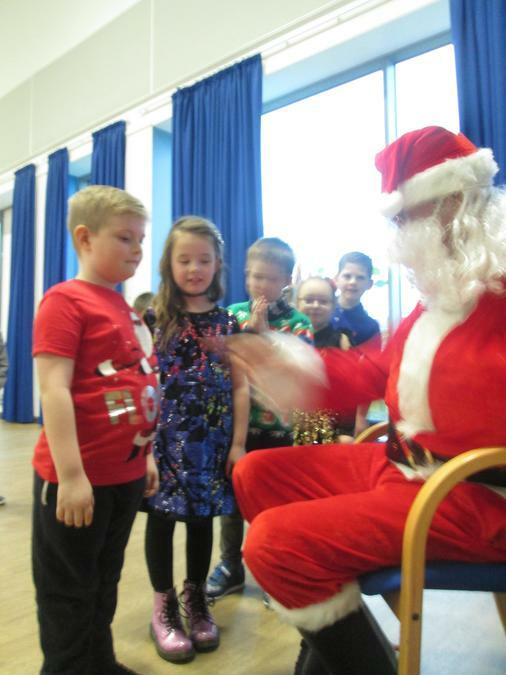 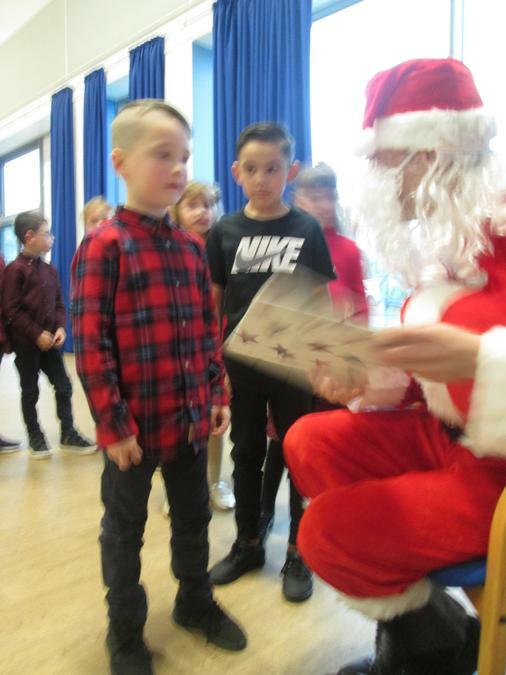 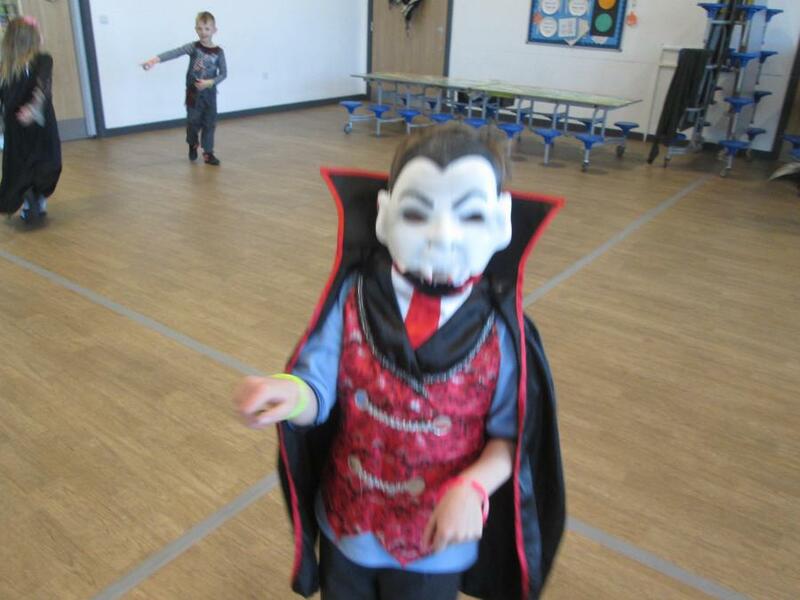 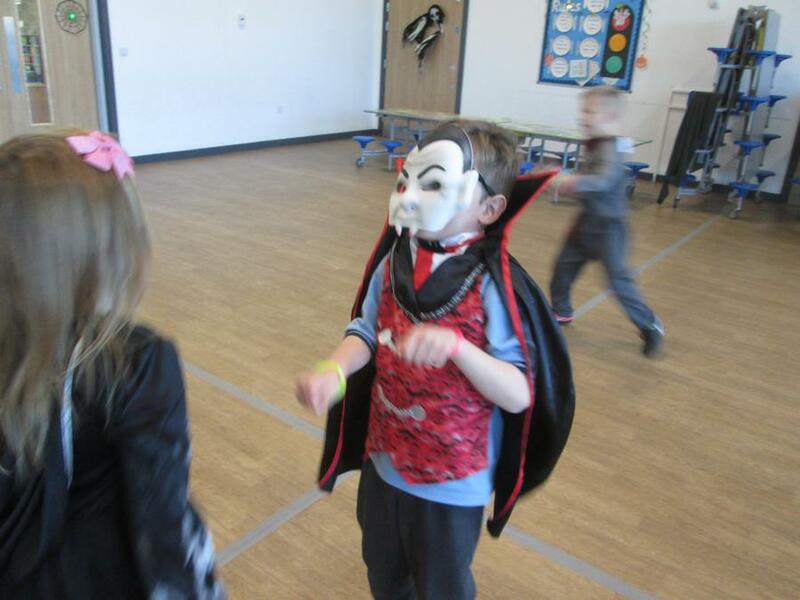 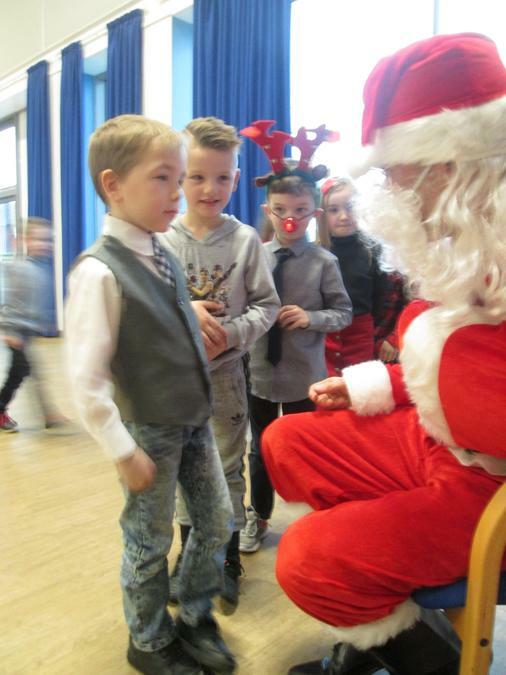 This afternoon during our Creative Curriculum lesson we had a knock on our door from some very exciting visitors. 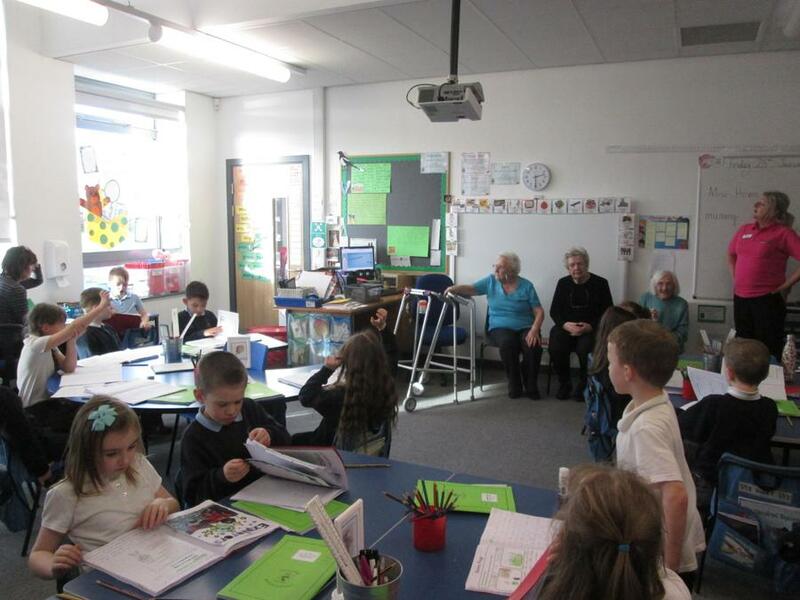 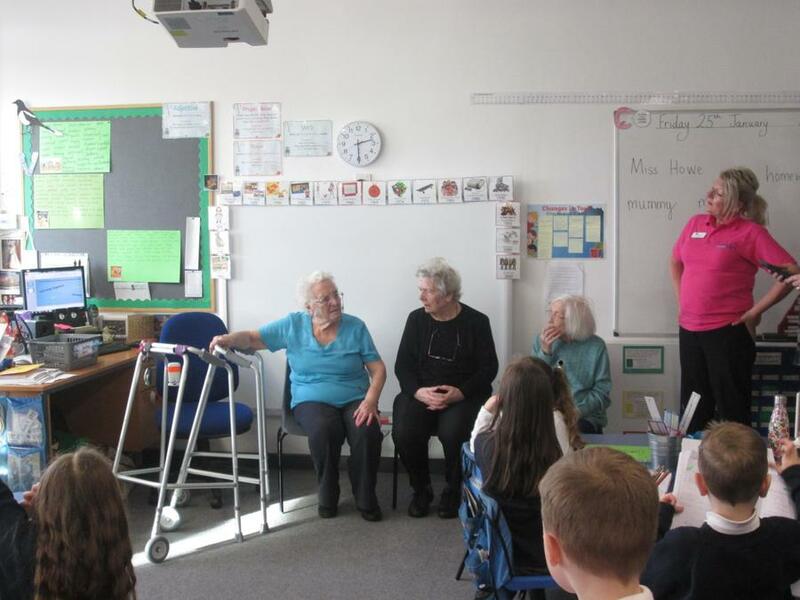 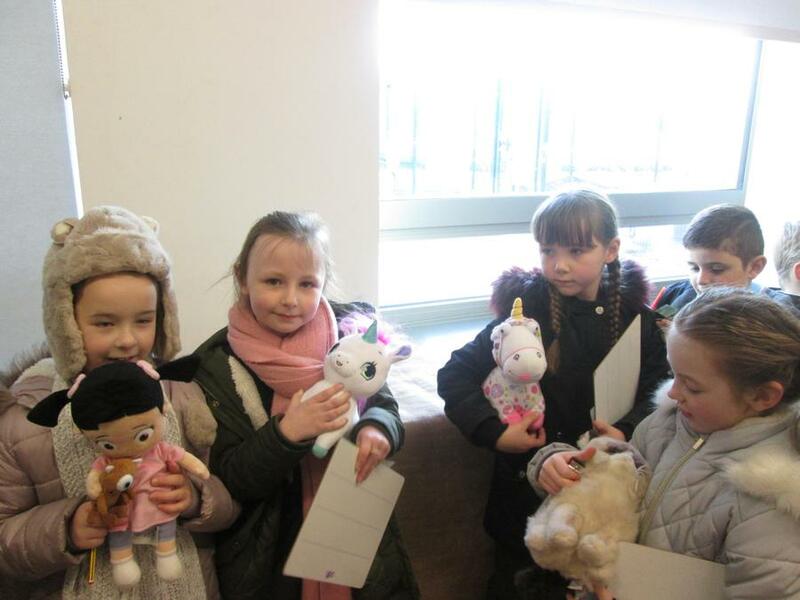 Some of the ladies from Priory Court came to visit us and answer some questions that we had about changes to Toys throughout history. 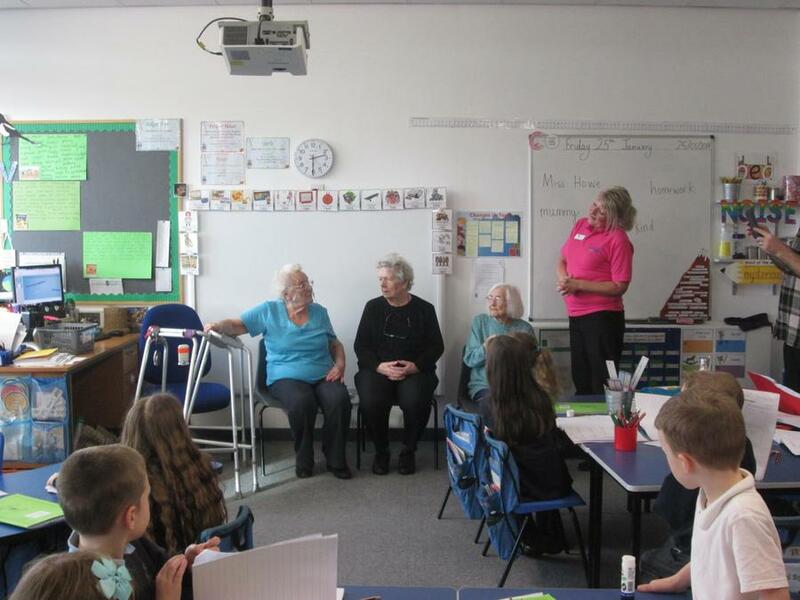 We asked lots of questions and loved hearing about the toys that the ladies remembered playing with when they were younger. 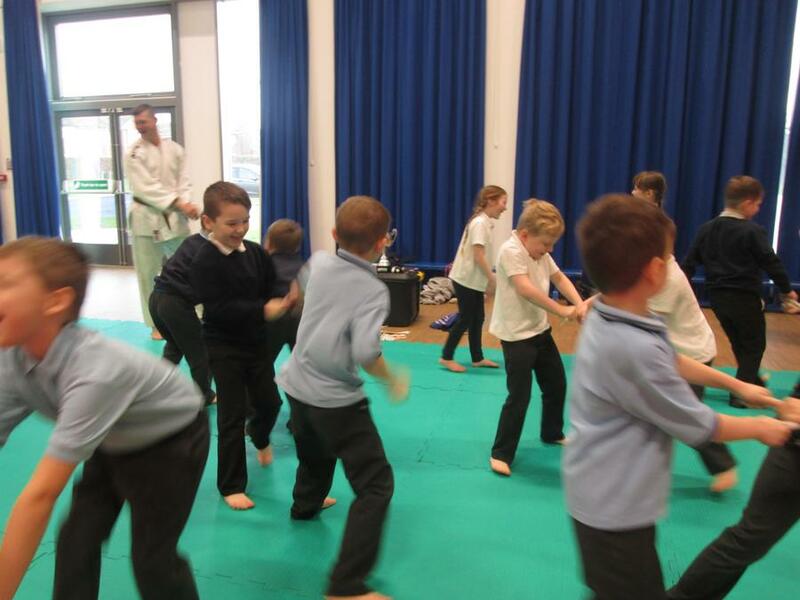 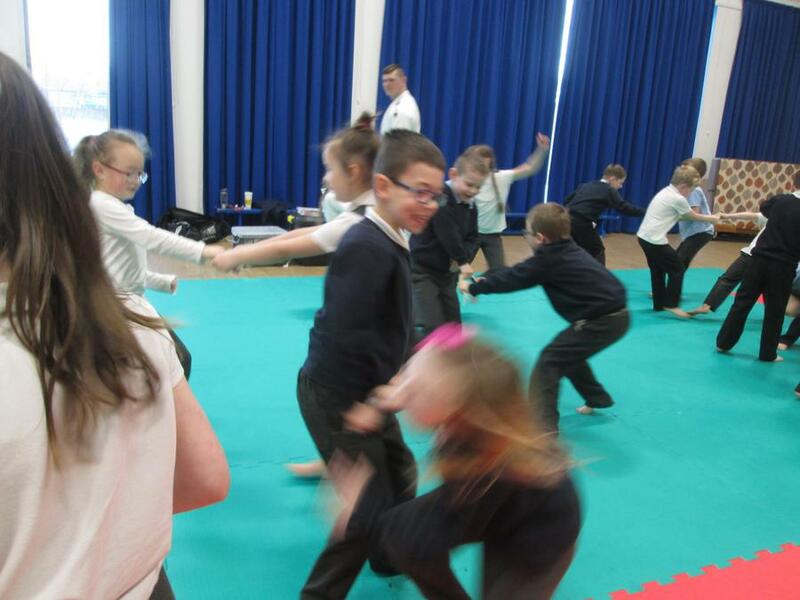 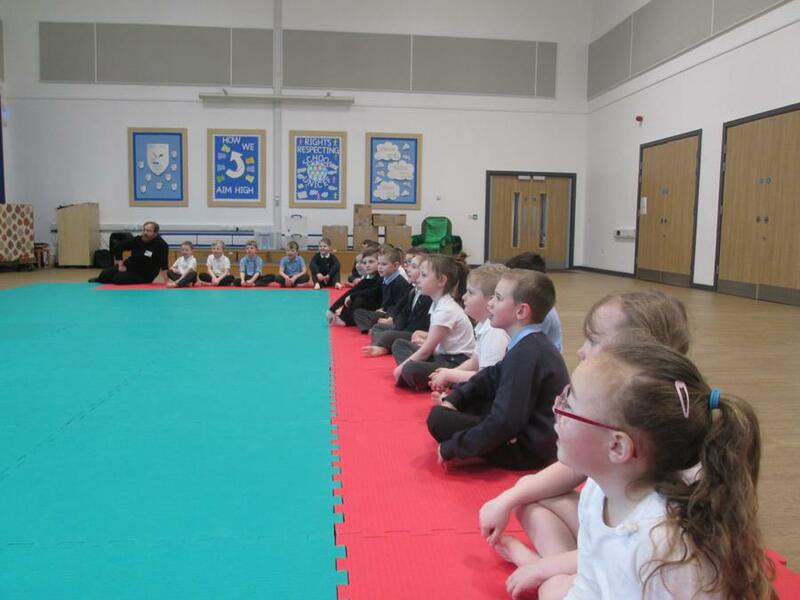 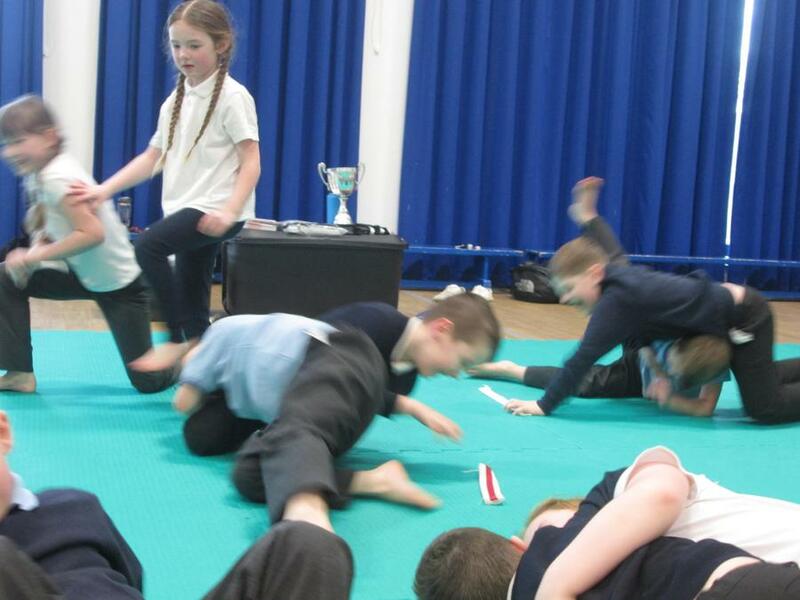 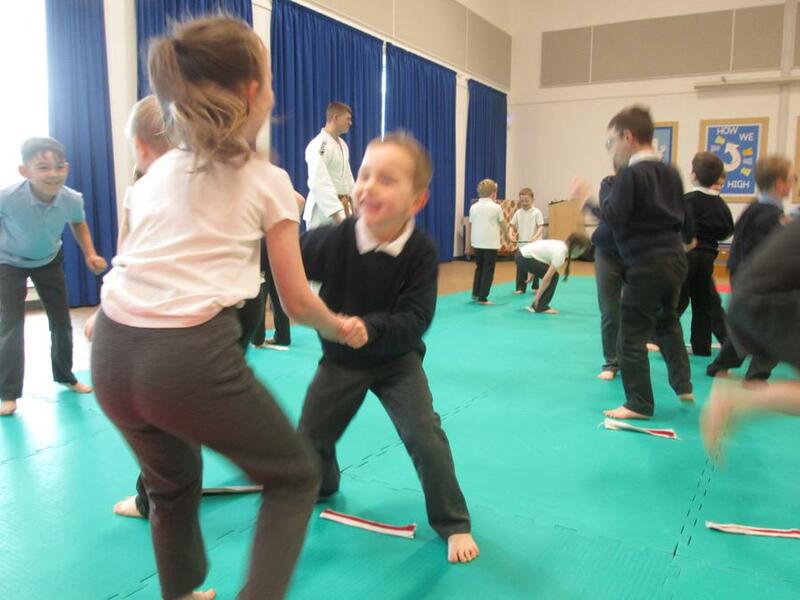 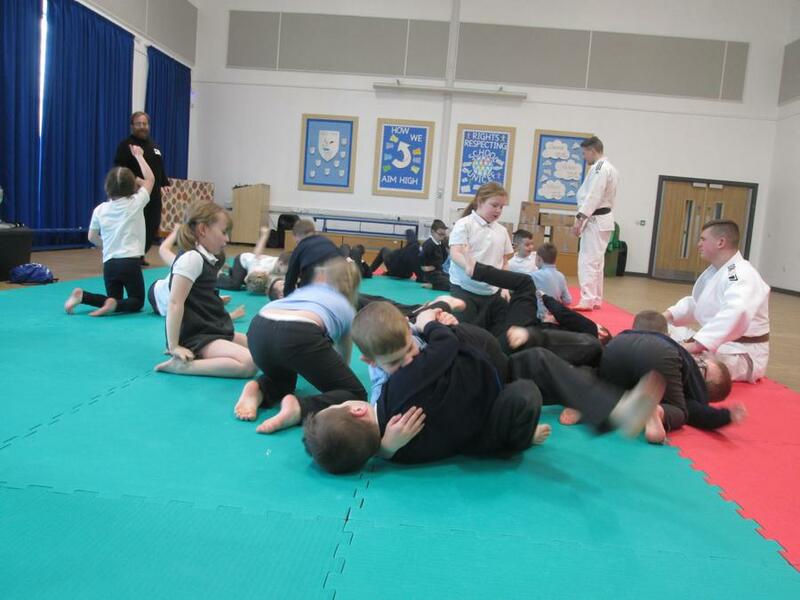 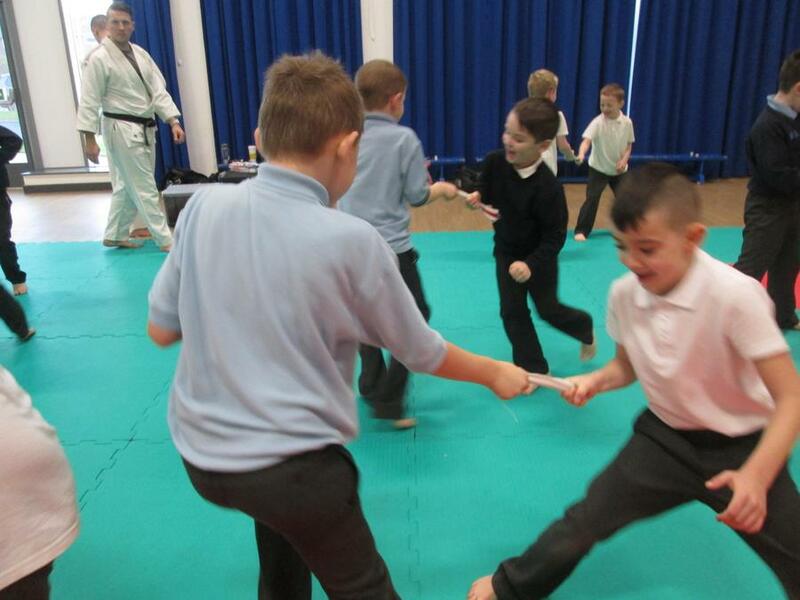 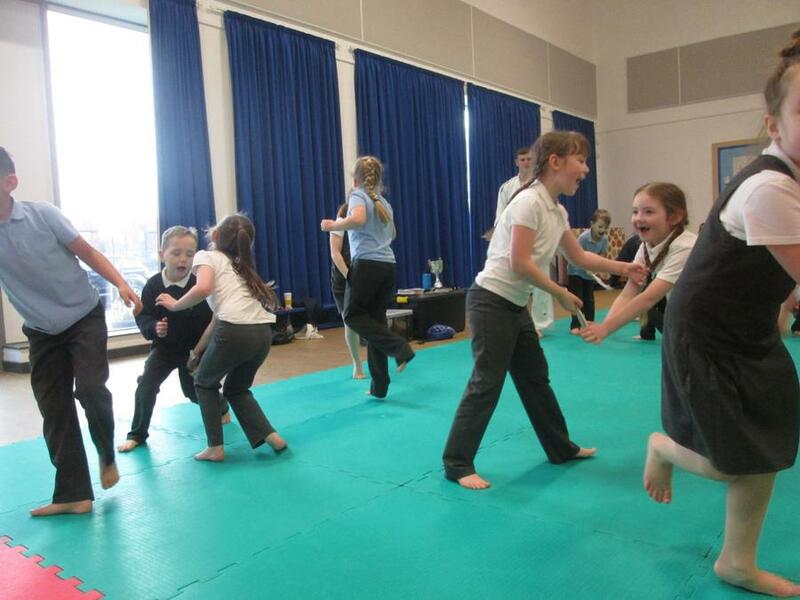 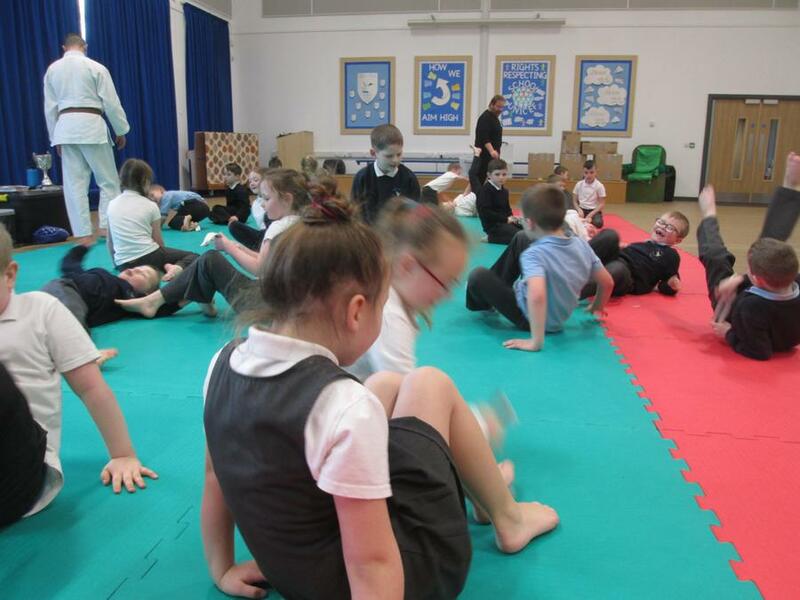 We had so much fun during our Judo taster this morning. 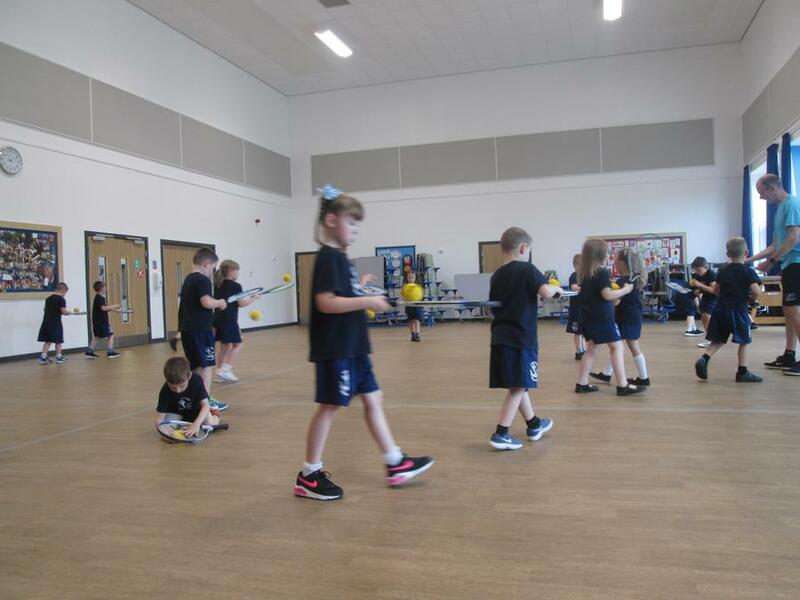 We played some attacking and defending games, learned some holds and had some fun working with a partner! 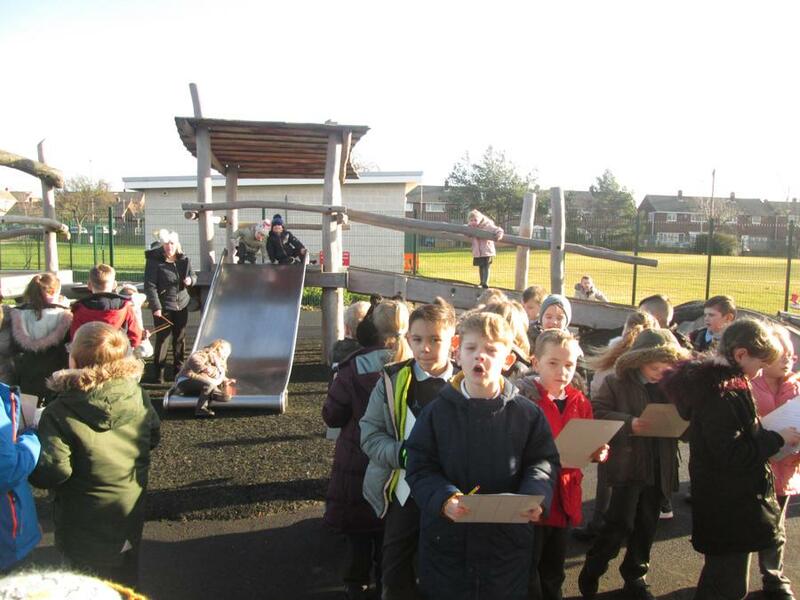 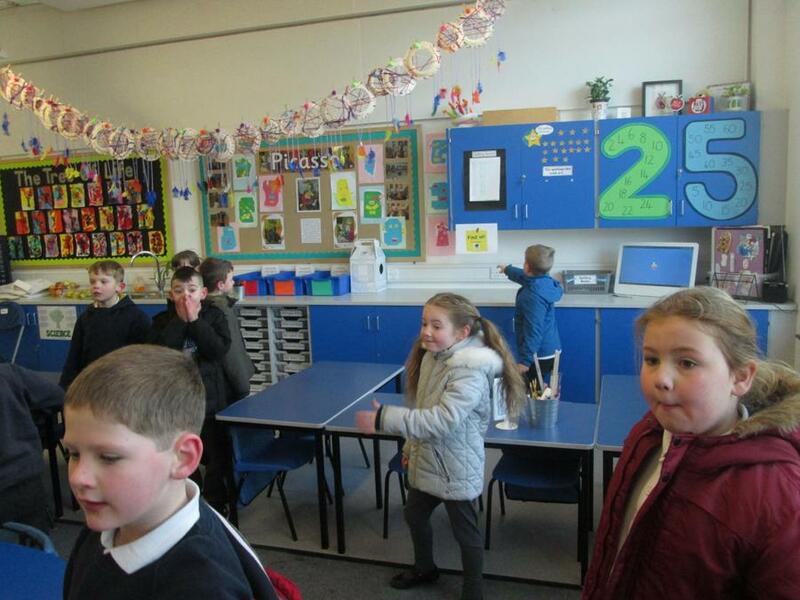 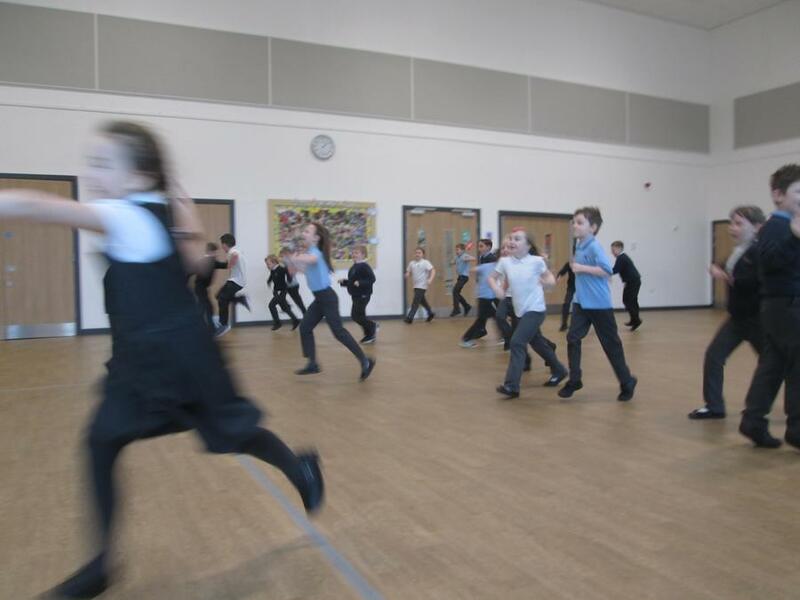 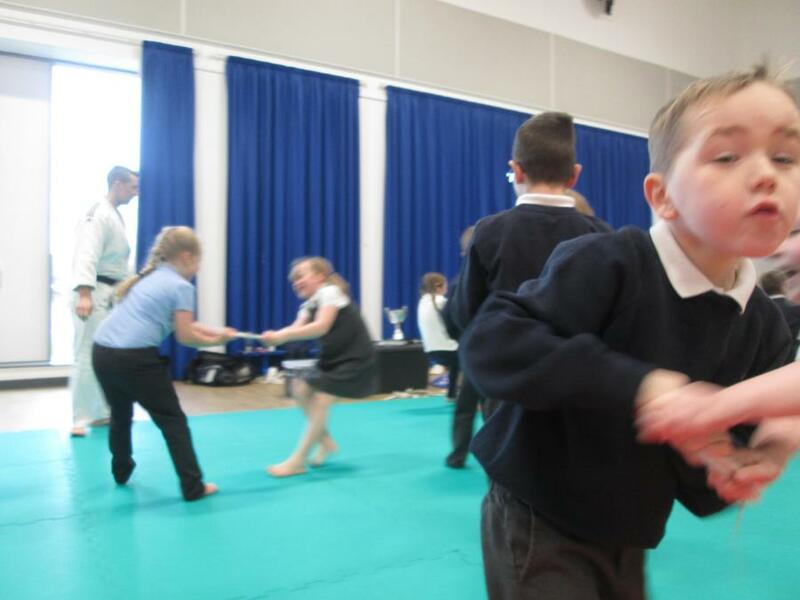 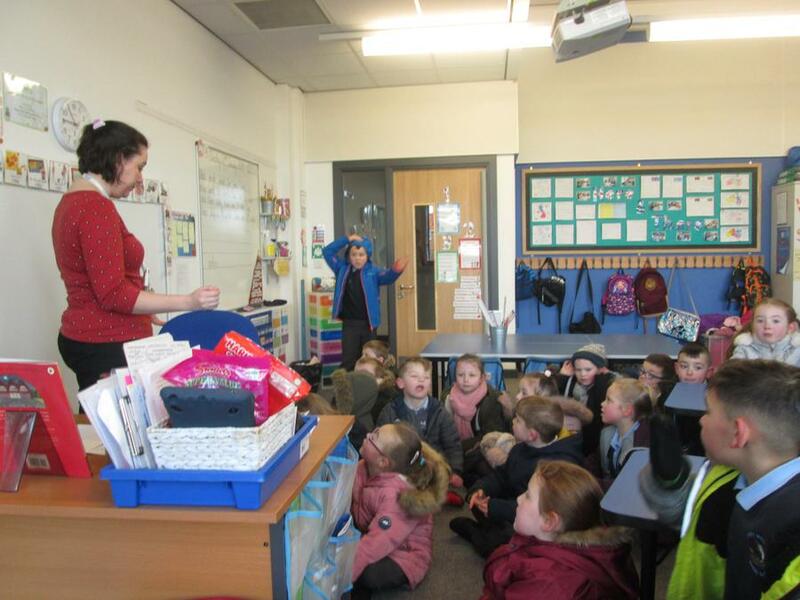 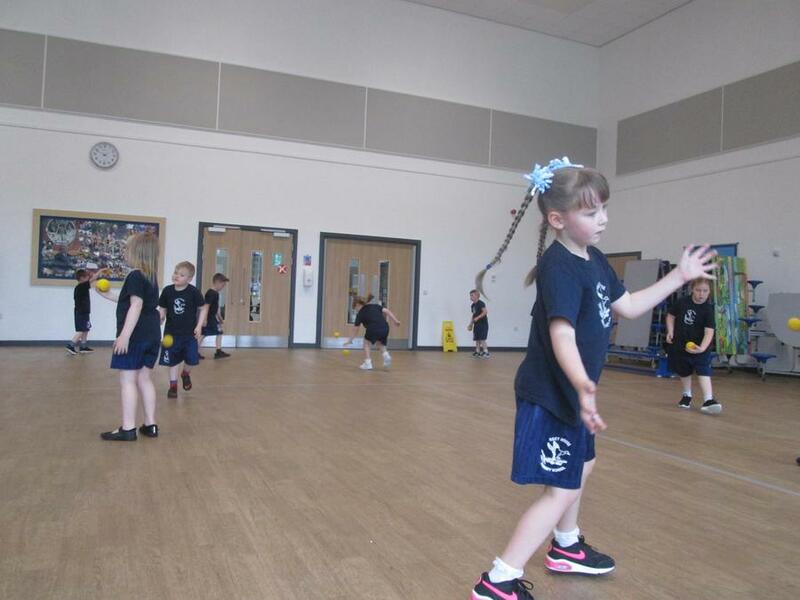 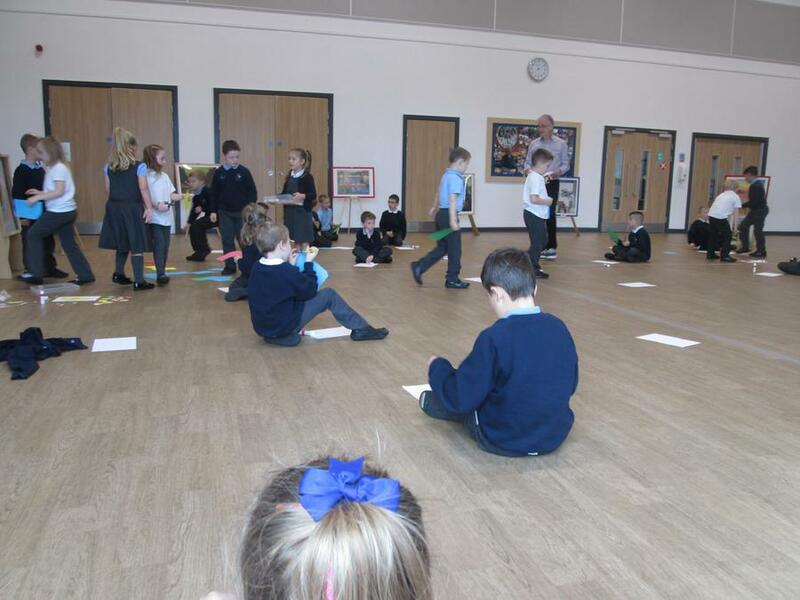 Mrs Locke was quite surprised how competitive year 2 were! 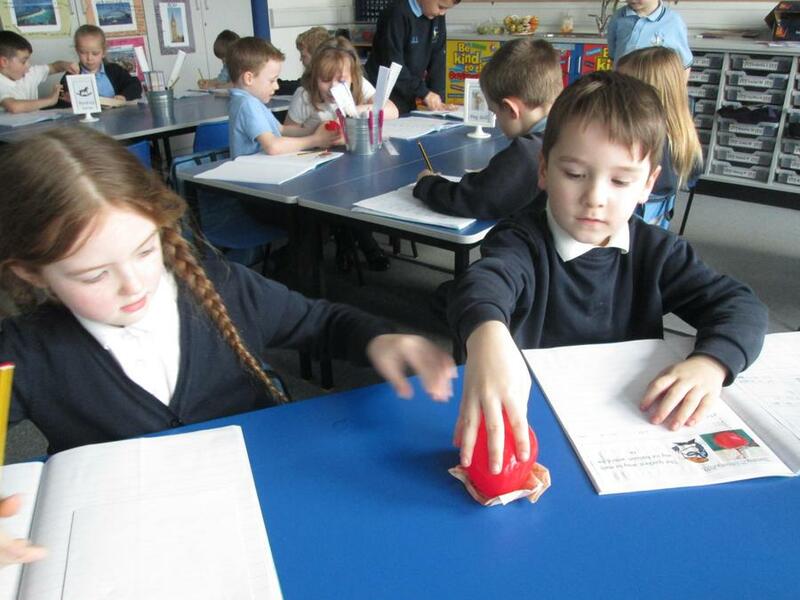 This afternoon for our creative curriculum lesson we had a great time handling some toys from the past. 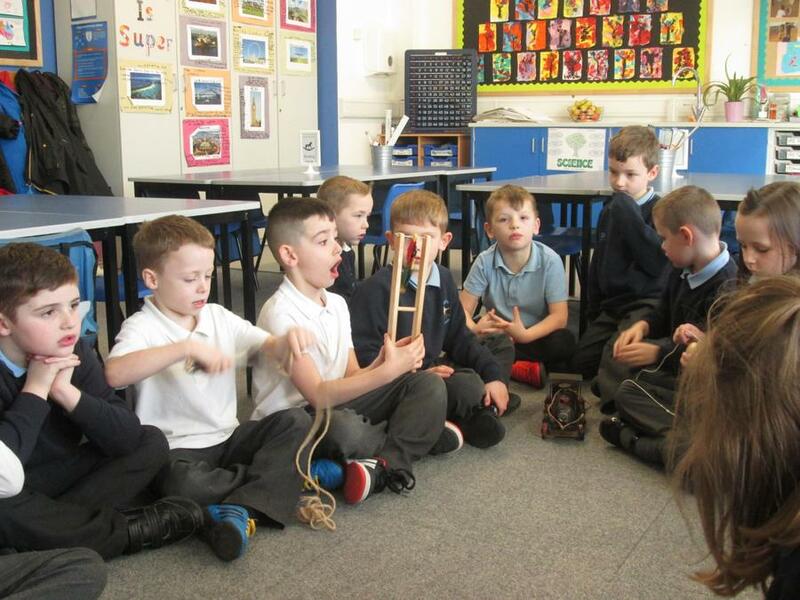 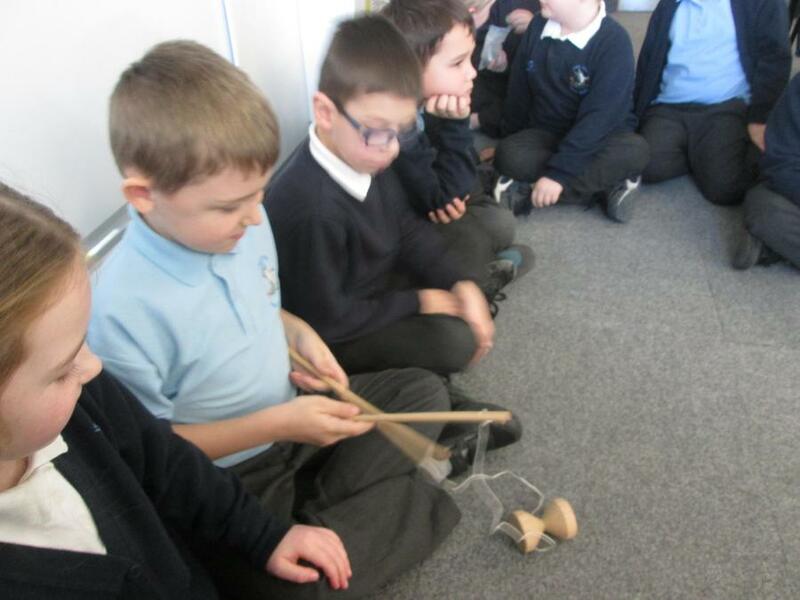 We looked carefully at what the toys were made of, compared them to toys that we play with now and also had a go at playing with some of them. 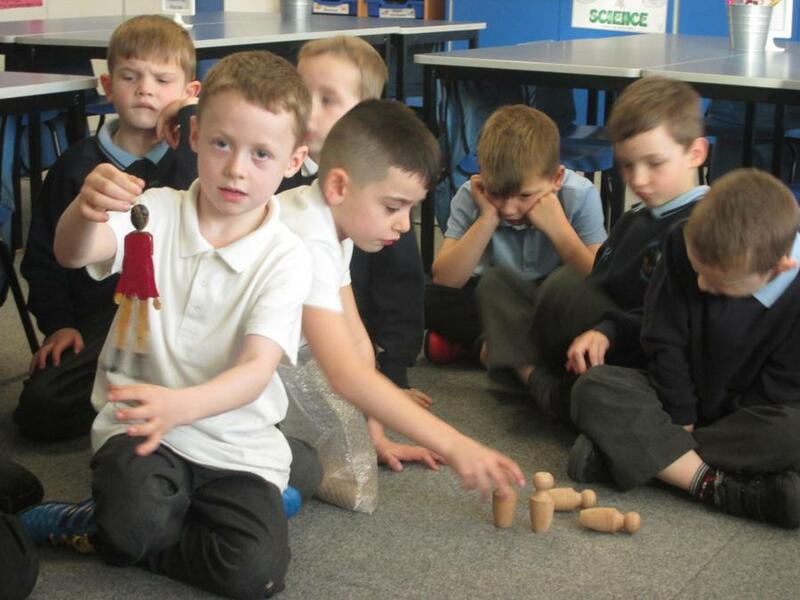 We noticed that lots of the toys from the past were made out of wood and talked about our toys today mainly being made out of plastic. 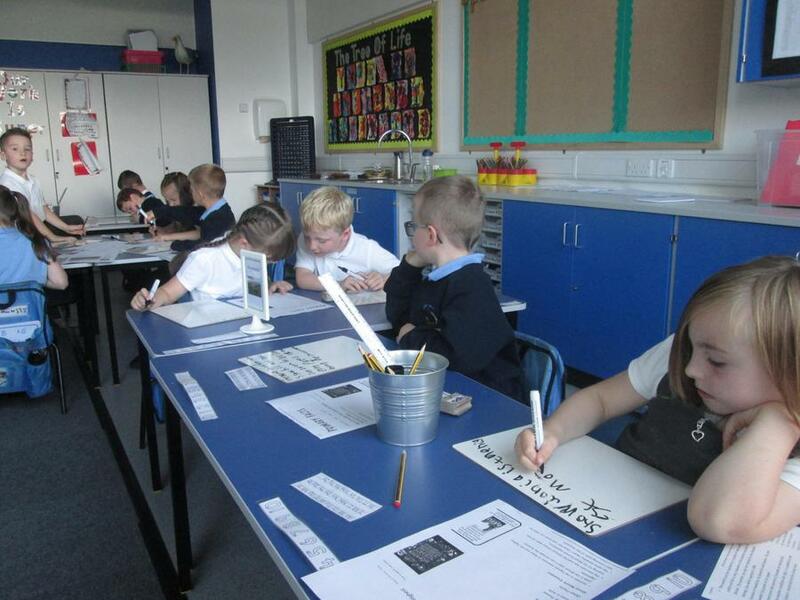 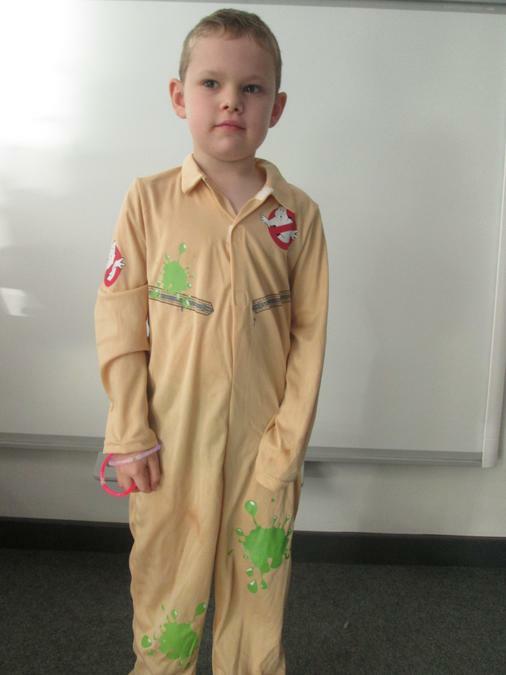 This morning in science Miss Howe planned a really exciting investigation for us all! 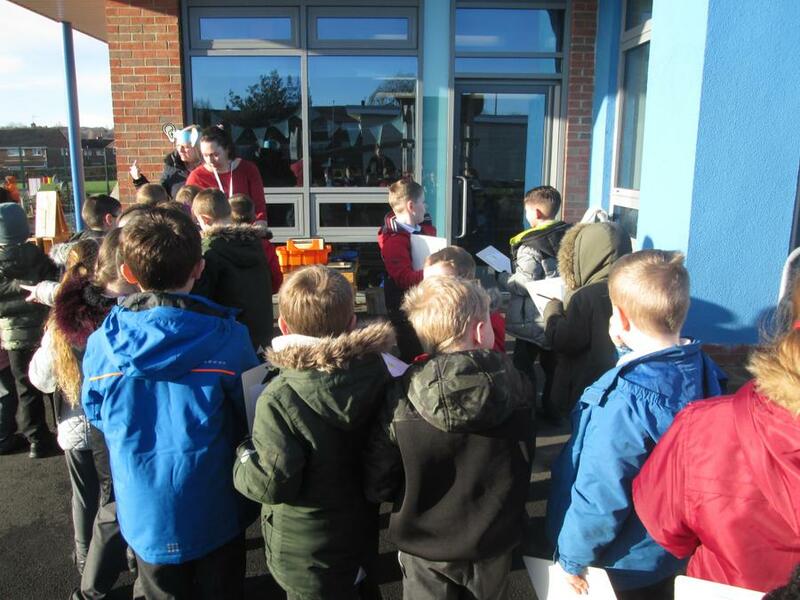 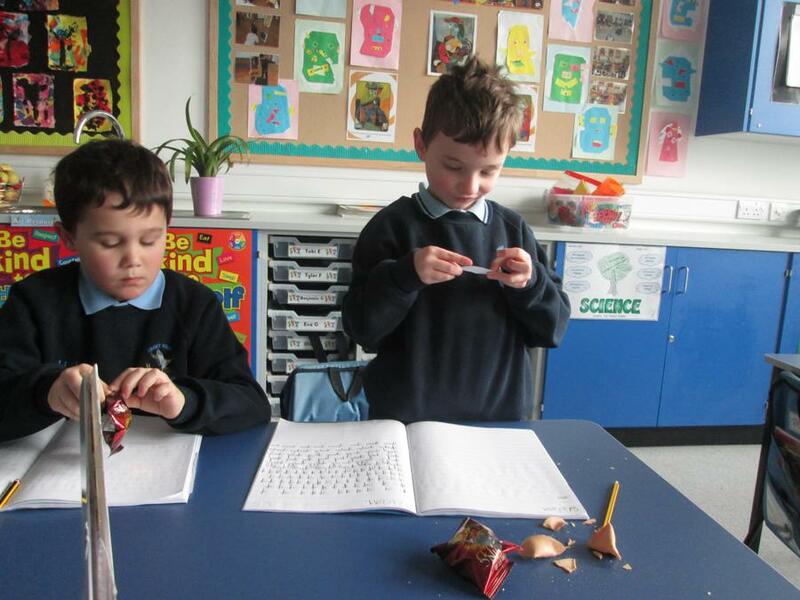 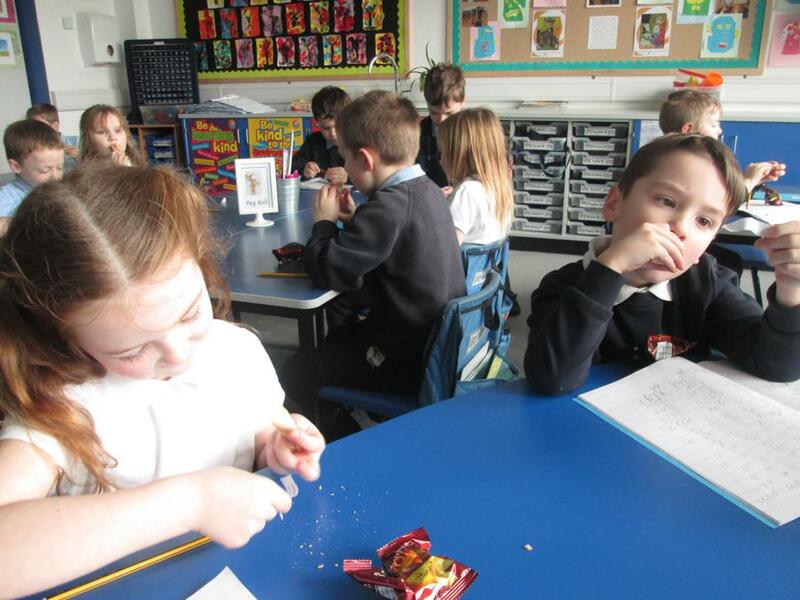 We were looking closely at materials and some of the properties that they have. 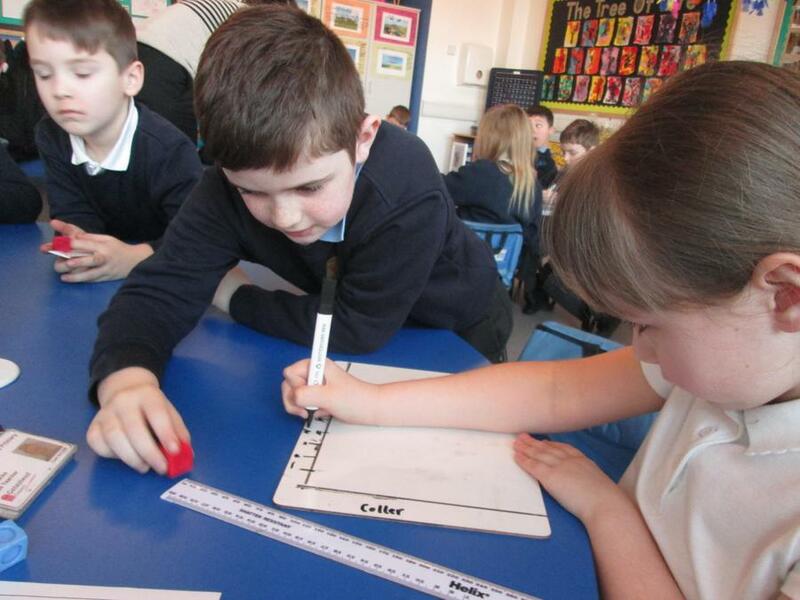 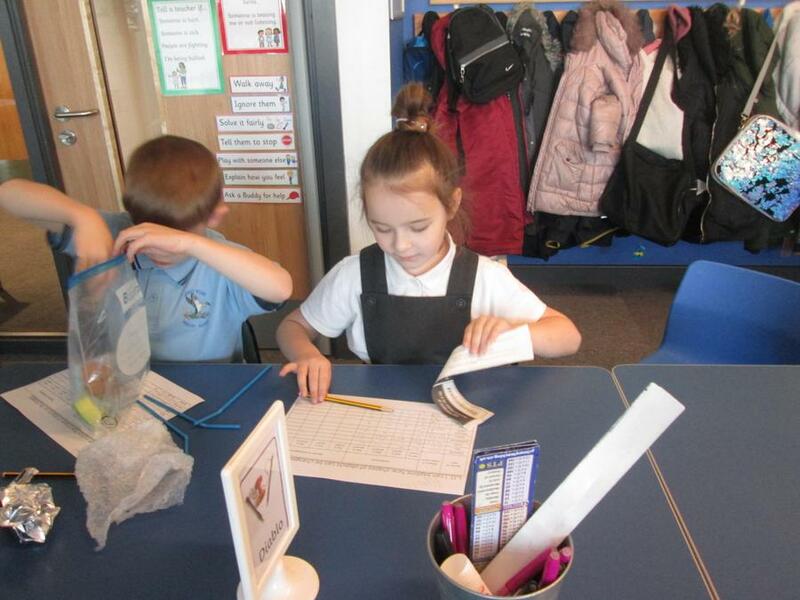 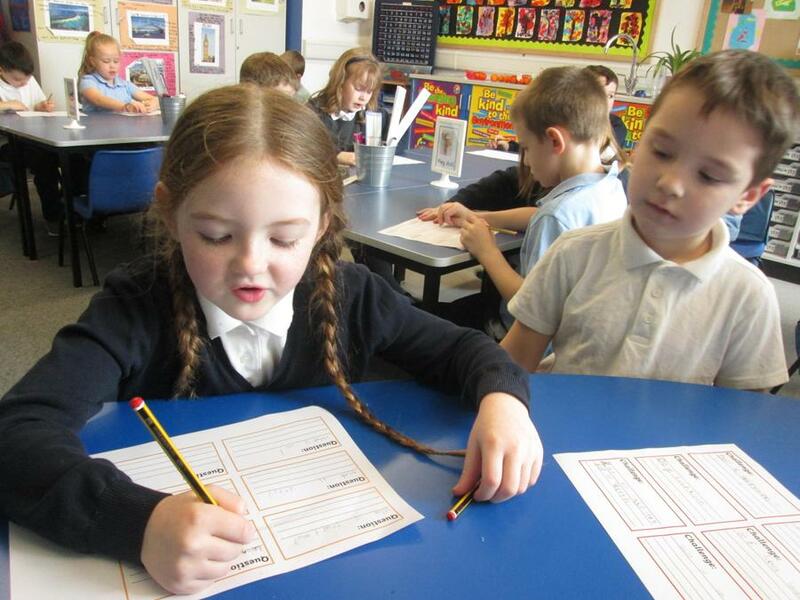 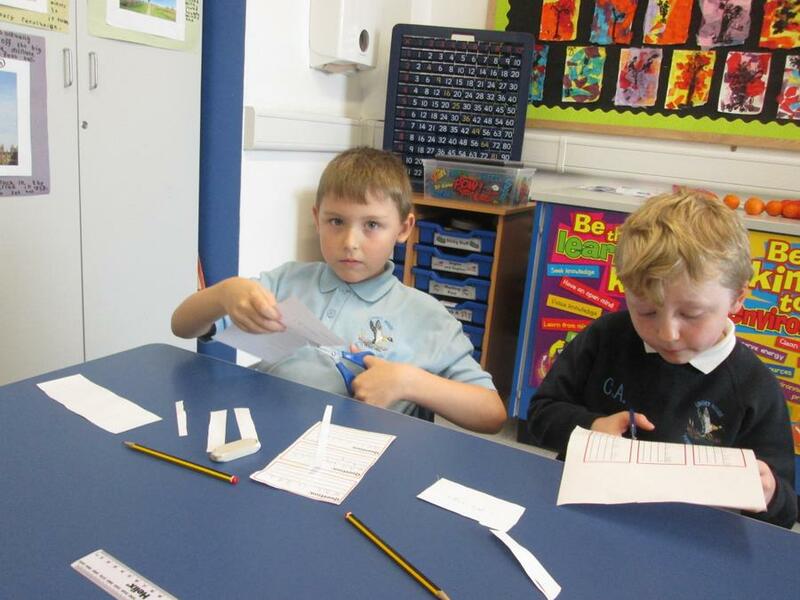 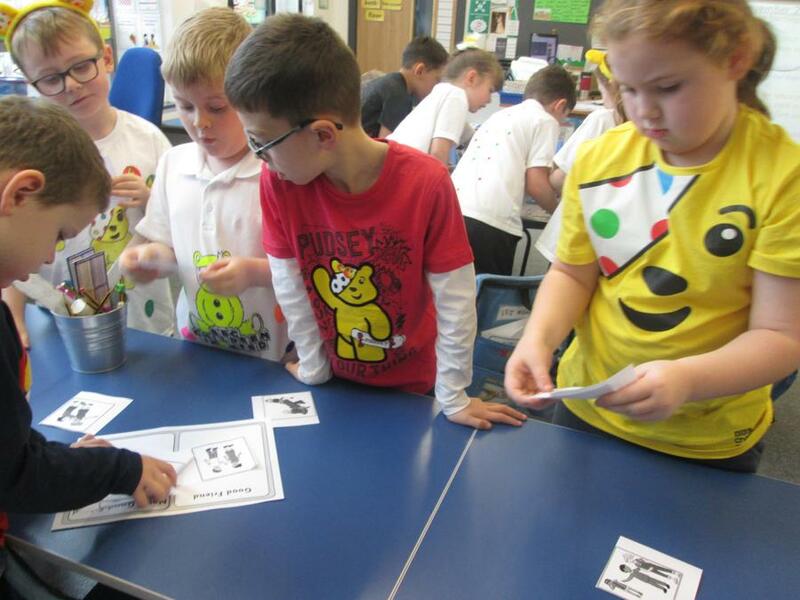 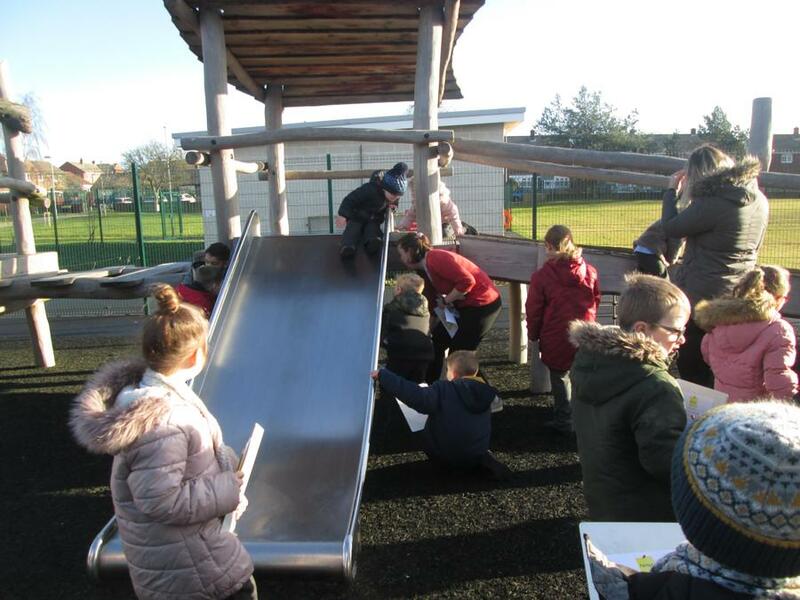 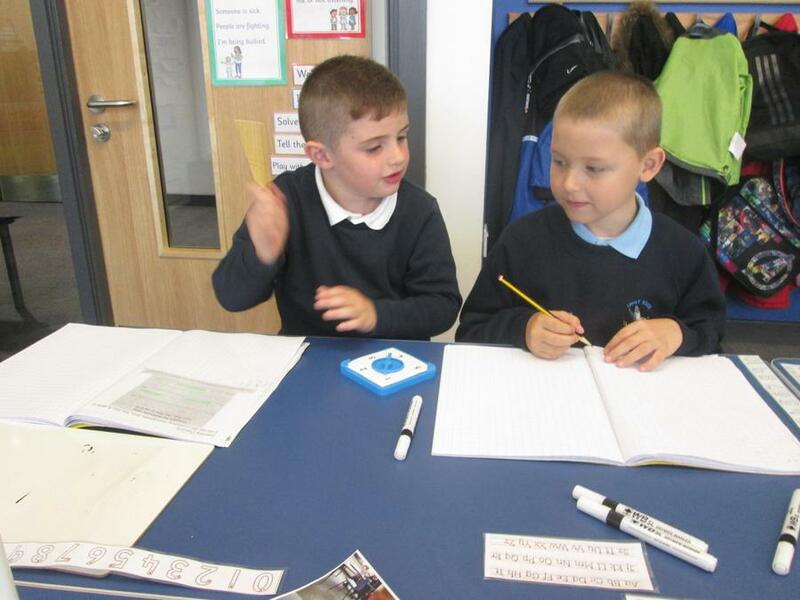 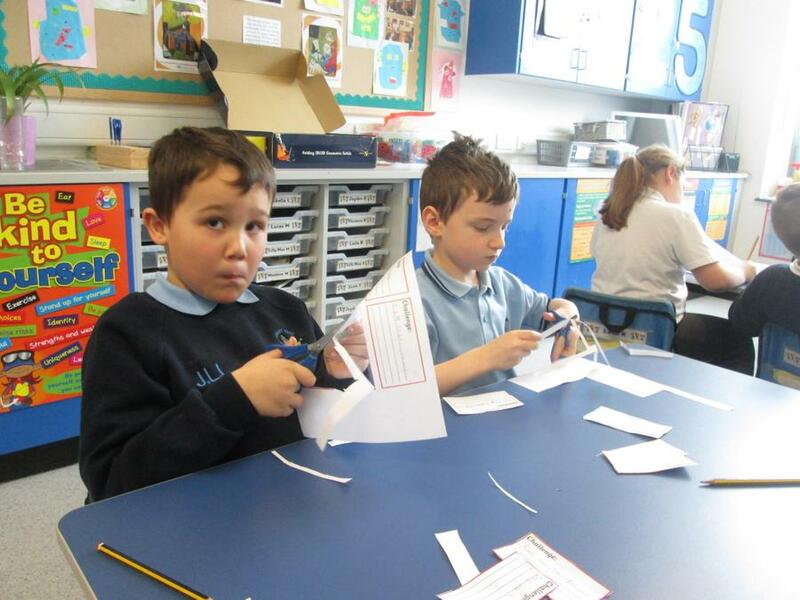 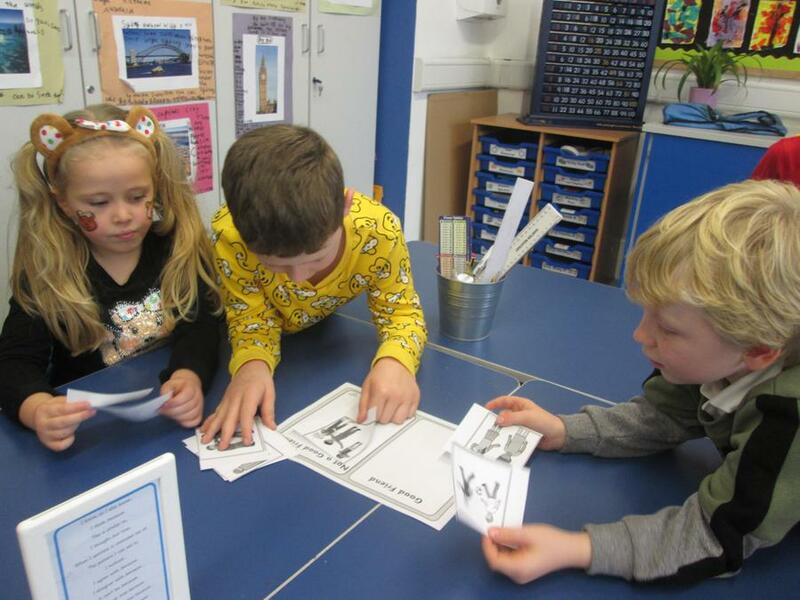 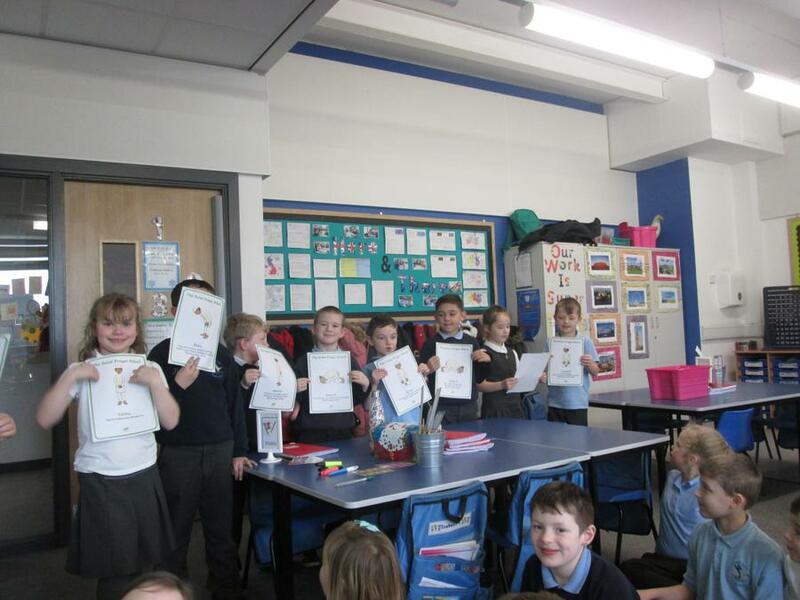 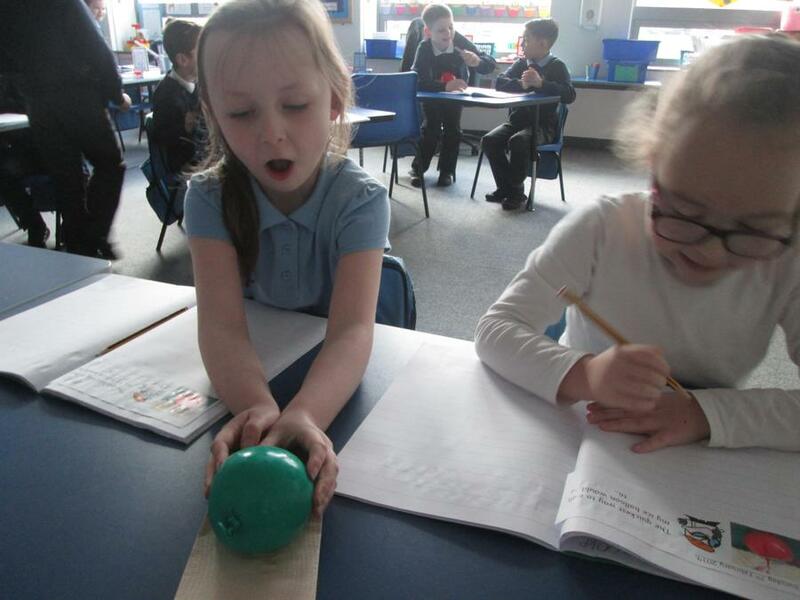 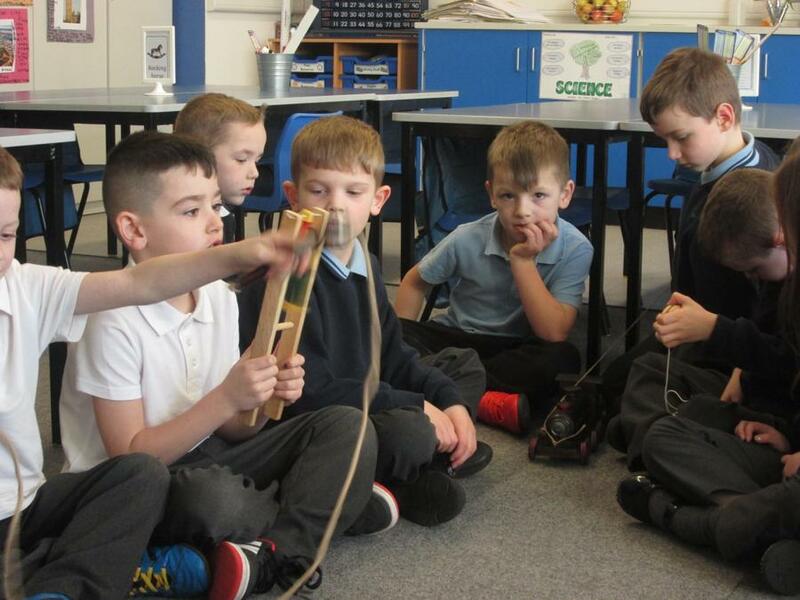 We made sensible predictions and then had a chance to use some of the materials to check if we were correct. 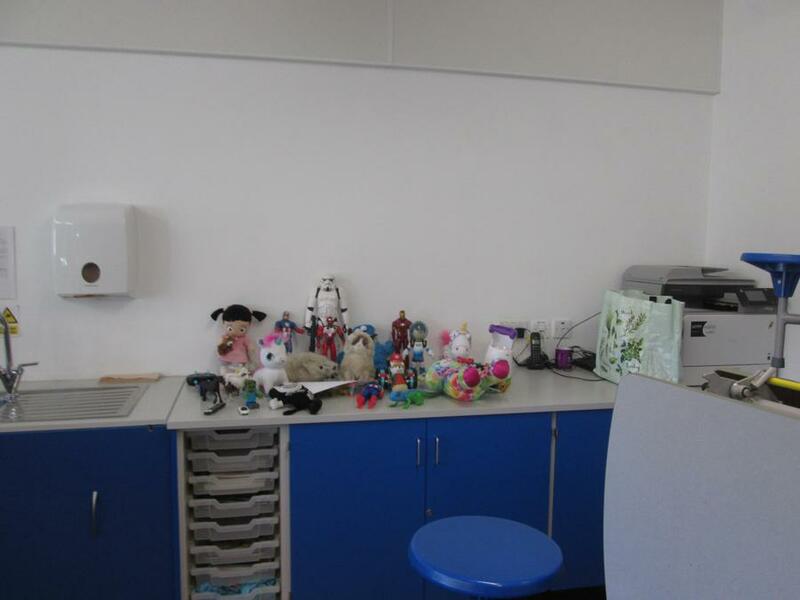 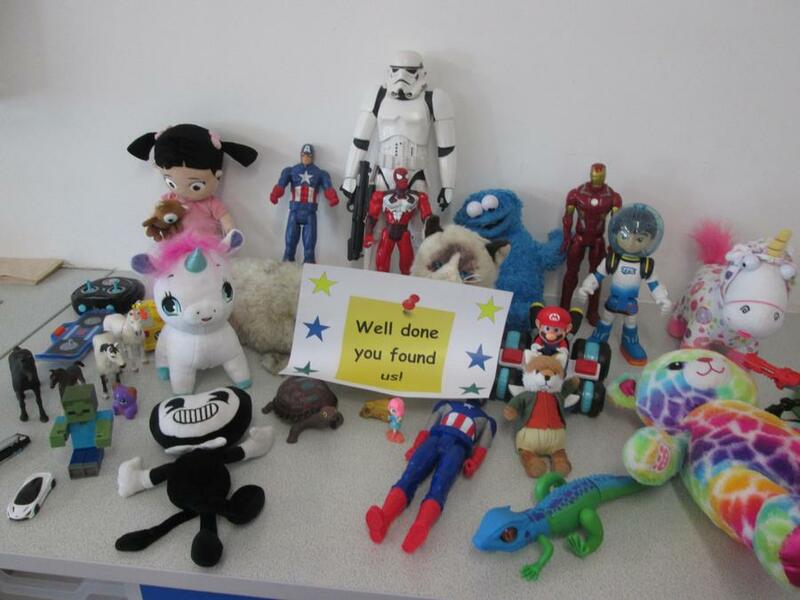 This morning after our break we came back into the classroom to find that all of our toys had disappeared! 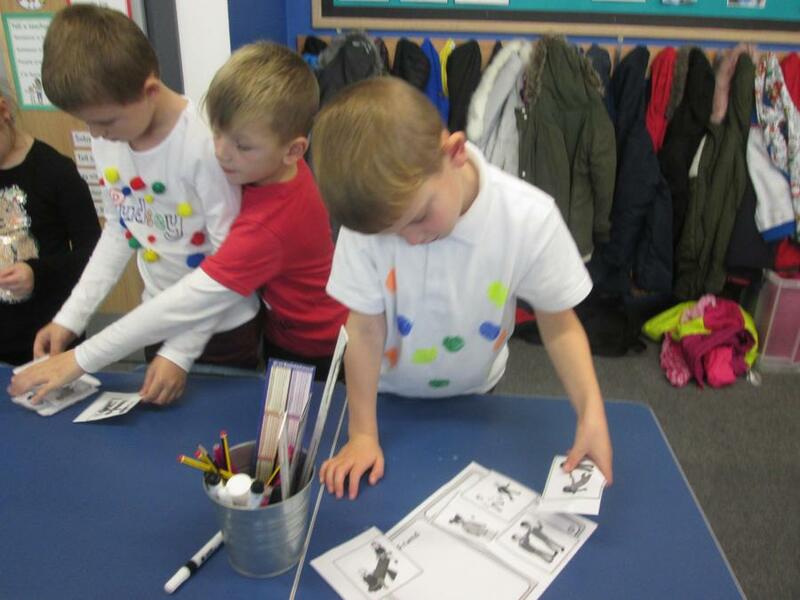 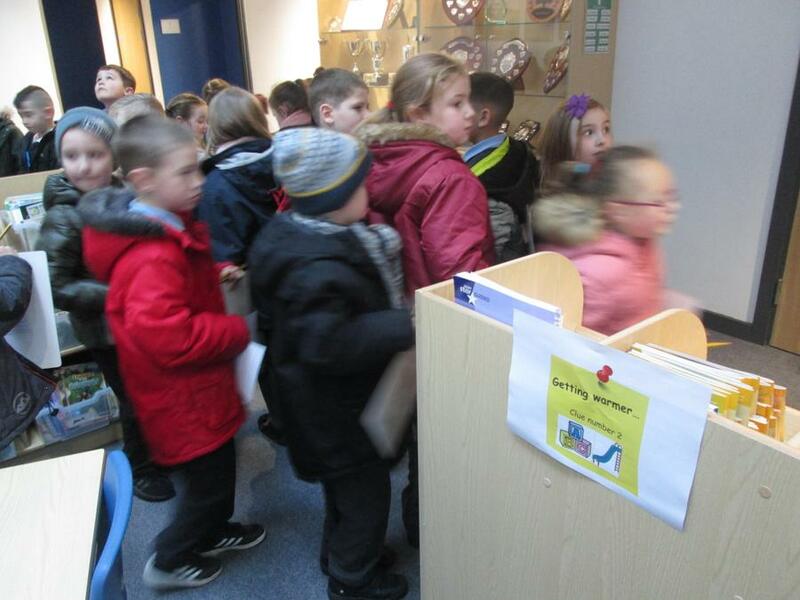 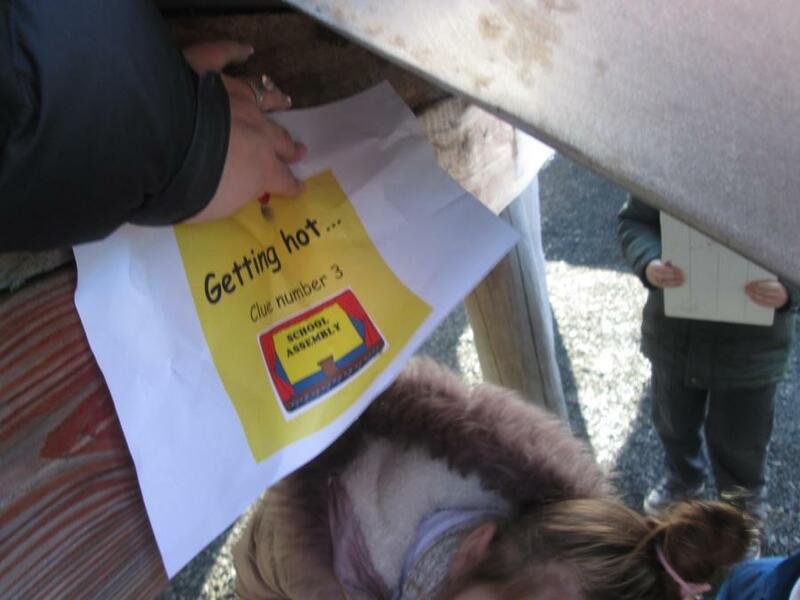 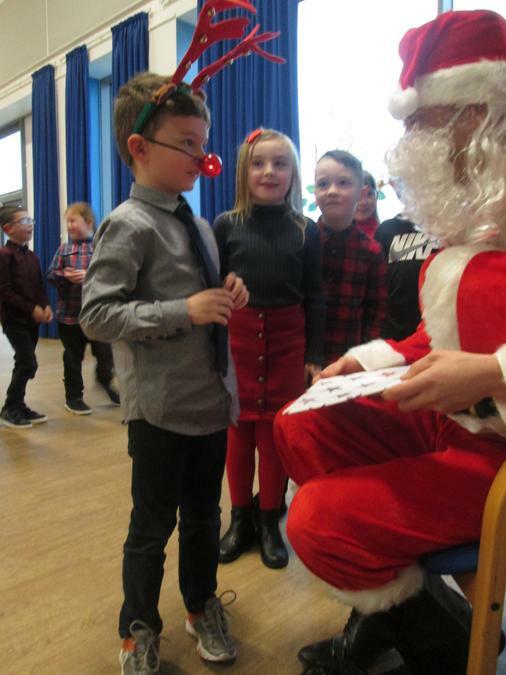 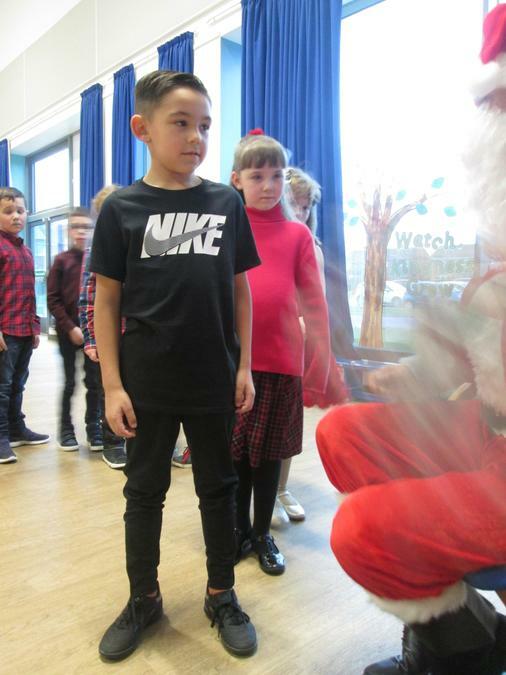 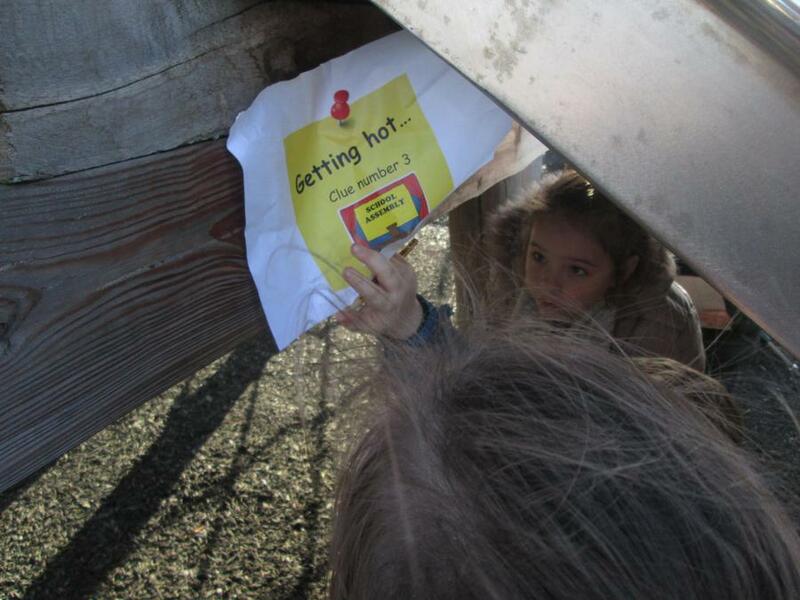 We couldn't believe our eyes and we quickly followed the clues. 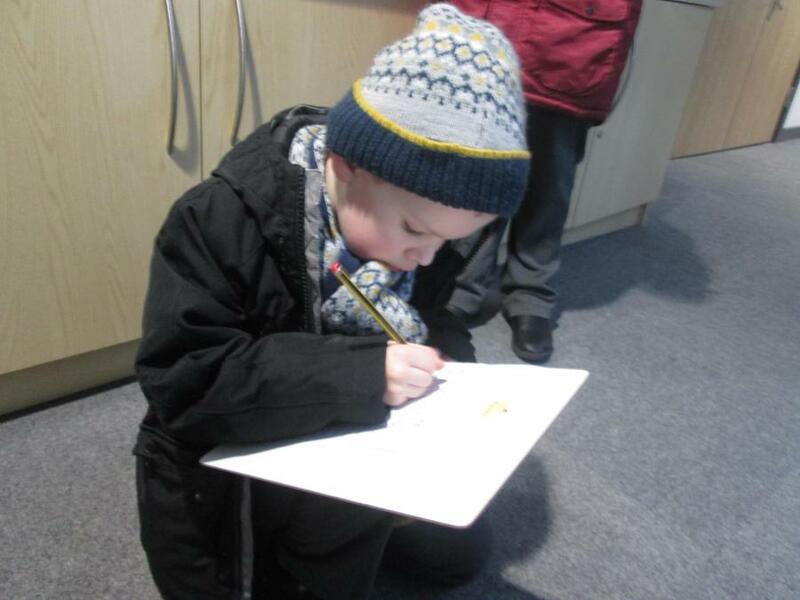 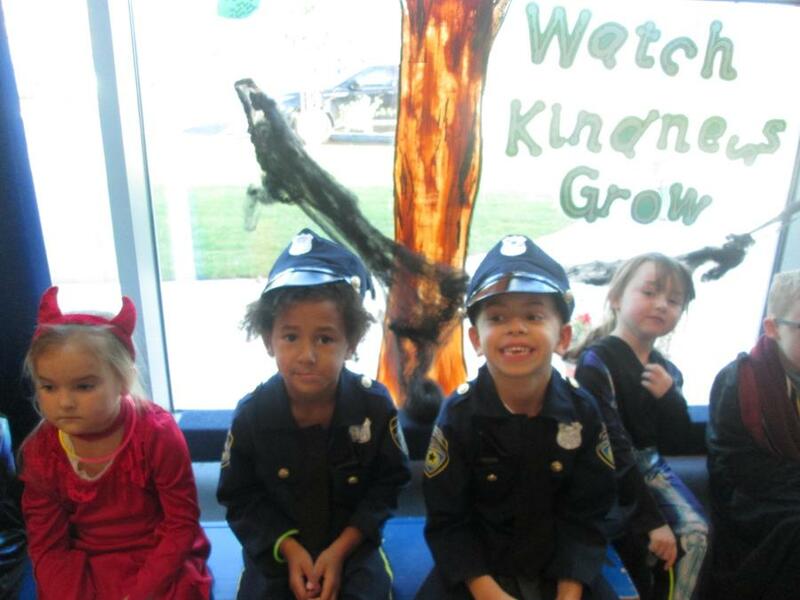 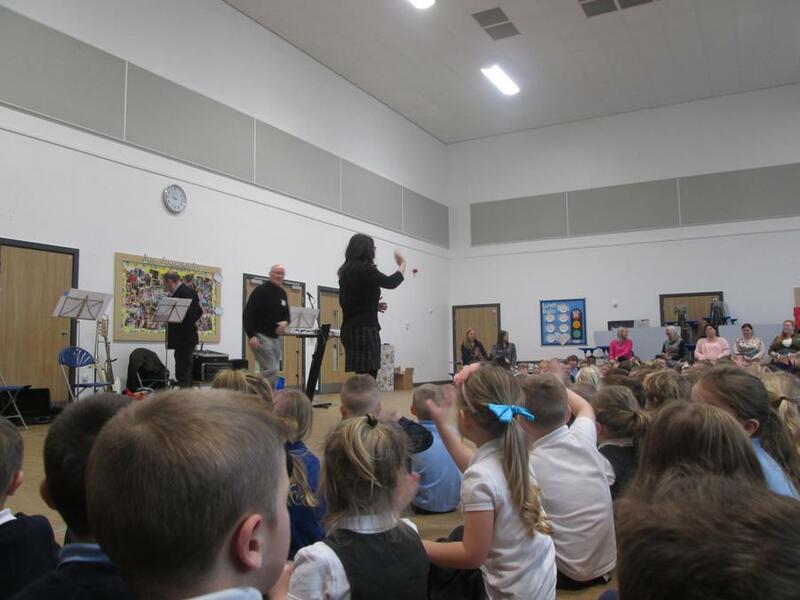 Take a look at the photos of our adventures today! 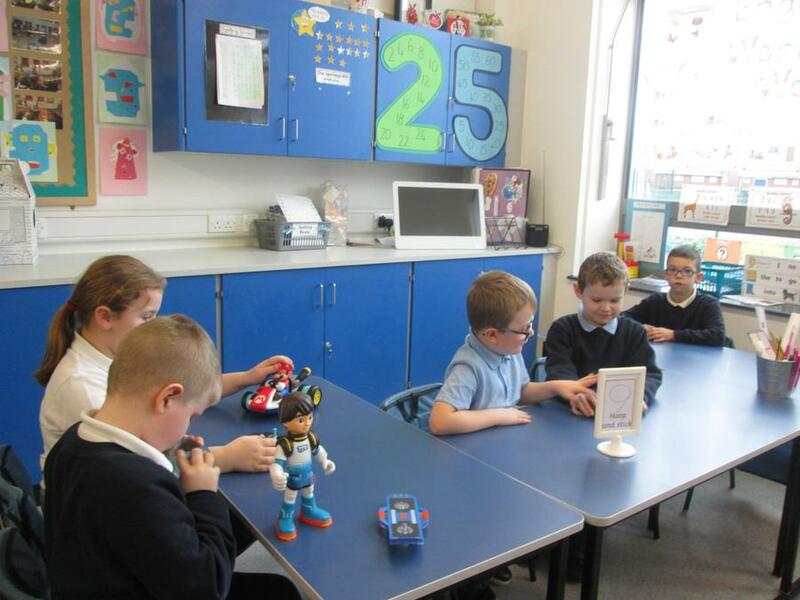 This afternoon we continued our discussions about toys throughout history. 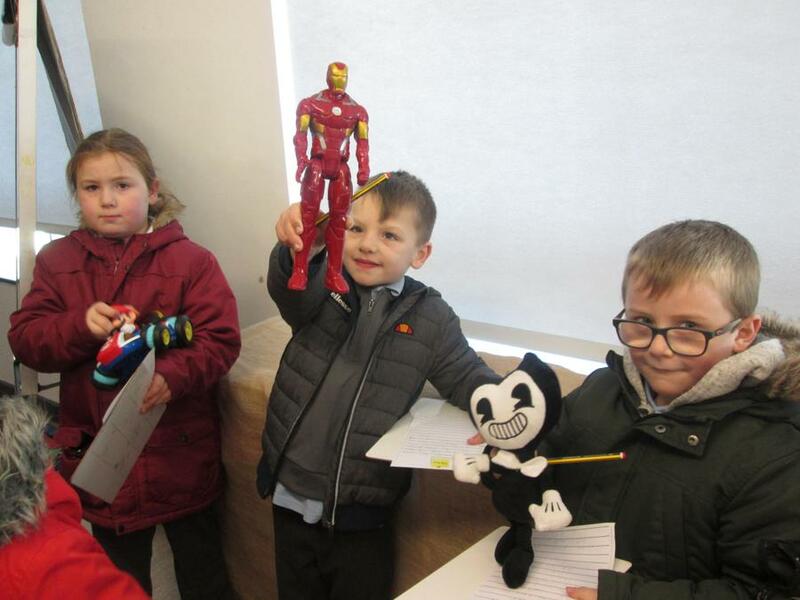 We created our own timeline of toys looking closely at the years that they were created. 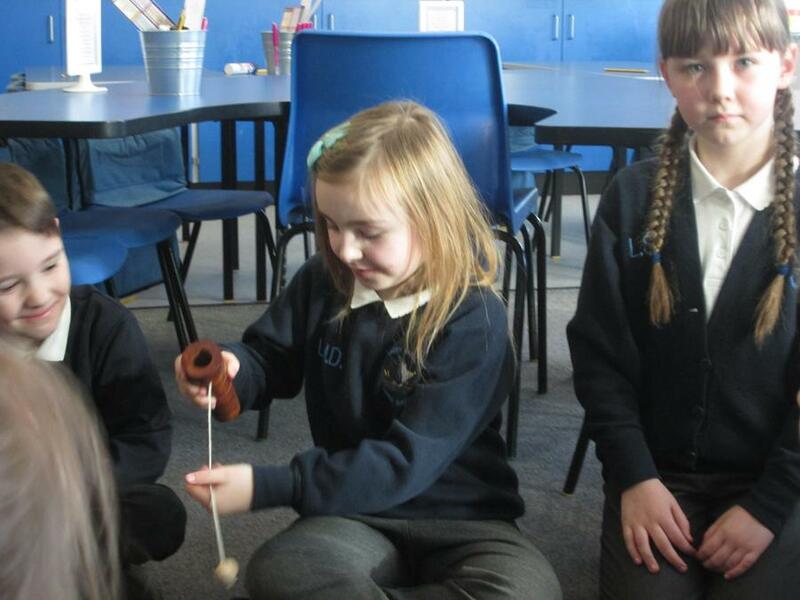 We were surprised to find out some toys that we still use now were created a very VERY long time ago! 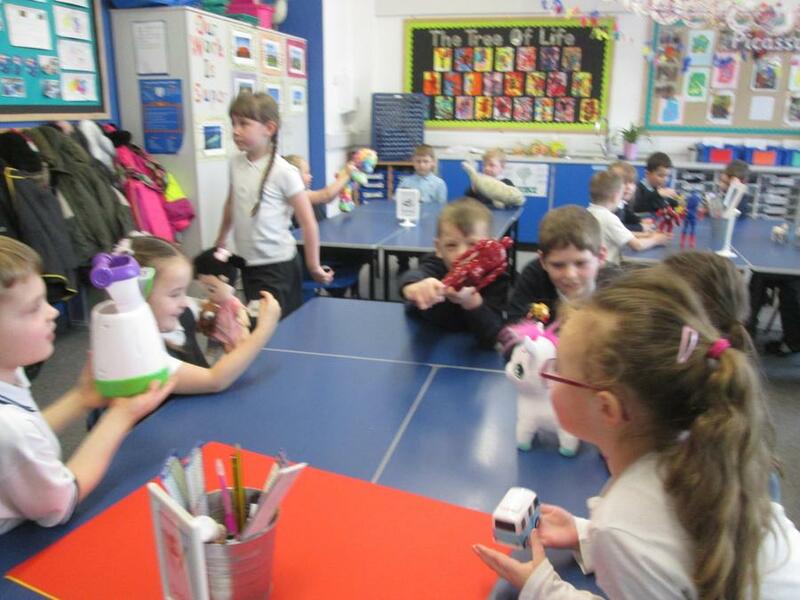 Explaining how our toys are used! 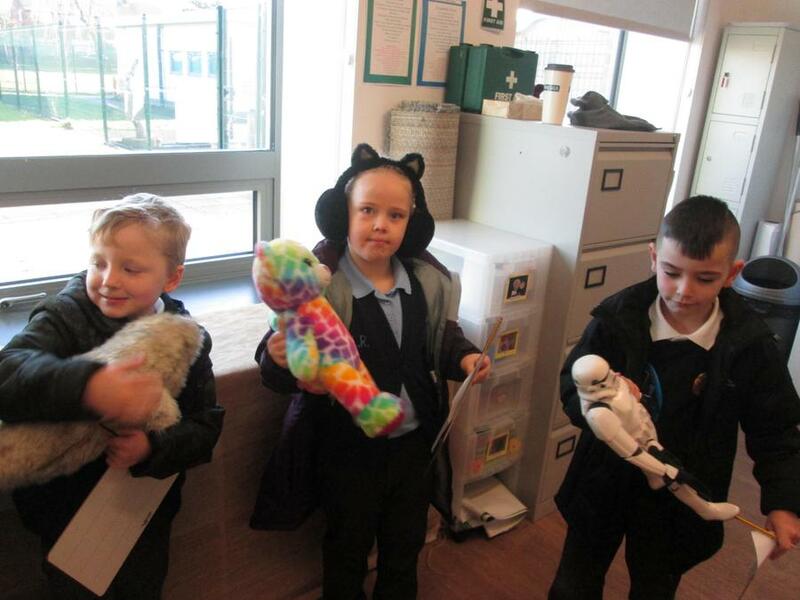 This half term we are learning about changes to toys throughout history. 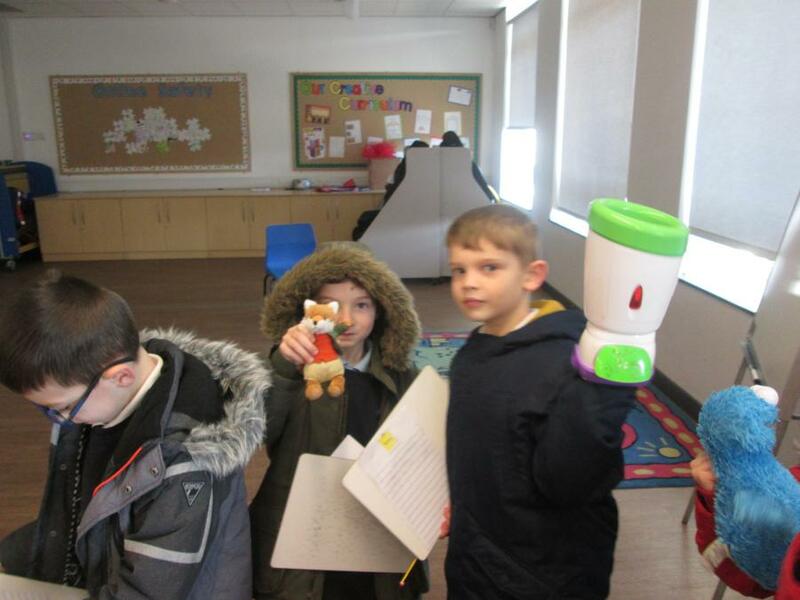 to start out topic off we brought our own toys into school from home and talked about them with the rest of the class. 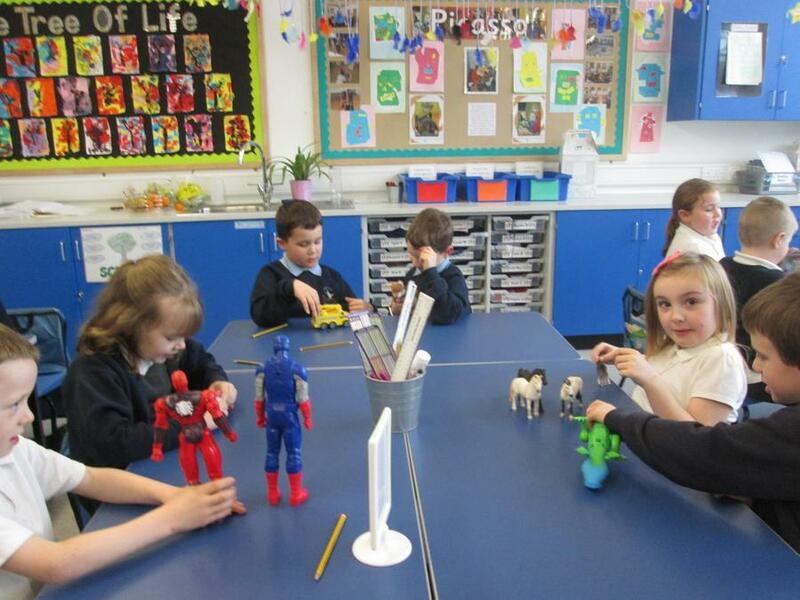 We talked about what our toys are made out of, how they work, how we play with them and what it is that we like best about them. 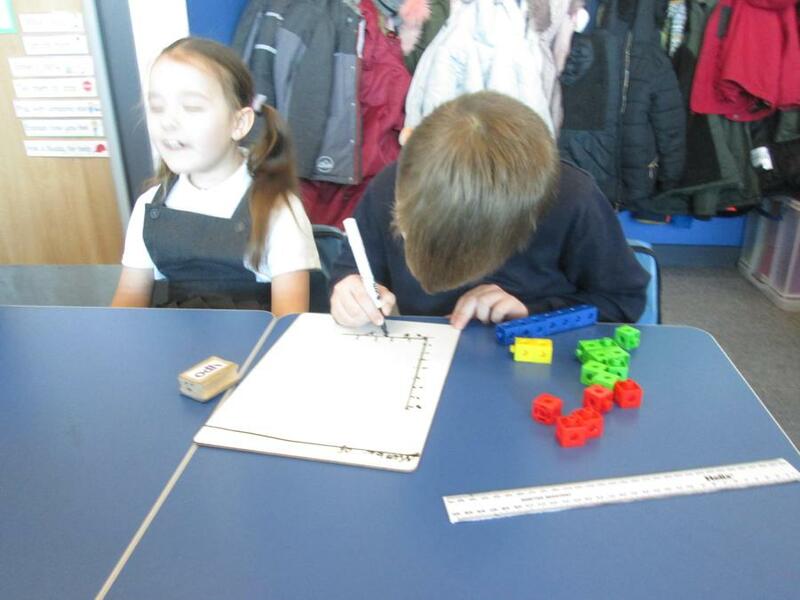 Later we wrote our own descriptions to match our toys. 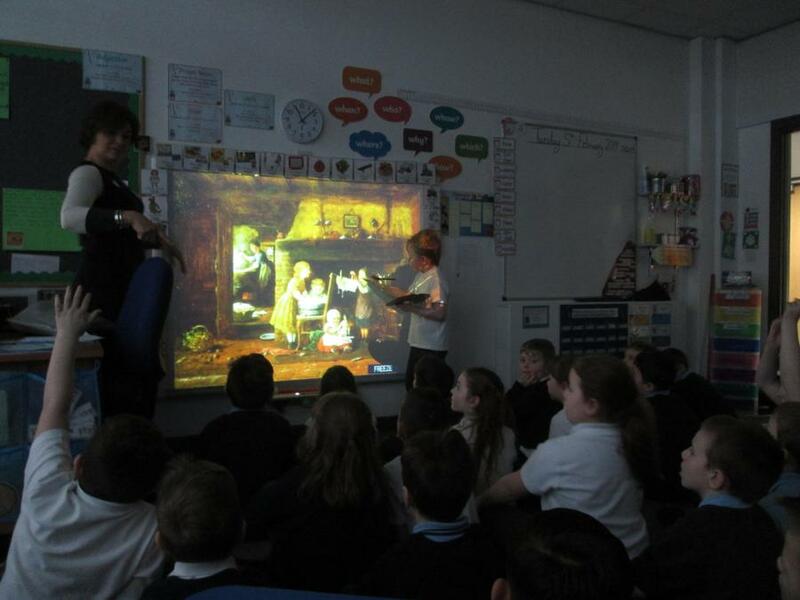 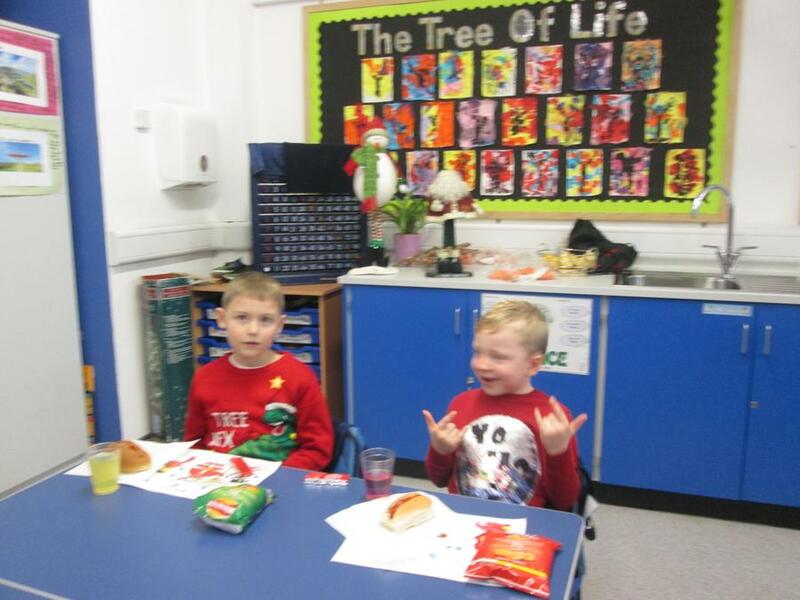 We really enjoyed todays lesson! 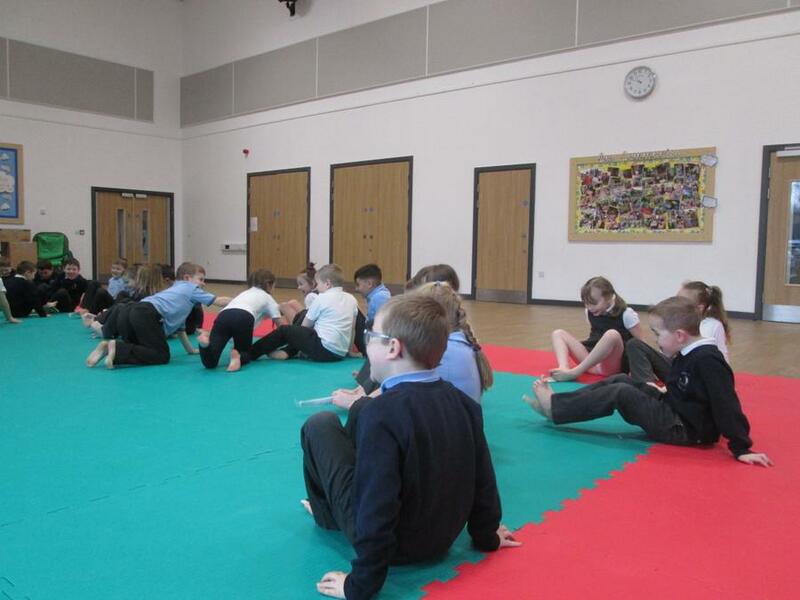 This morning we had a great time working with Peter. 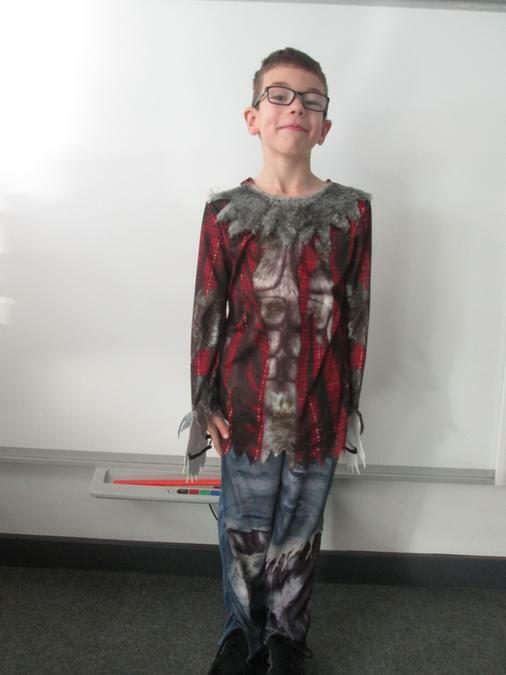 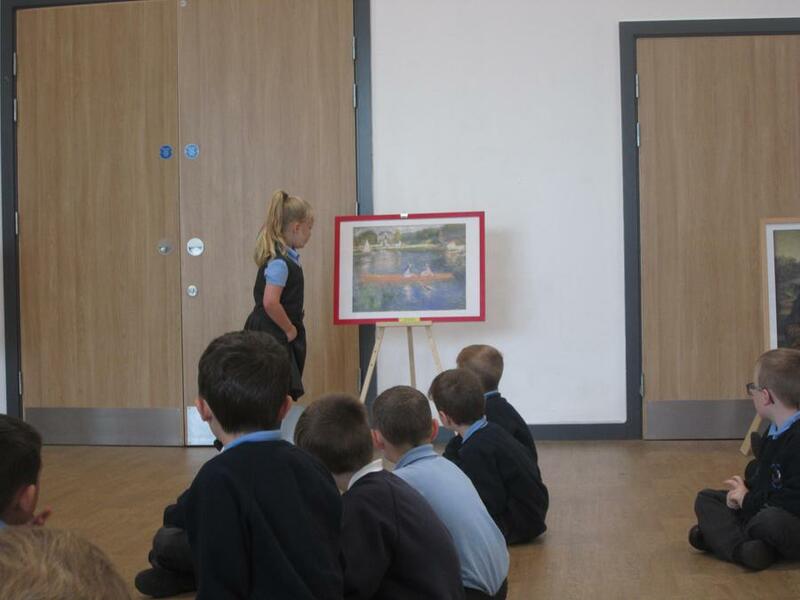 He had brought some art work into school to share with us. 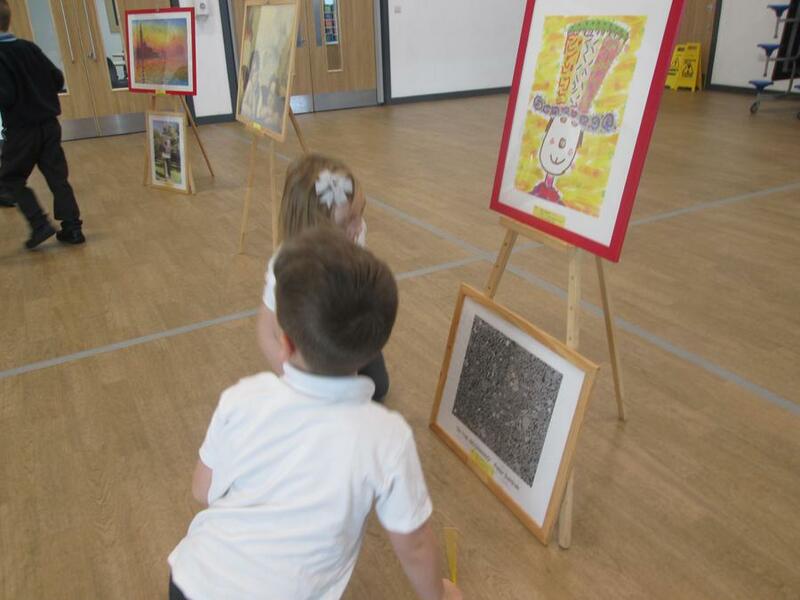 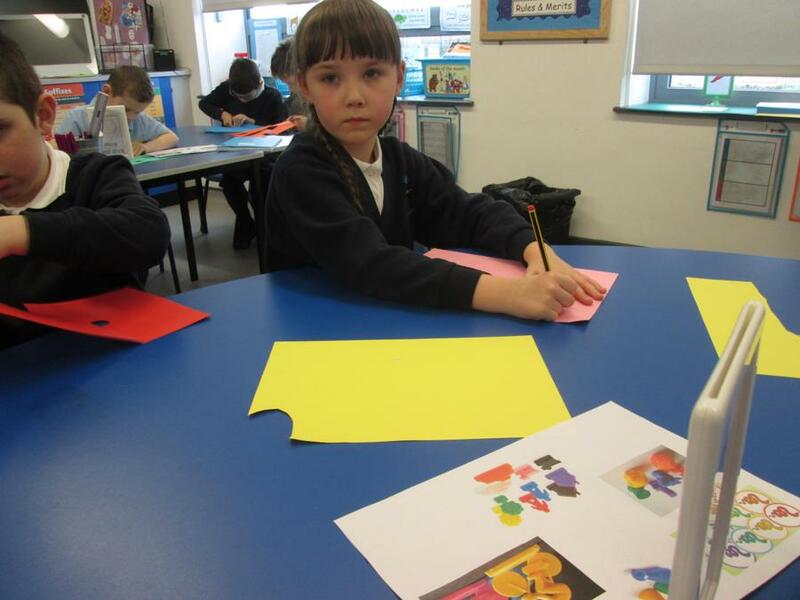 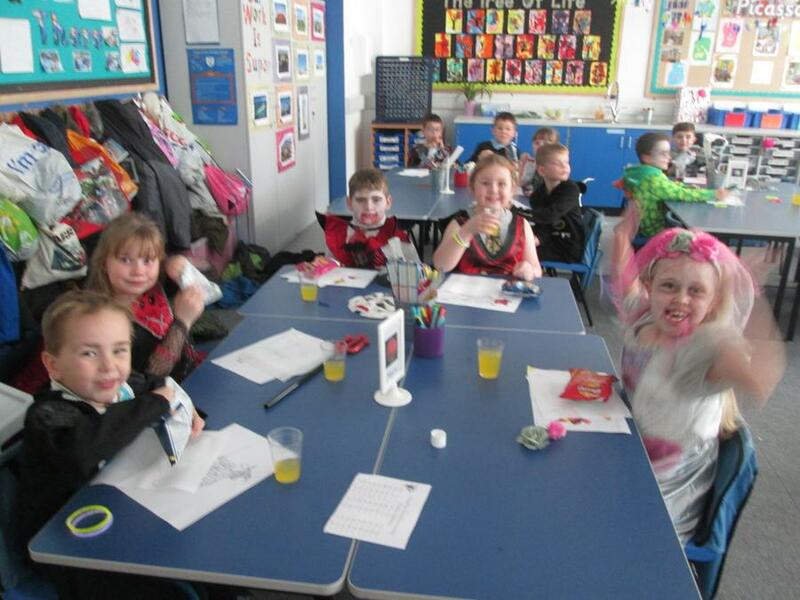 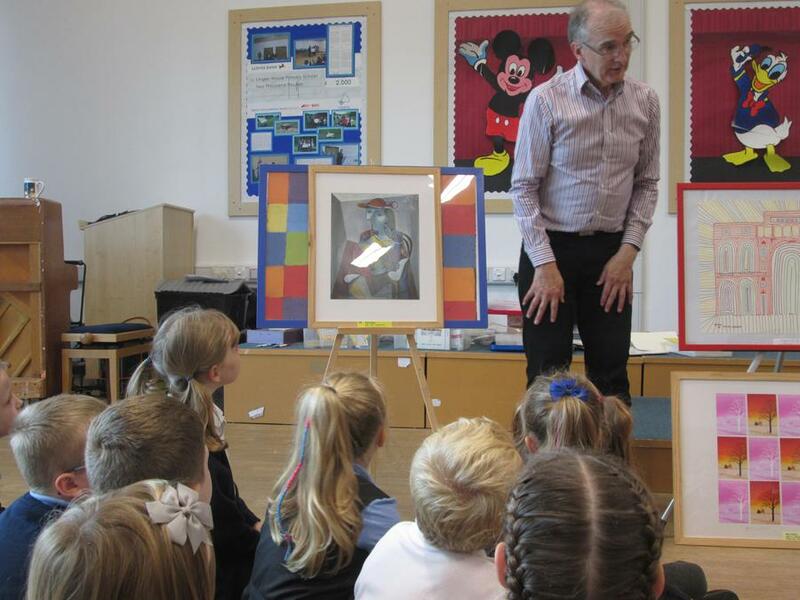 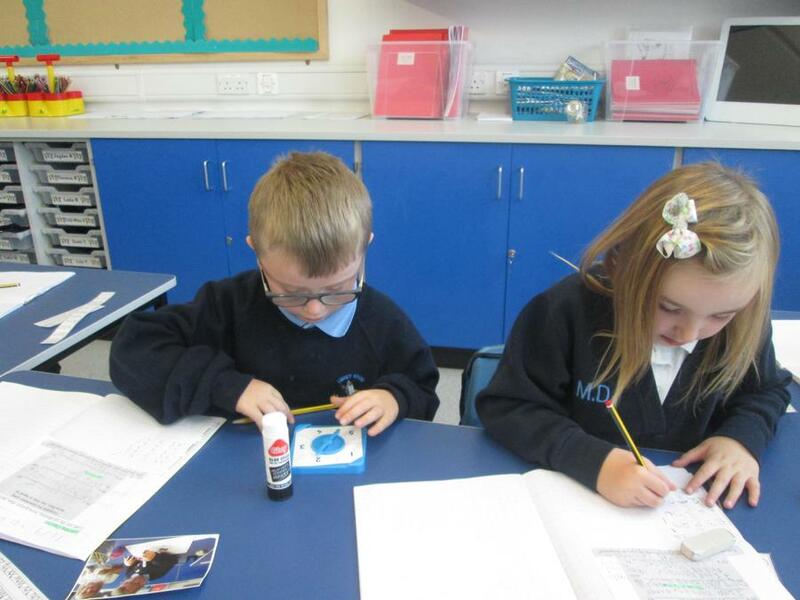 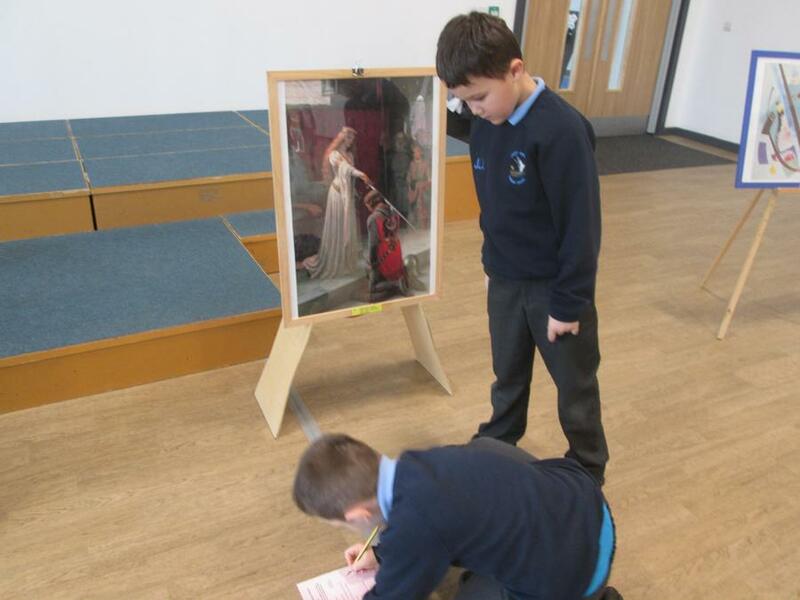 We had a great treasure hunt to make us look closely at the paintings and then we created our own portraits in the style or Picasso using coloured paper. 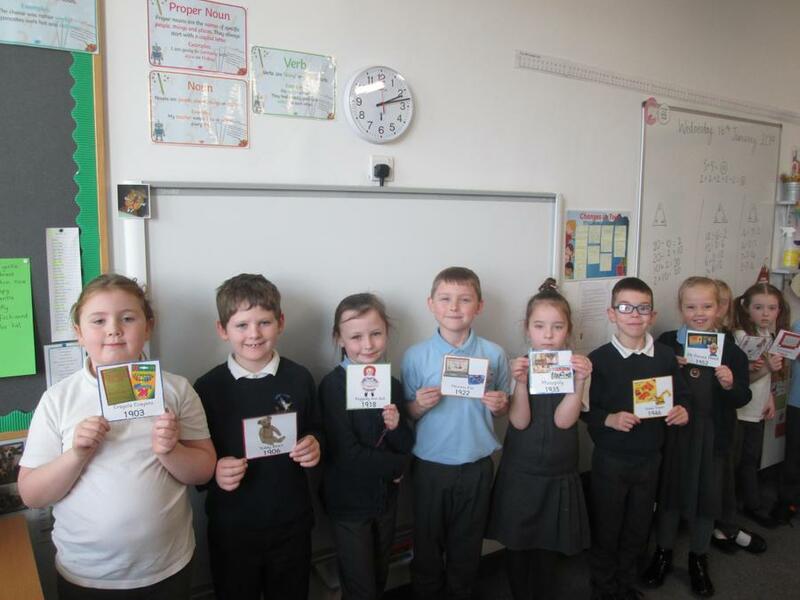 We had a great morning and loved our finished products! 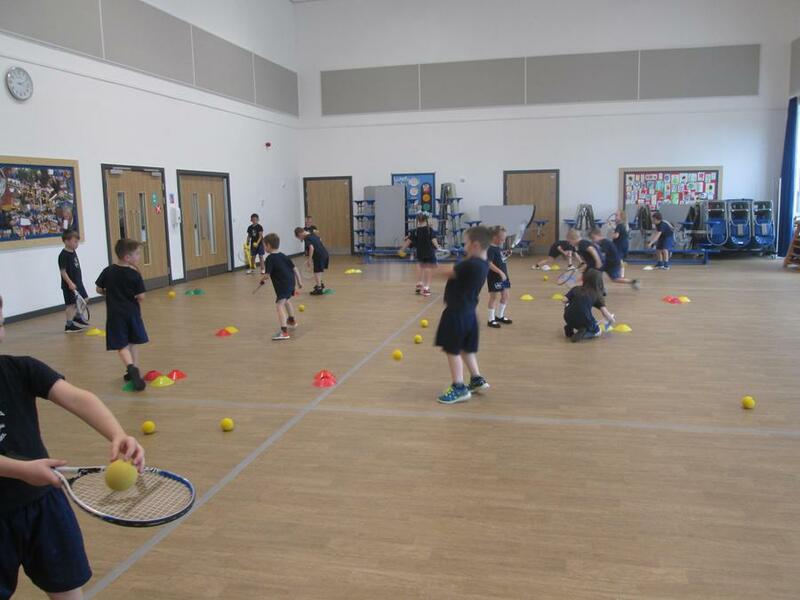 Today we had our first PE lesson with our tennis coach Jonathan. 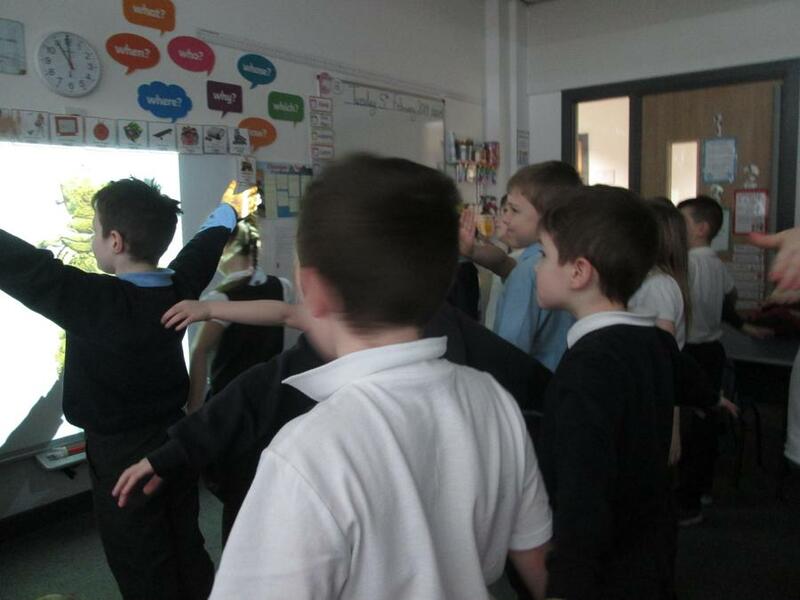 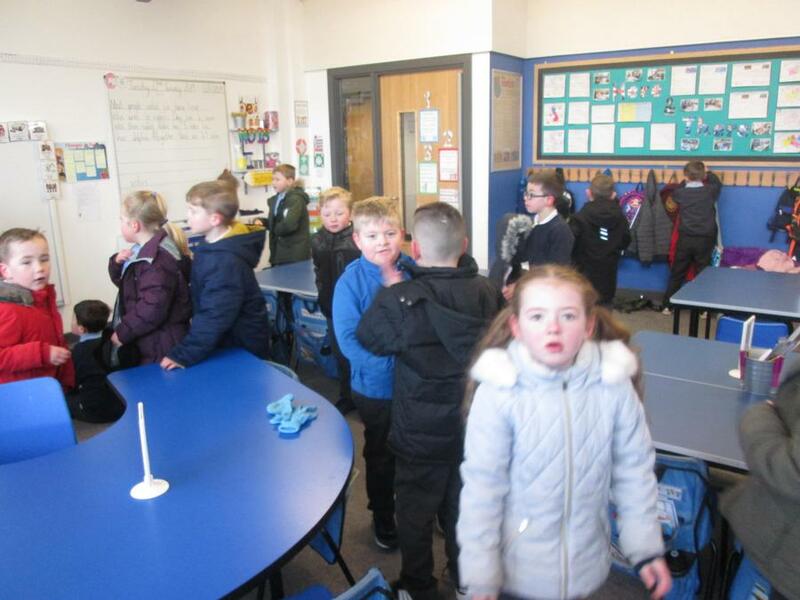 He showed us how to warm our bodies up and to move safely around the room. 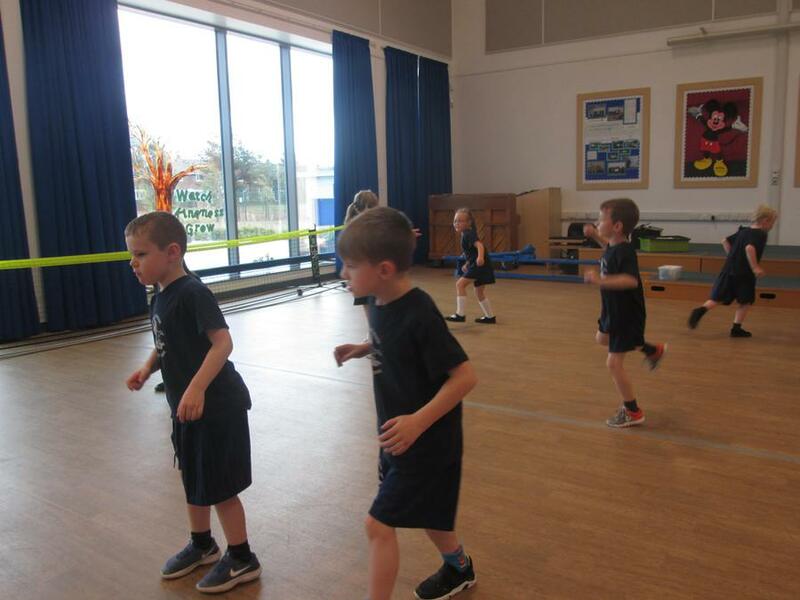 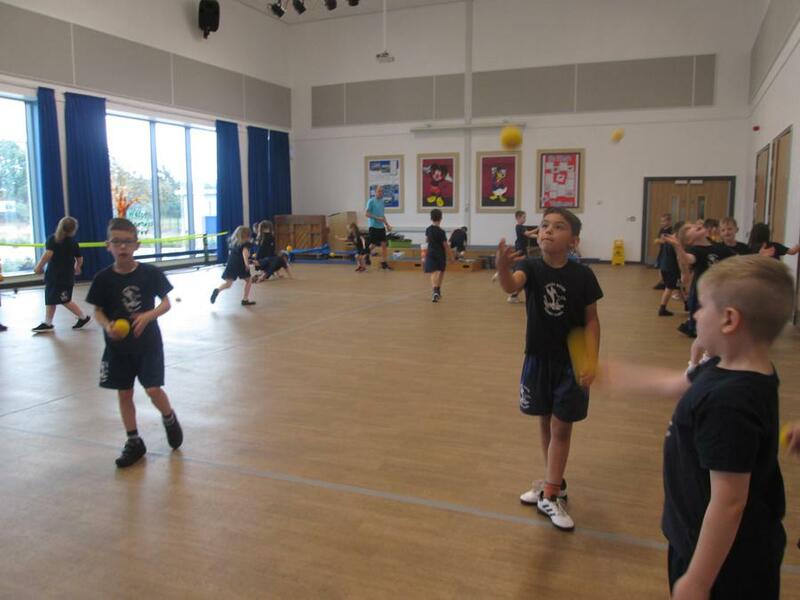 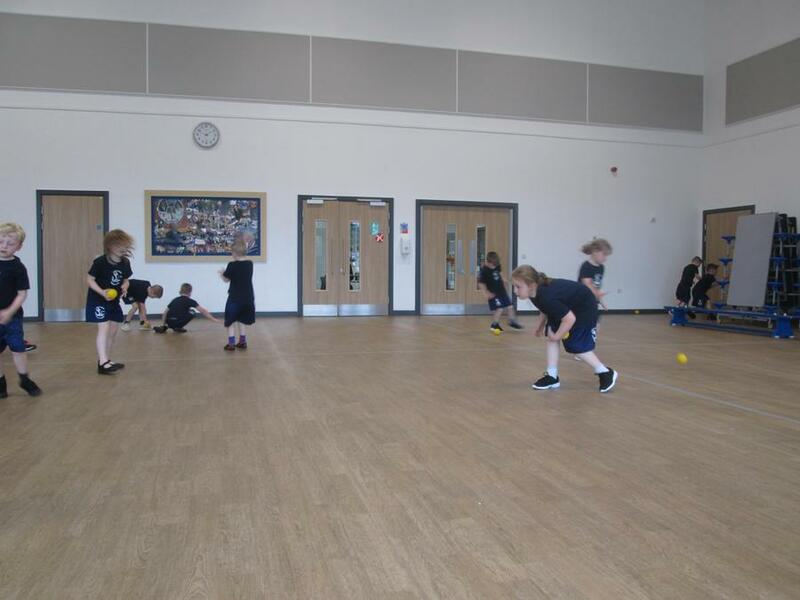 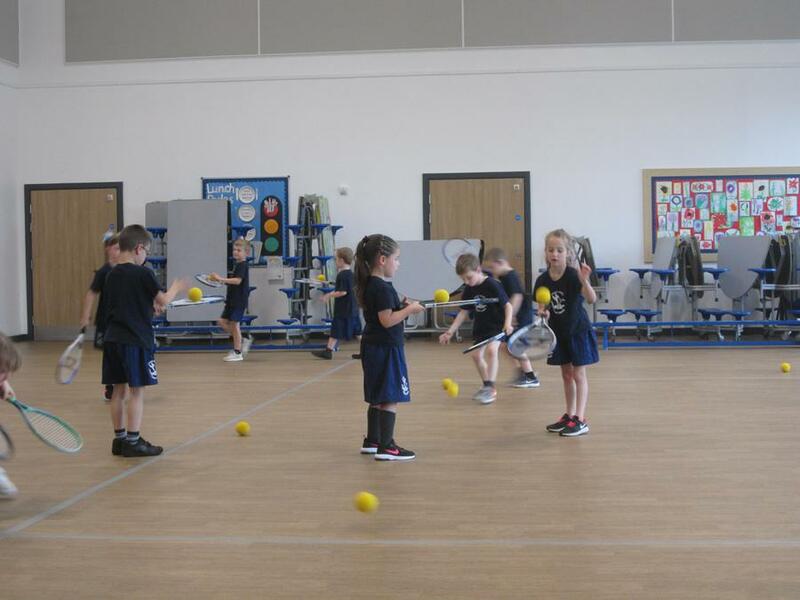 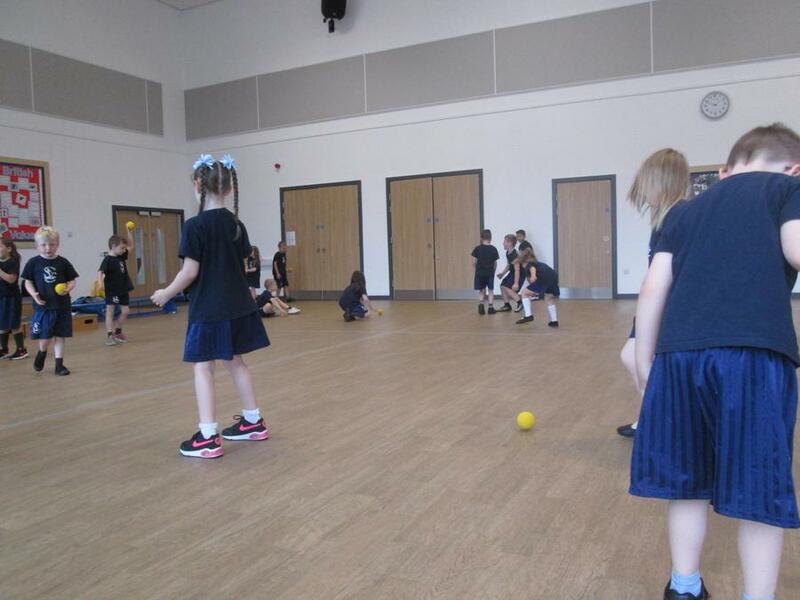 We learned all about the 'ready position' and began working with a sponge tennis ball. 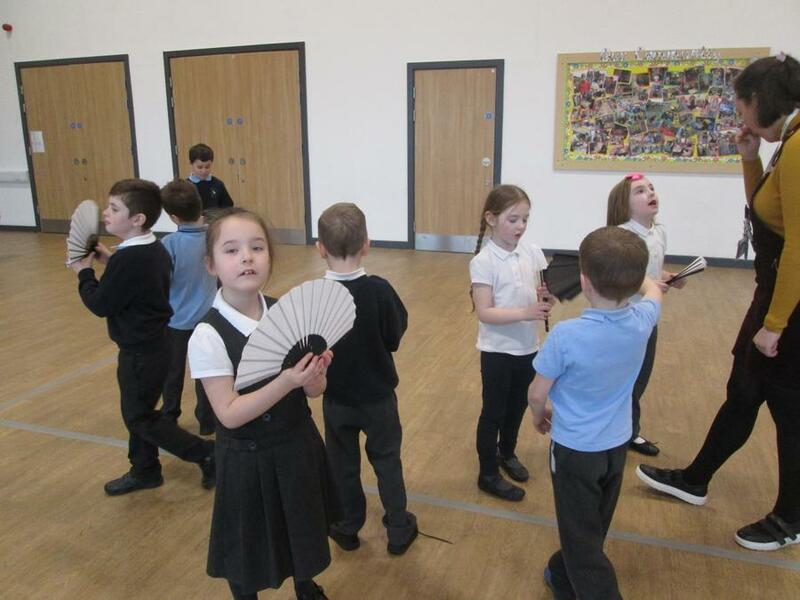 We had so much fun learning all of the different catches that we could do. 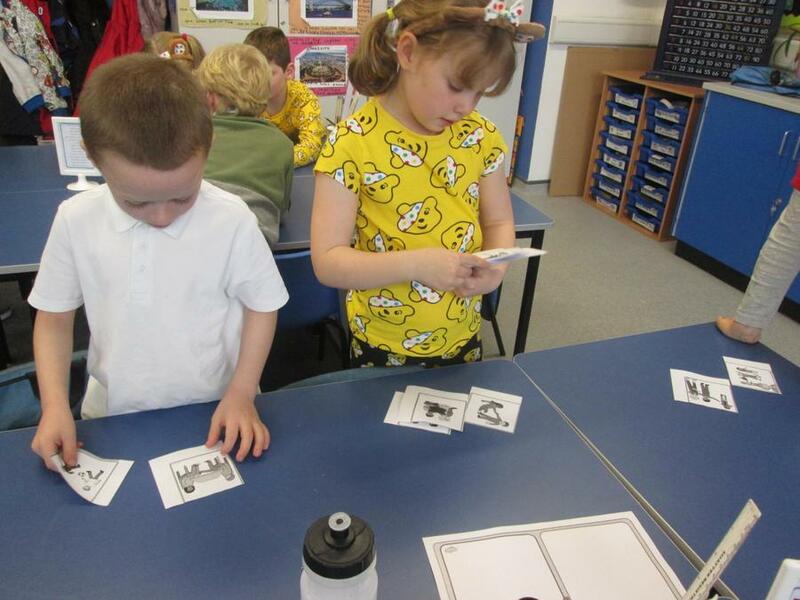 I wonder what we will learn next week! 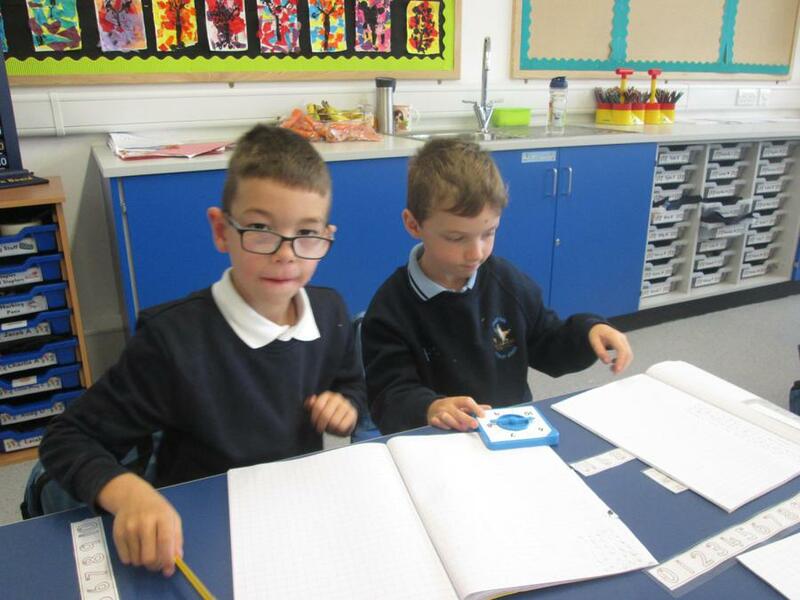 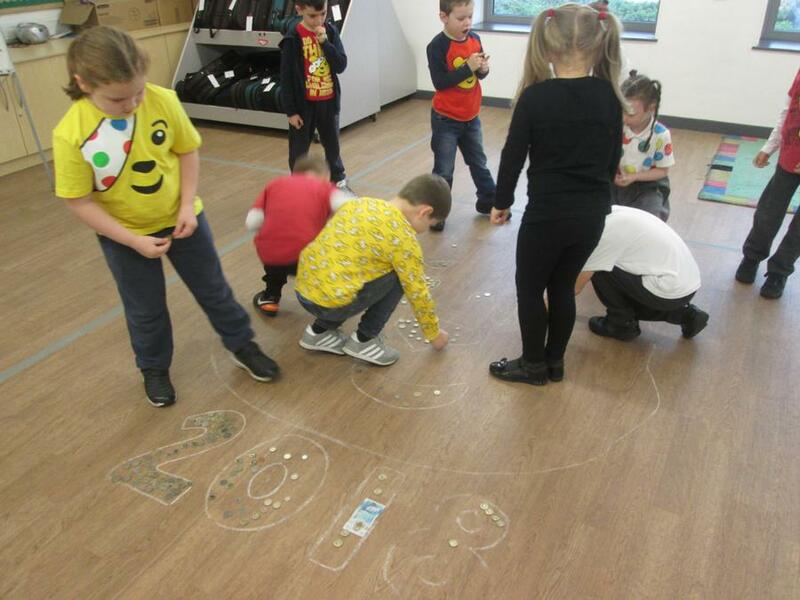 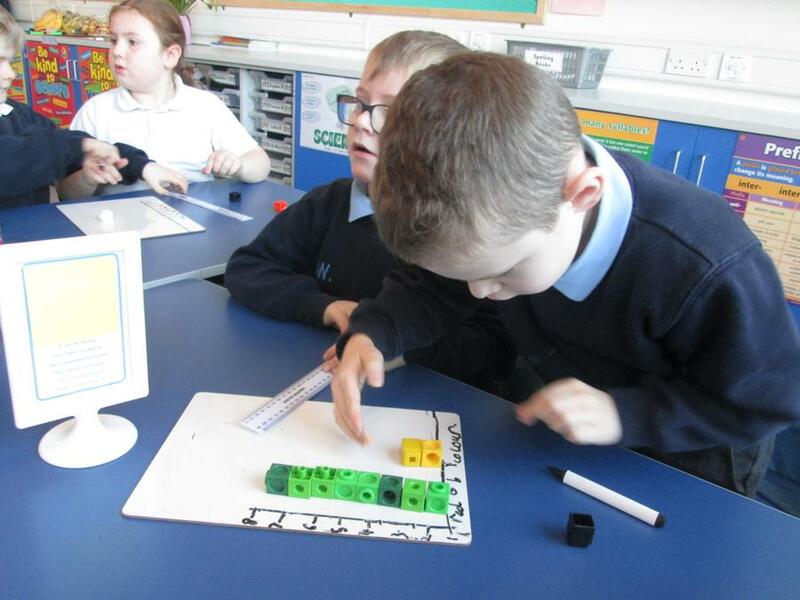 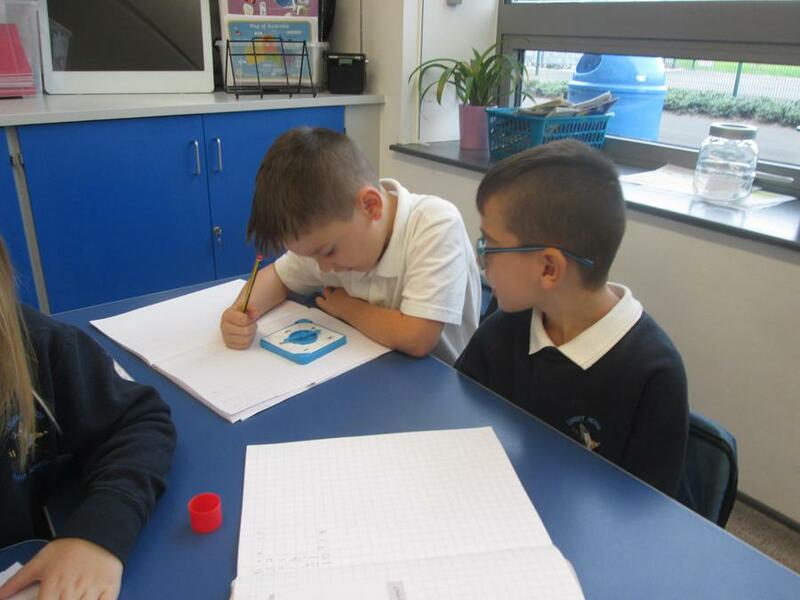 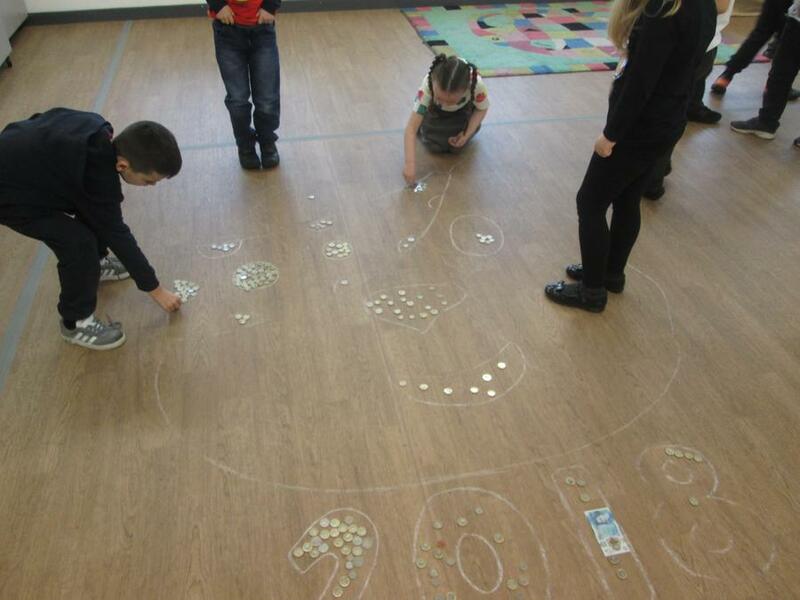 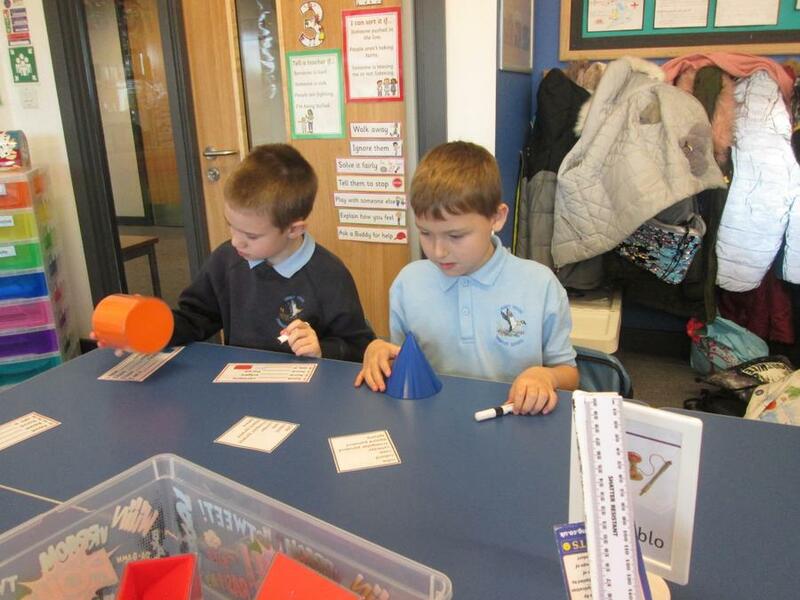 This morning in maths we worked with spinners to create two digit numbers. 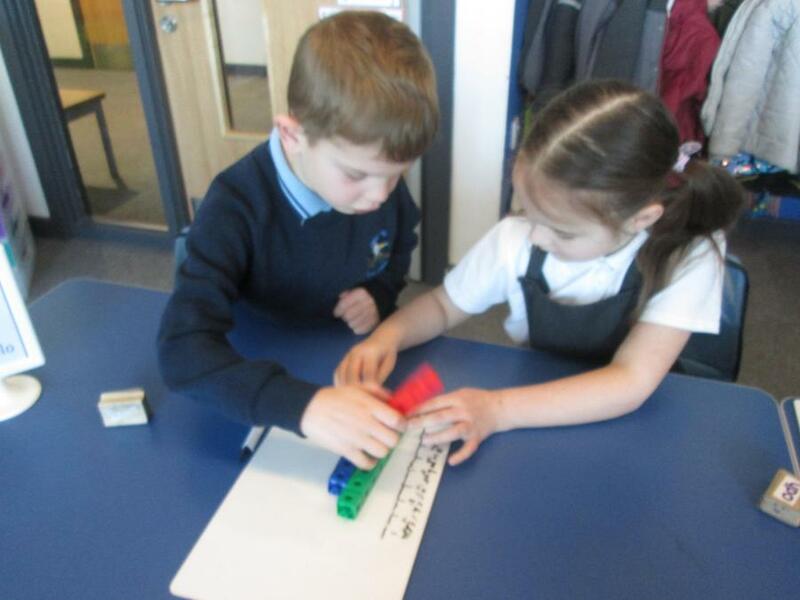 Next talked about how we could partition the number using the vocabulary 'part number' and 'whole number'. 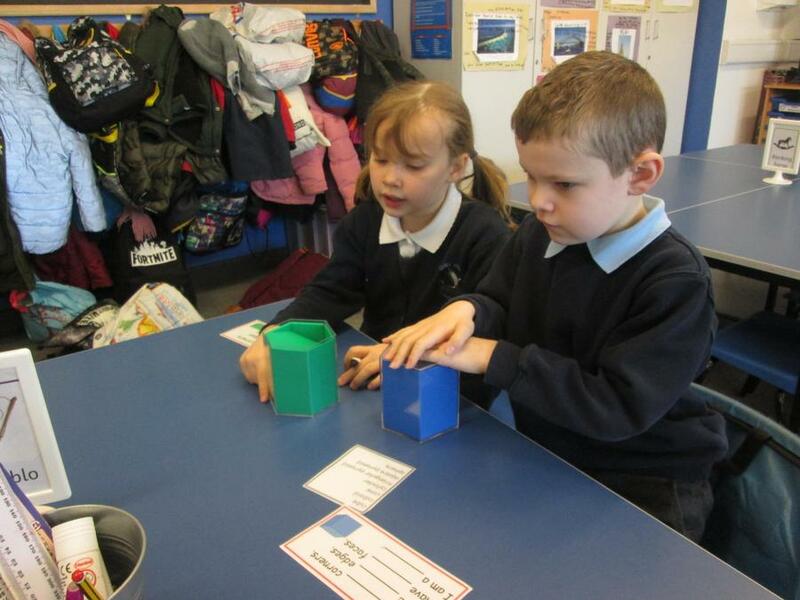 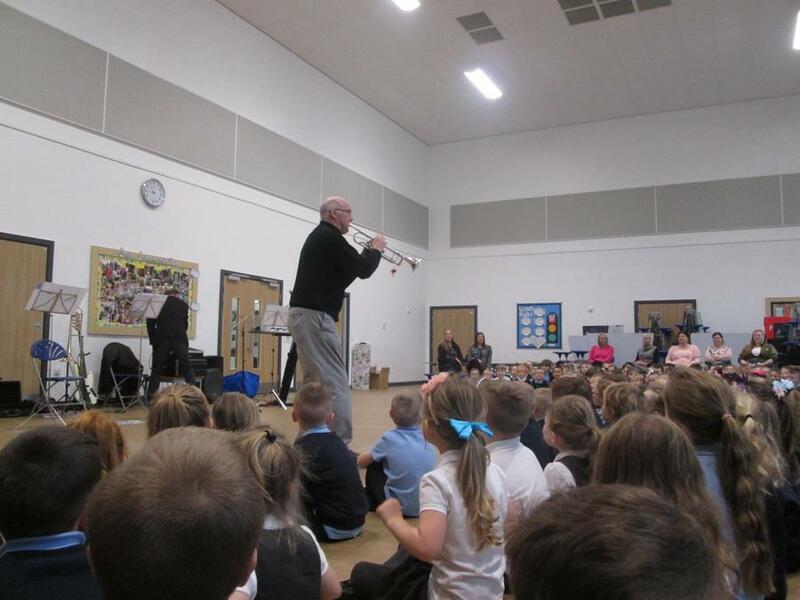 We really enjoyed this practical lesson! 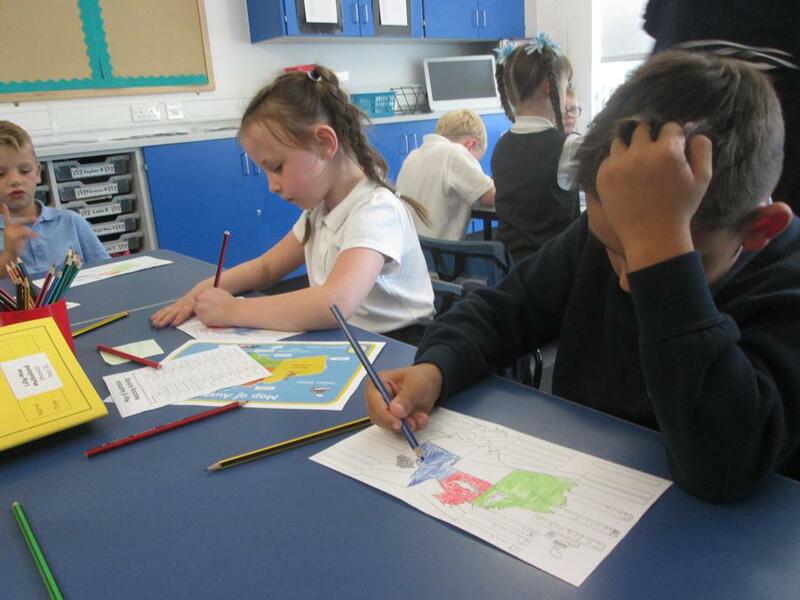 Today in our creative curriculum lesson we worked hard to create our own map of Australia. 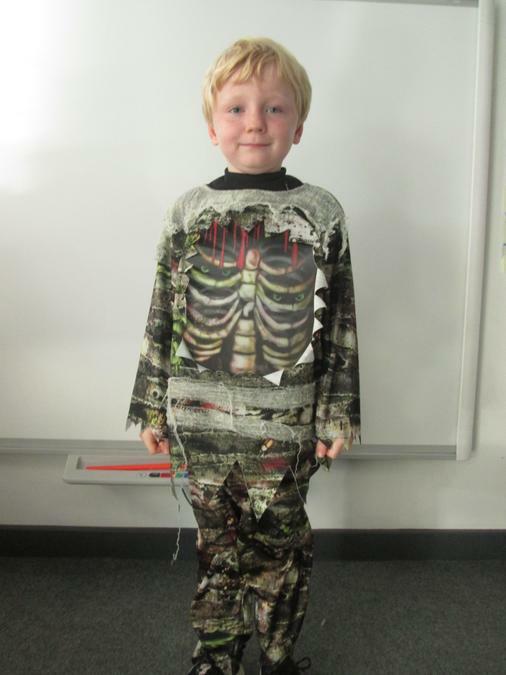 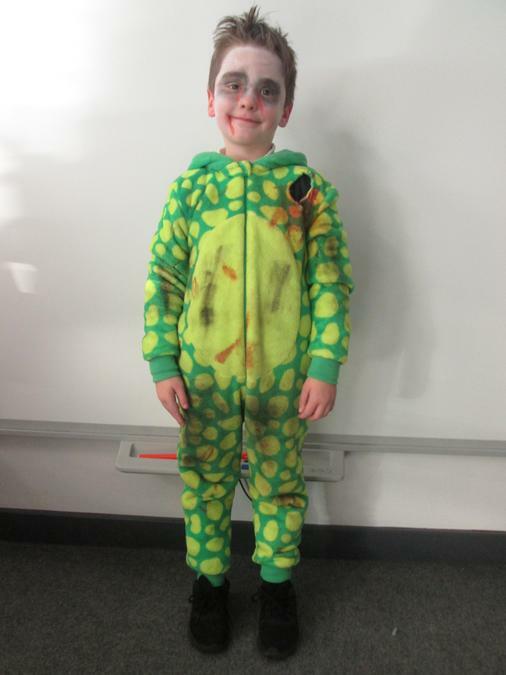 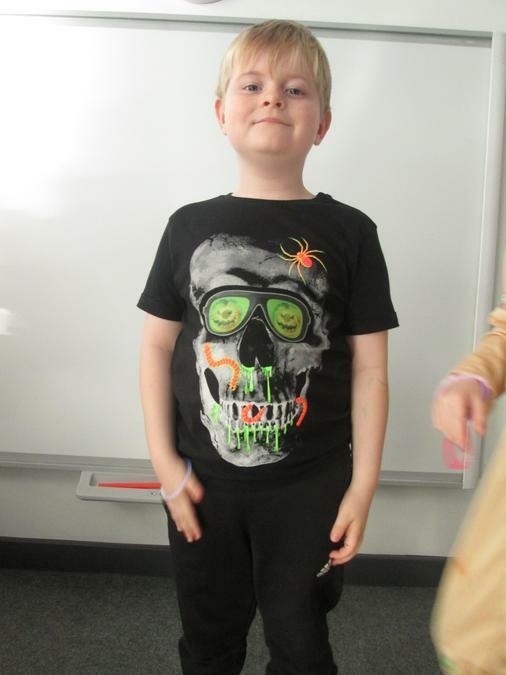 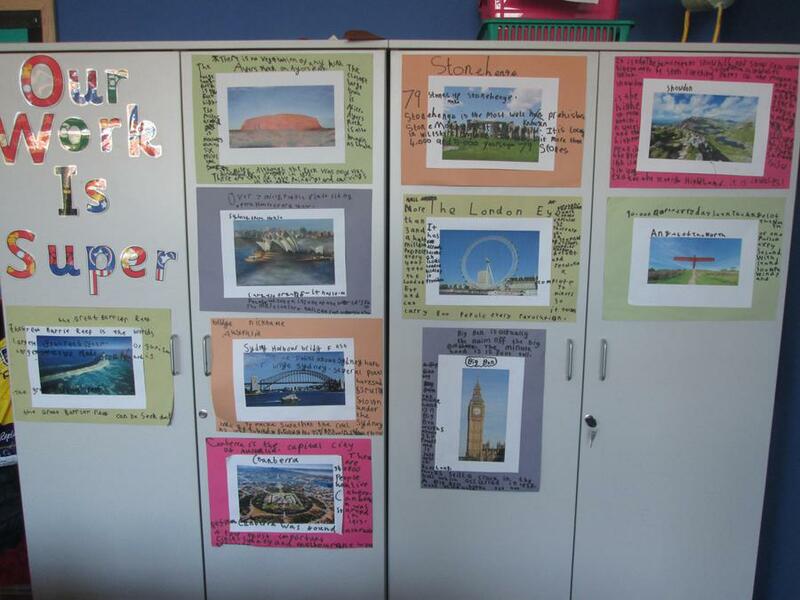 This half term we are going to be learning lots about Australia. 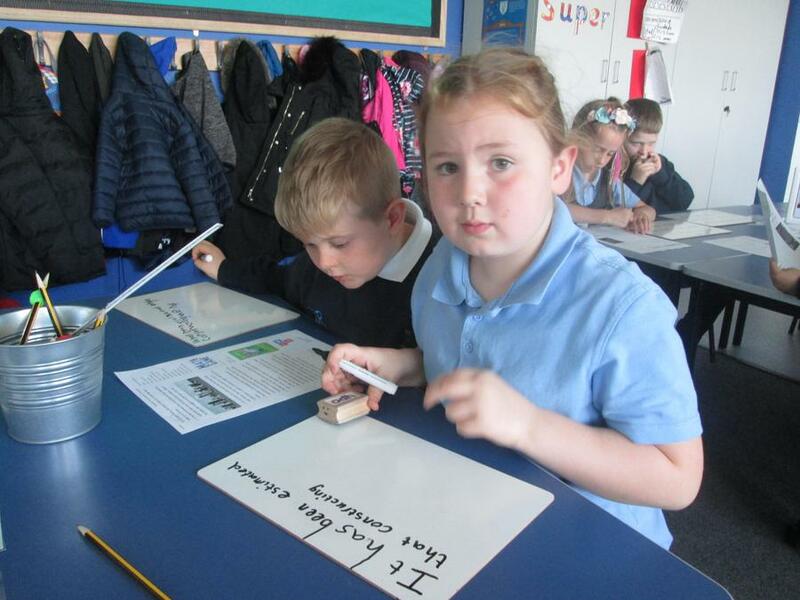 We enjoyed learning some of the names for different sections of land and ocean. 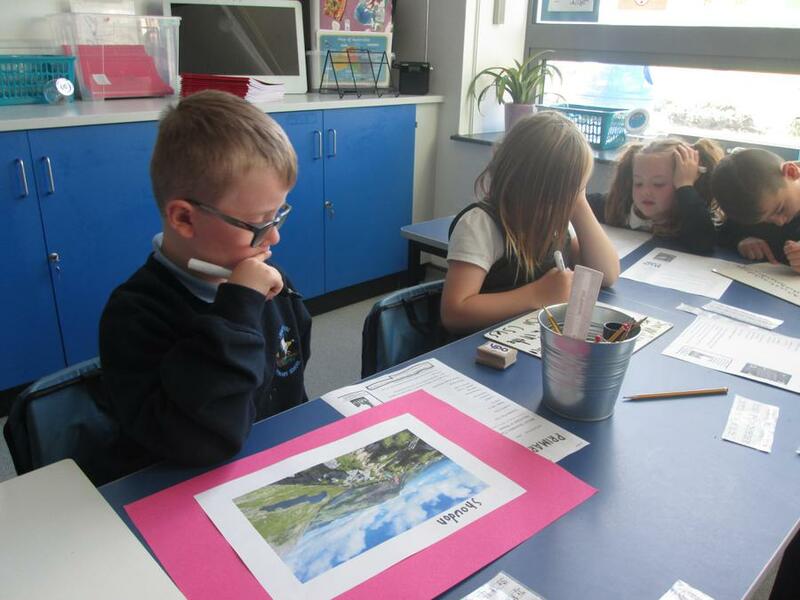 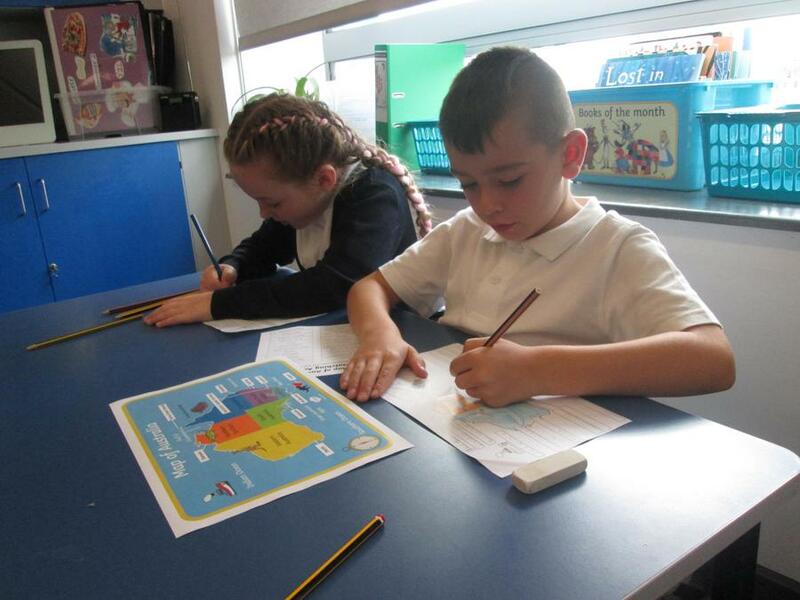 Today we worked in groups to create information posters all about some different locations in Australia and the UK. 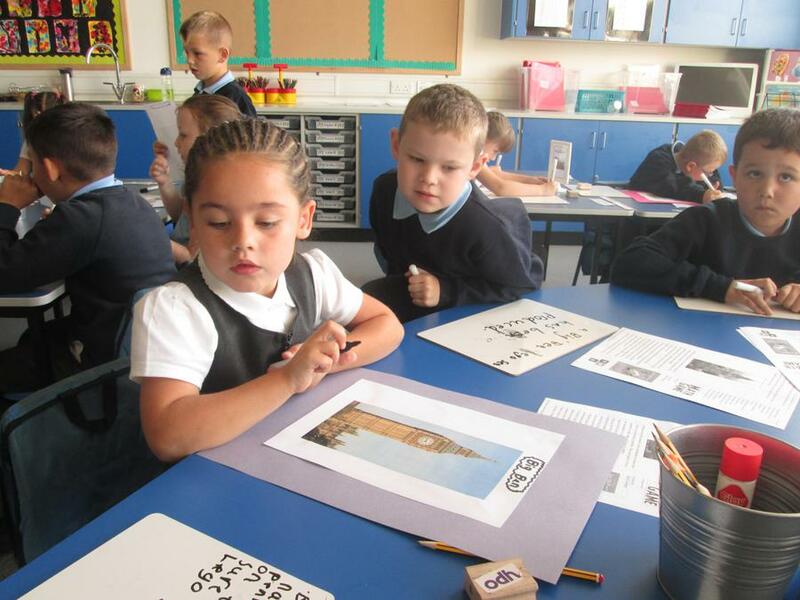 We worked on a different landmark and then enjoyed sharing the facts with the rest of the class. 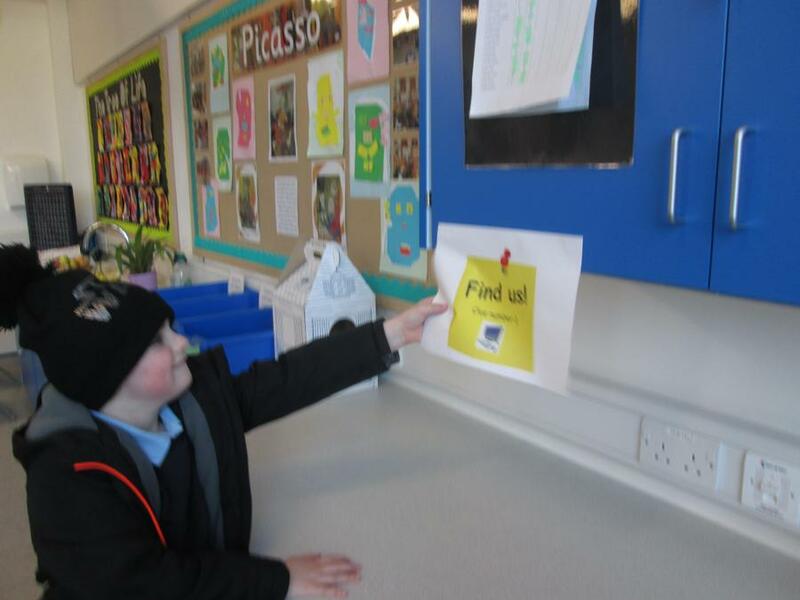 Our posters are on display in our classroom-come and see if we can teach you something new!